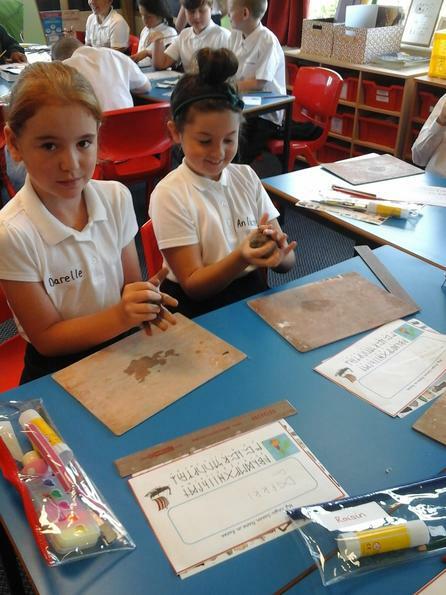 To begin our very first adventure of the new school year the children were introduced to two Anglo-Saxon children: Osmund and Hilda. 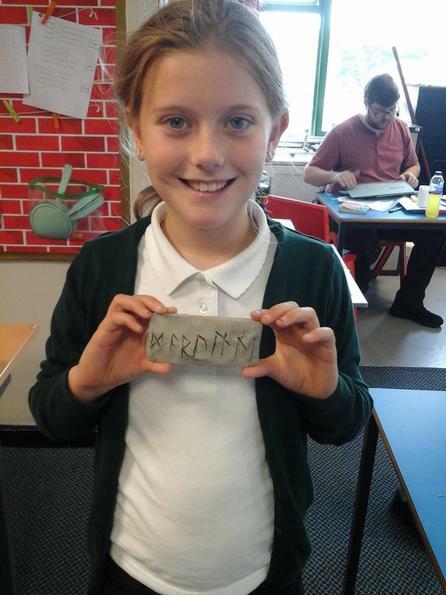 They are brother and sister living in Anglo-Saxon Britain in 793AD. 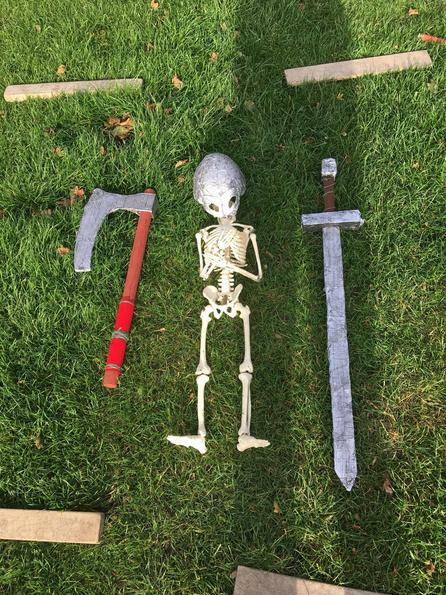 Osmund and Hilda agreed to show us all about their way of life, but first we had to become more like them. 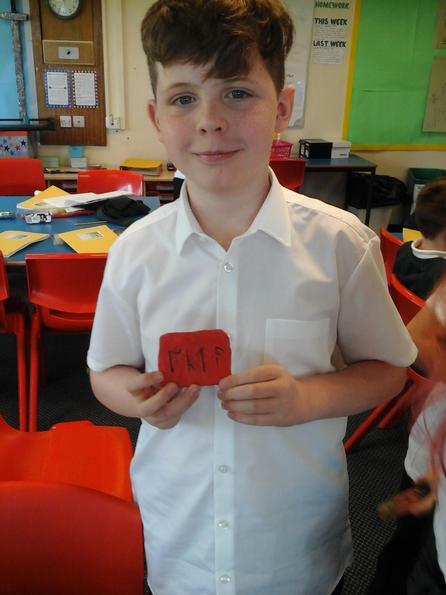 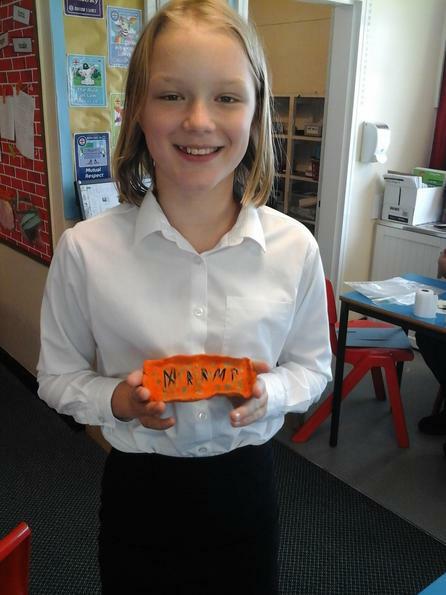 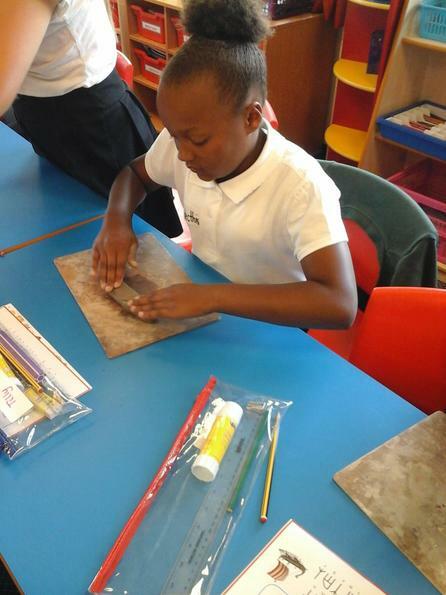 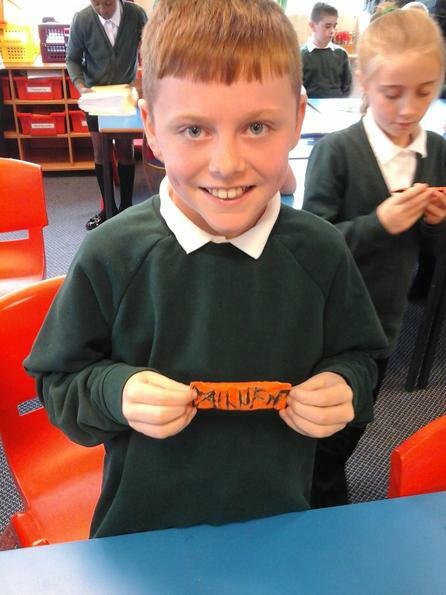 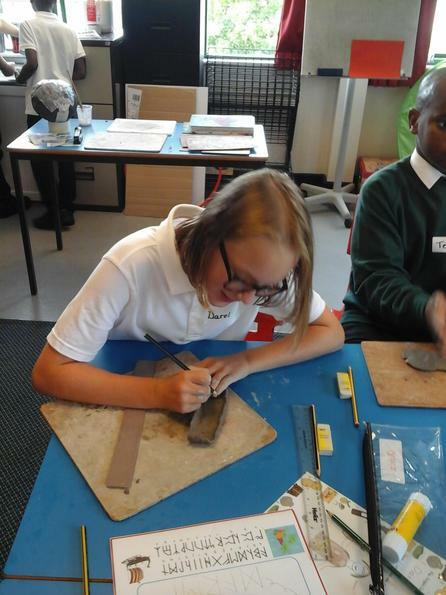 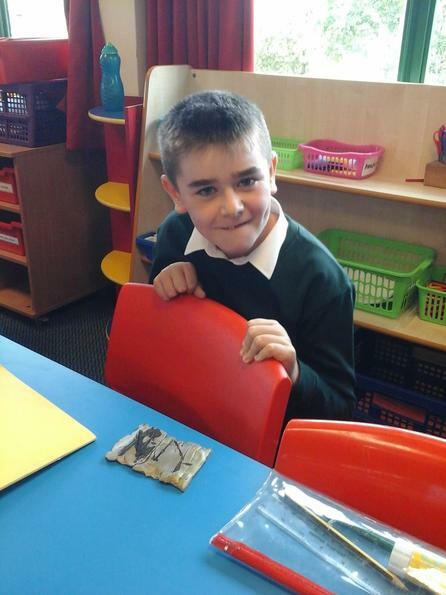 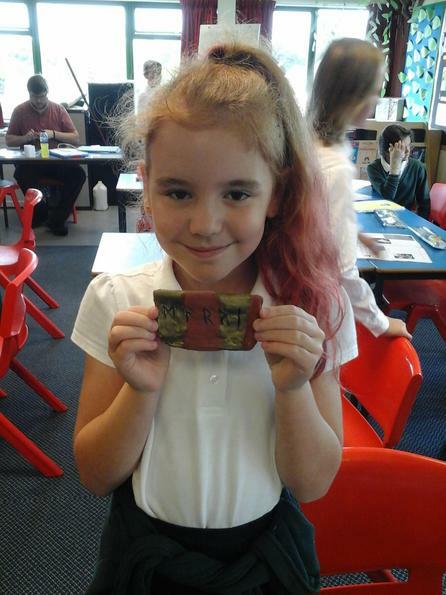 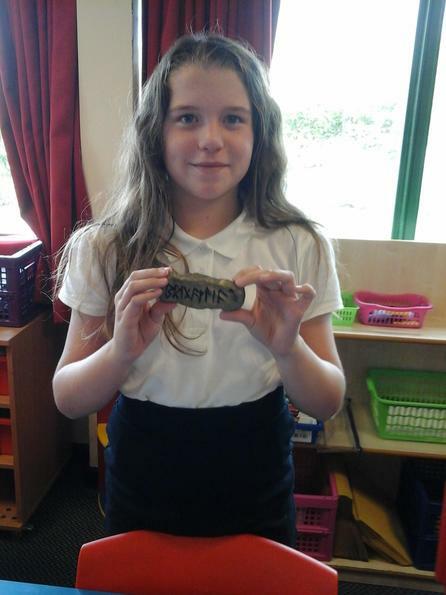 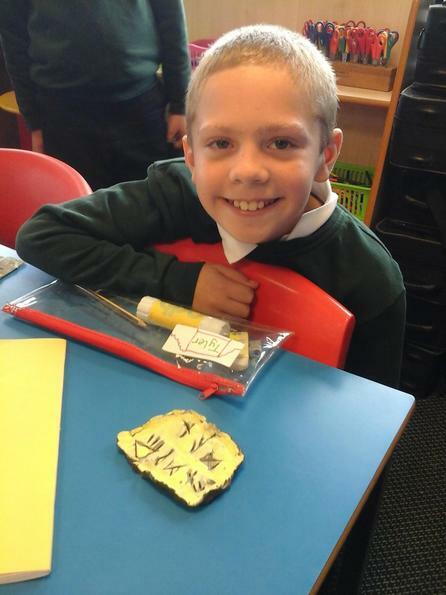 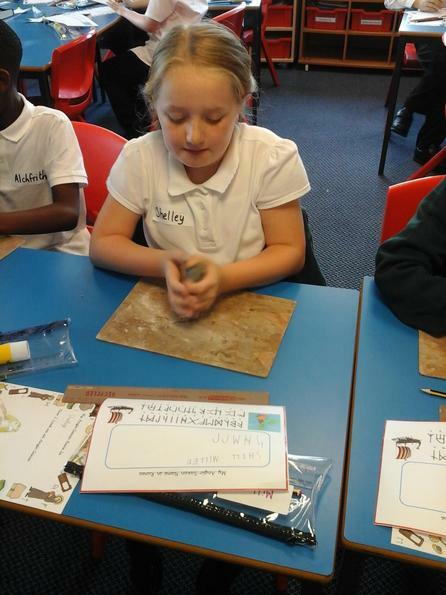 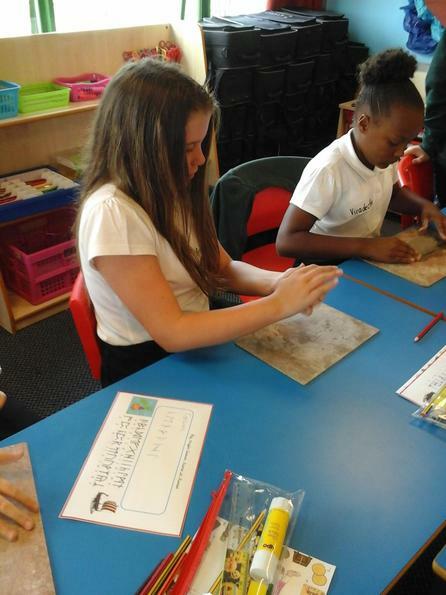 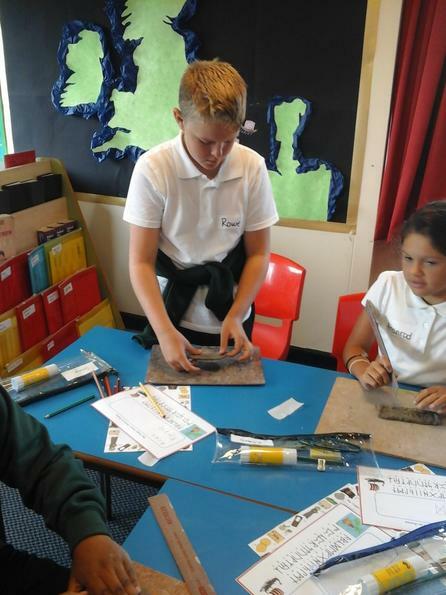 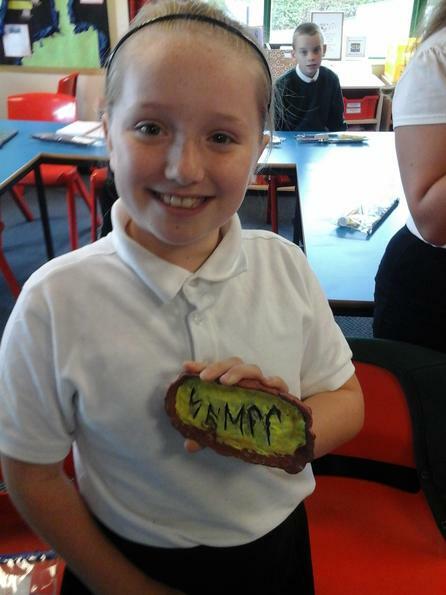 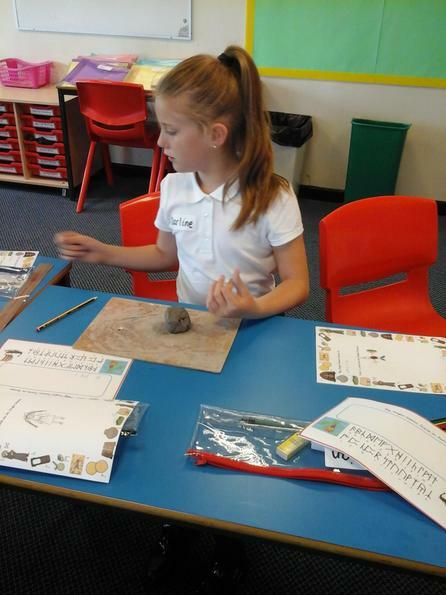 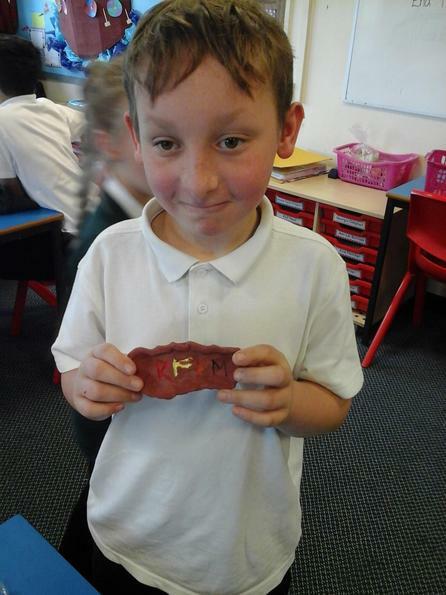 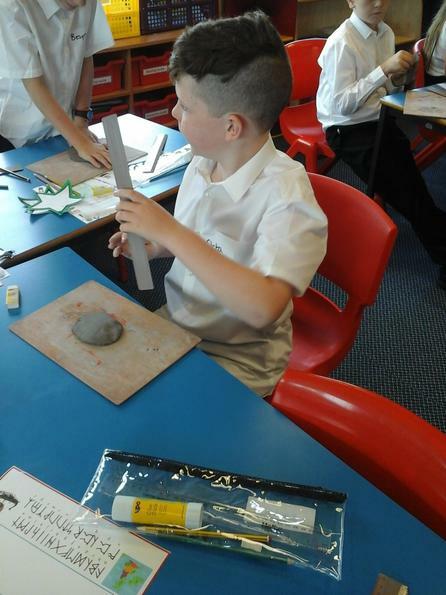 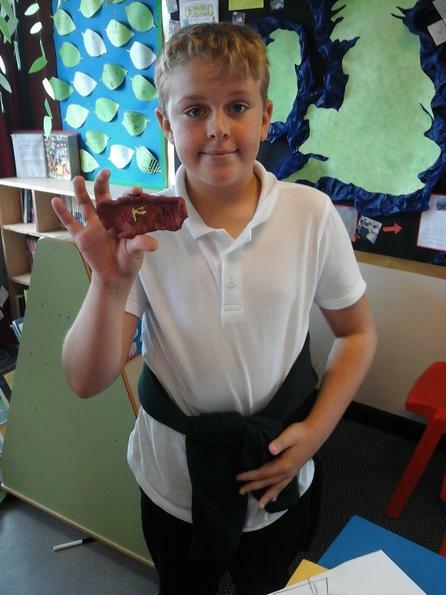 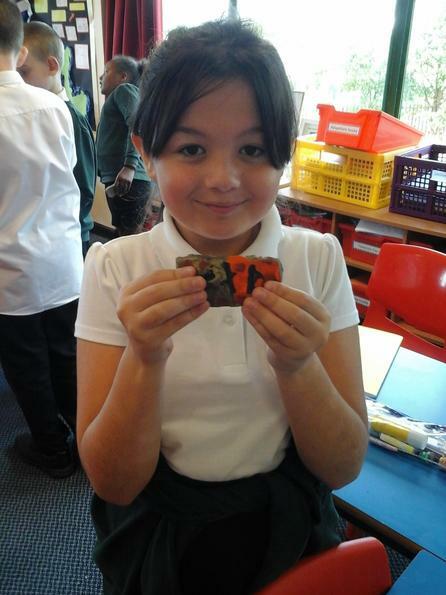 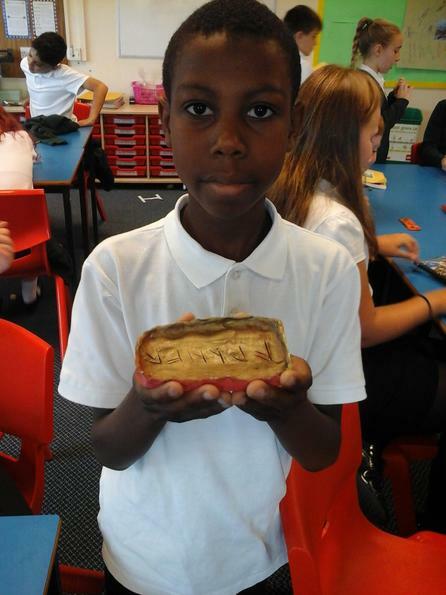 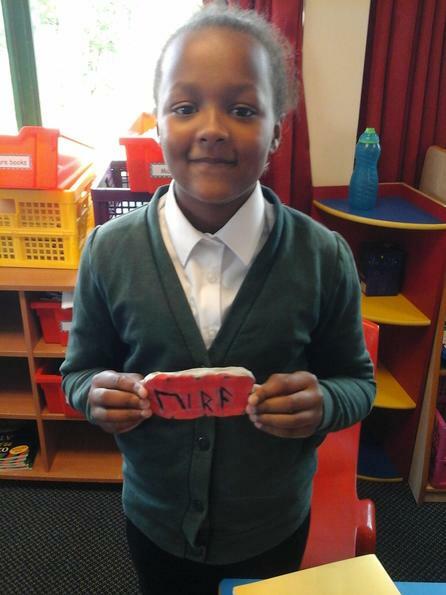 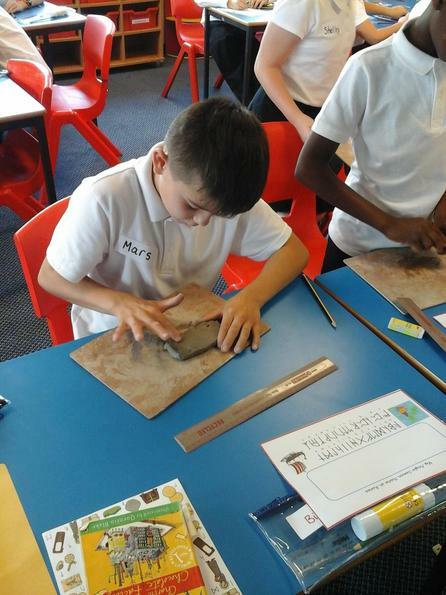 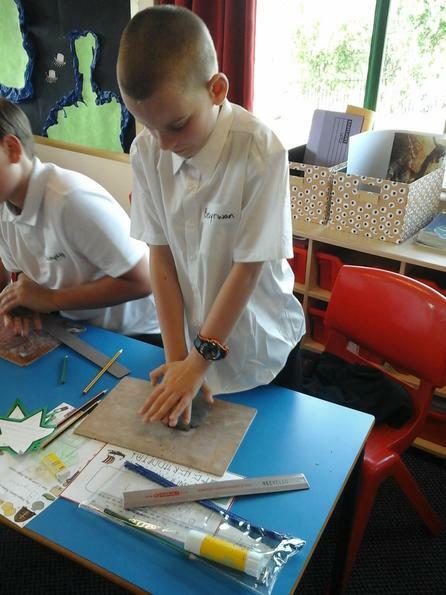 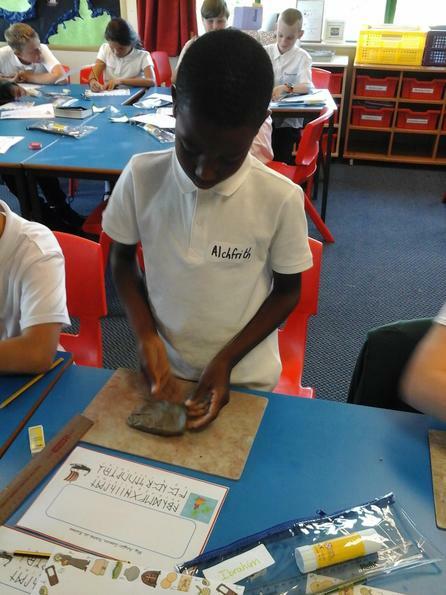 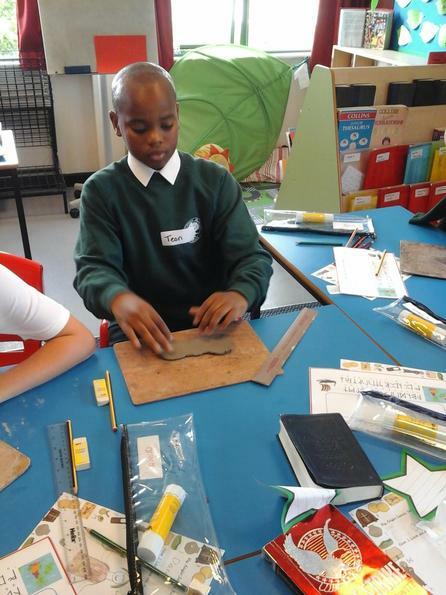 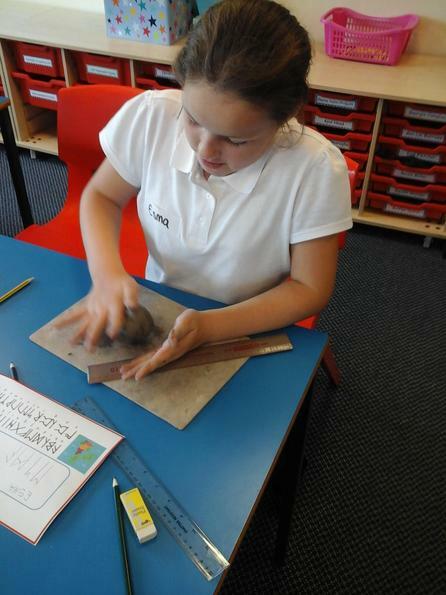 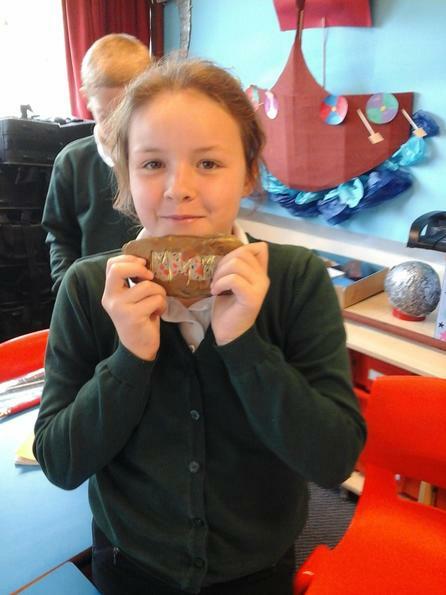 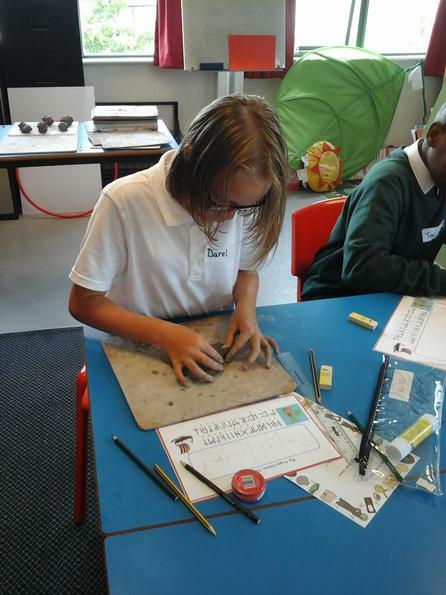 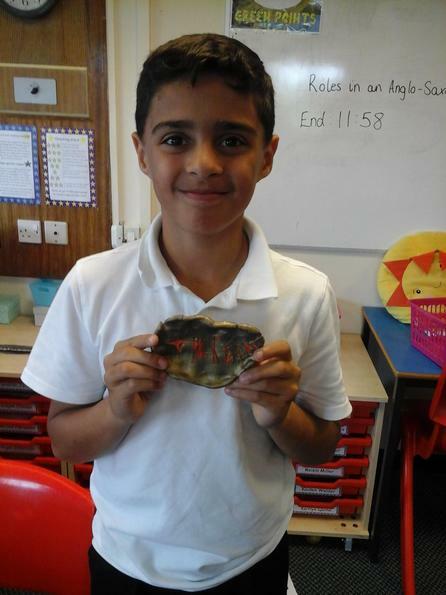 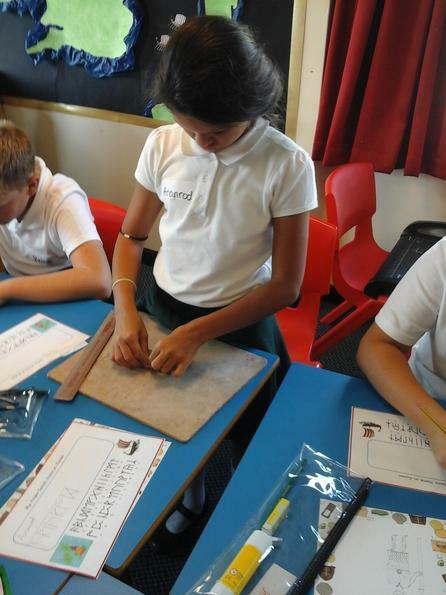 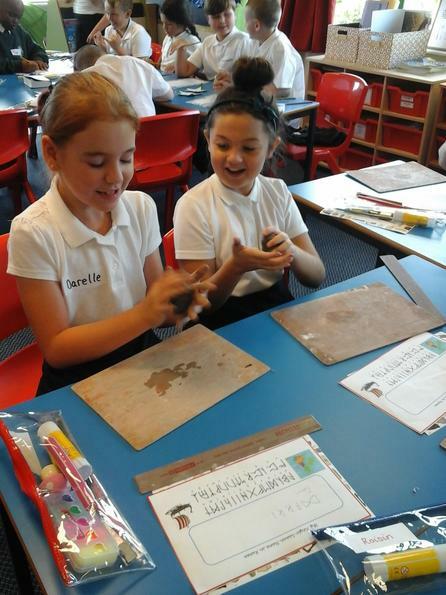 The children were generated an Anglo-Saxon name that they wrote in runes and made a name plate using clay. 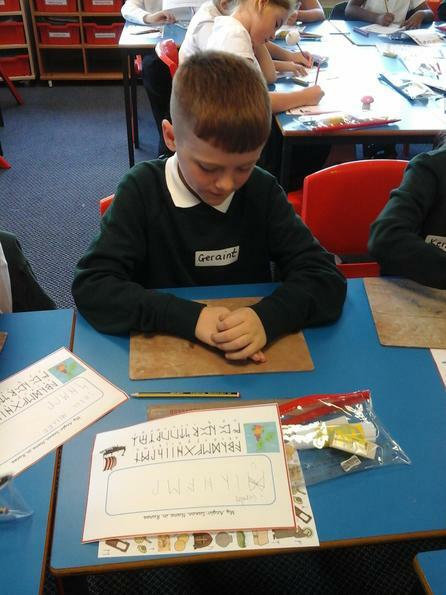 They also drew themselves wearing traditional Anglo-Saxon clothes. 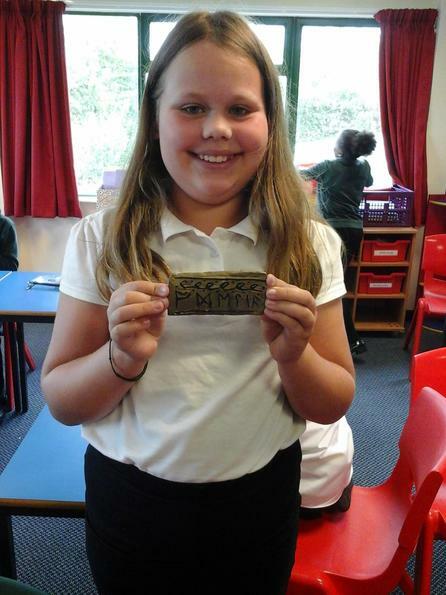 Now the children were more like their new friends (Osmund and Hilda) it was time to learn all about the Anglo-Saxons. 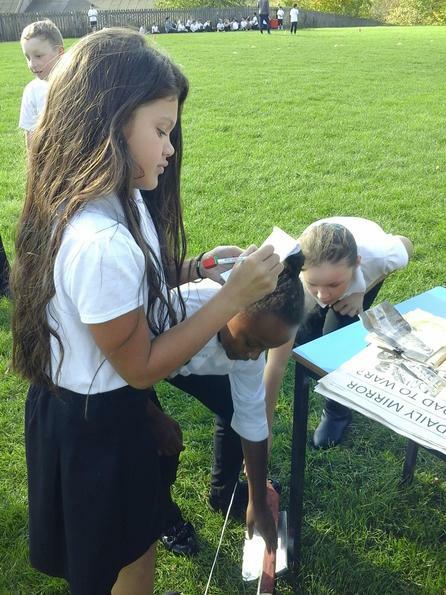 The children completed a Burn 2 Learn to discover some key facts about them: where they came from, where they settled and why they came. 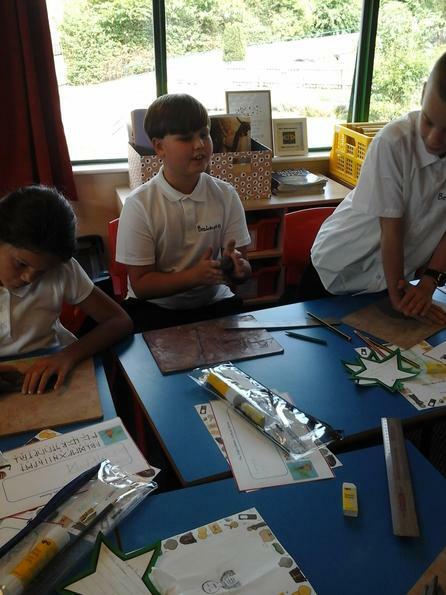 Using these facts, they made fantastic fact files and completed map work to show where the Anglo-Saxons had travelled from. 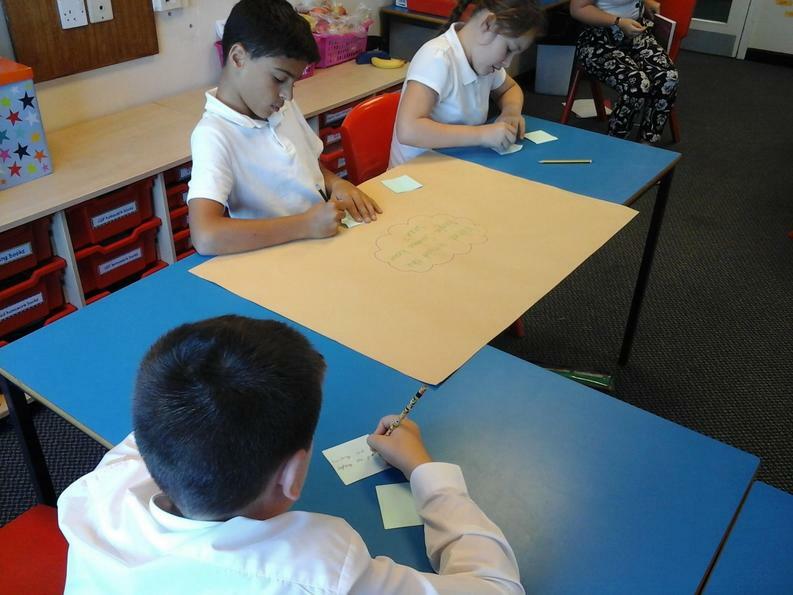 The children then began thinking about how Osmund and Hilda came to be in Britain. 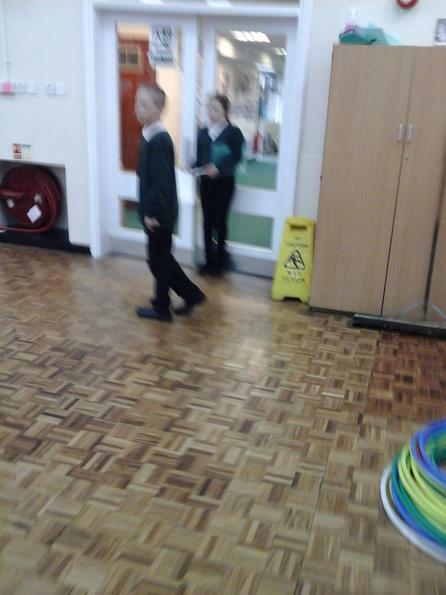 They explained that their relatives travelled over some years ago. 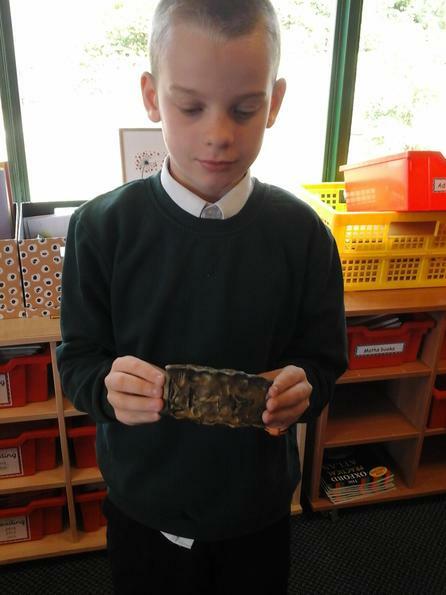 We looked at a picture that showed what the relatives may have seen before setting sail from their homeland. 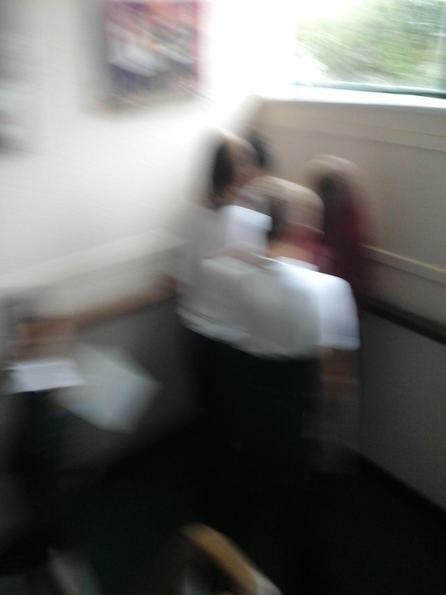 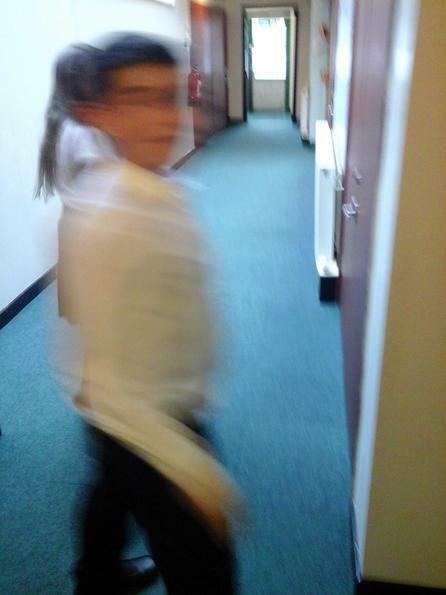 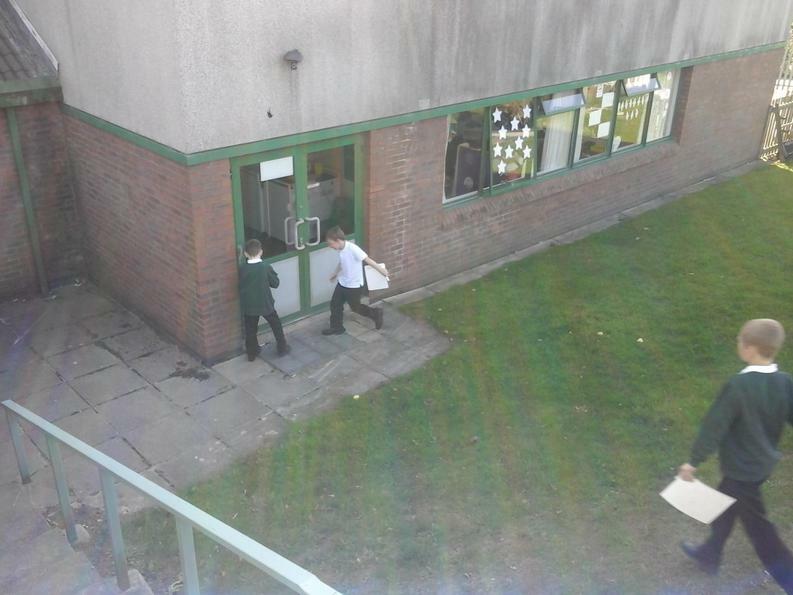 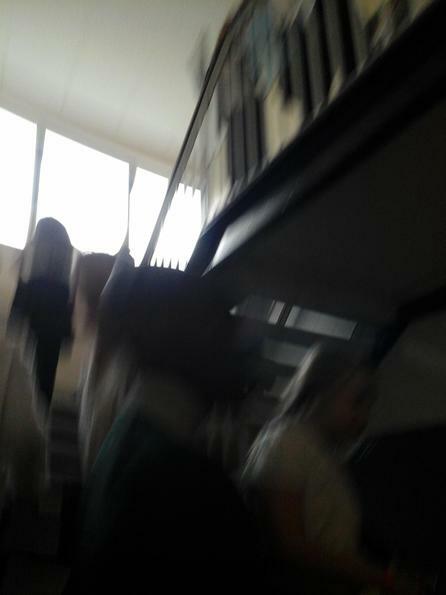 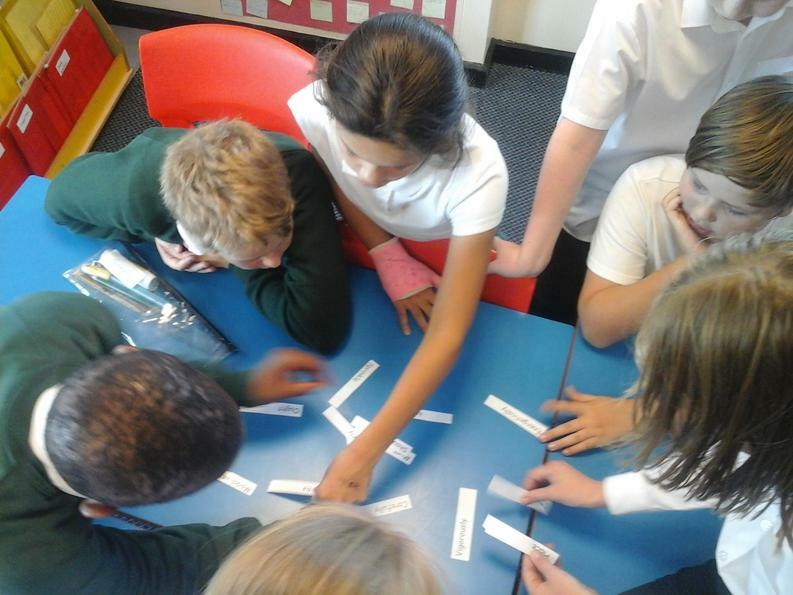 Using the picture, the children began to describe it as a group using expanded noun phrases. 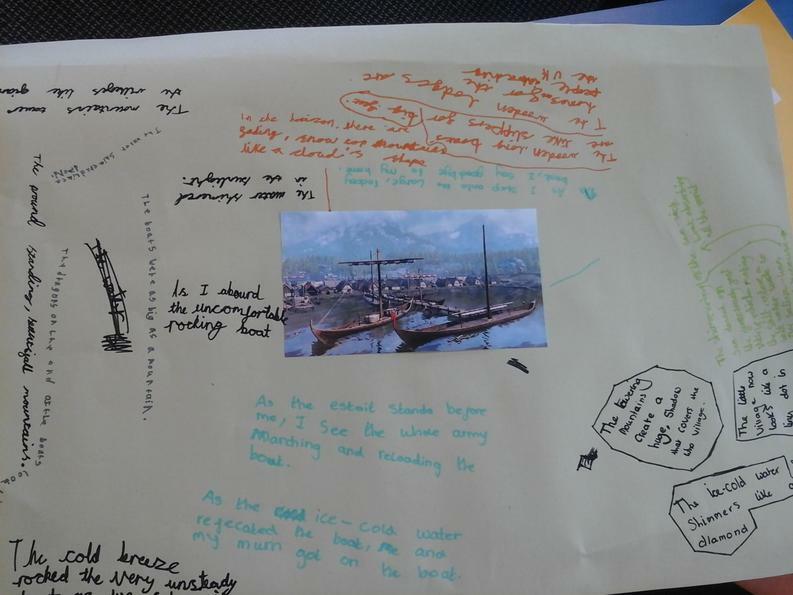 After sharing lots of ideas, the children wrote their own setting descriptions imagining they were Osmund and Hilda’s relatives leaving their homeland for the journey to Britain. 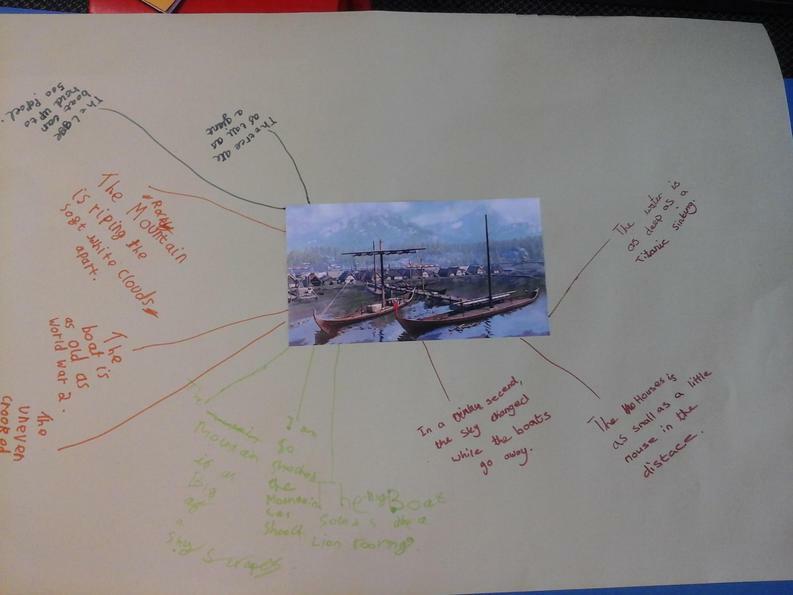 Following this, the children imagined what the journey over to Britain would have been like for Osmund and Hilda’s ancestors. 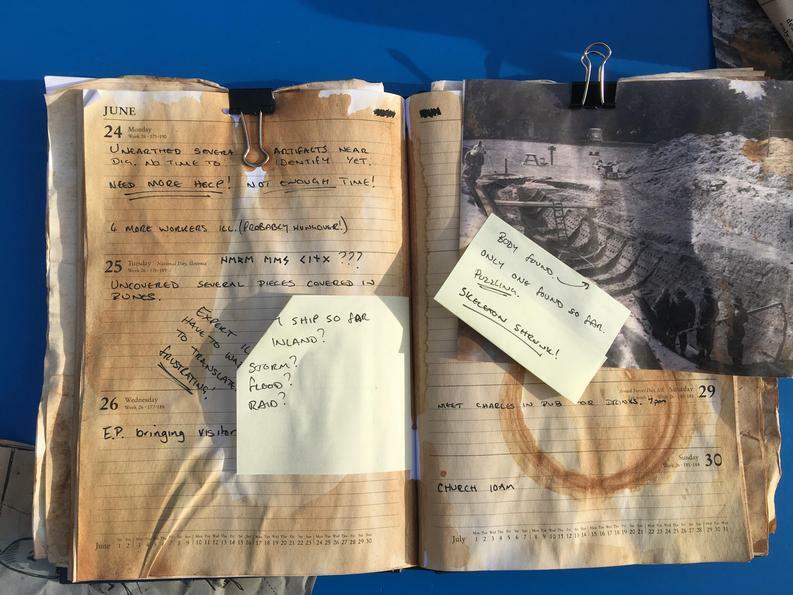 They had to think about the kind of items they would have taken with them, how they would have felt and what the experience on the boat would have been like. 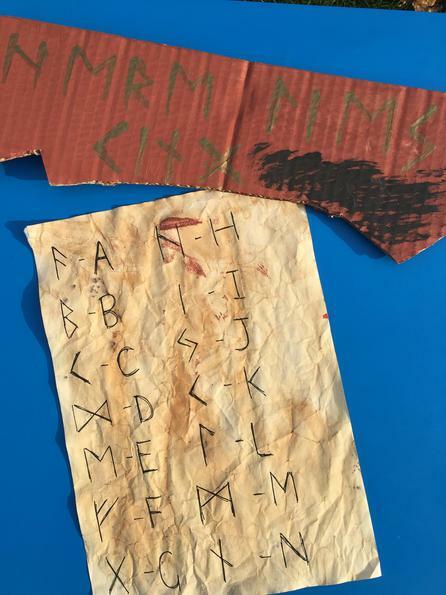 Using these ideas and some work on fronted adverbials and expanded noun phrases, the children wrote diary entry as one of Osmund and Hilda’s relatives. 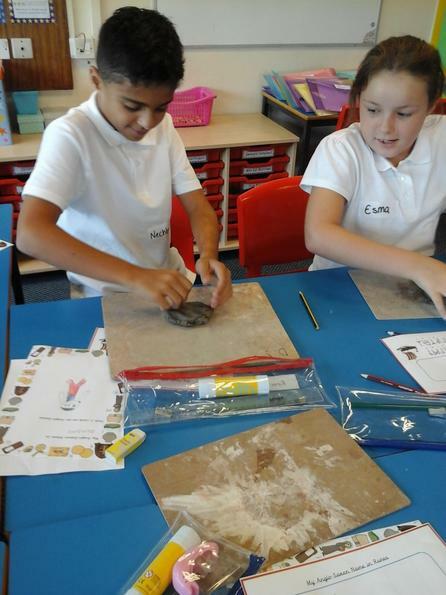 Now we are meeting back up with Osmund and Hilda to see what their way of life was like as an Anglo-Saxon living in a village. 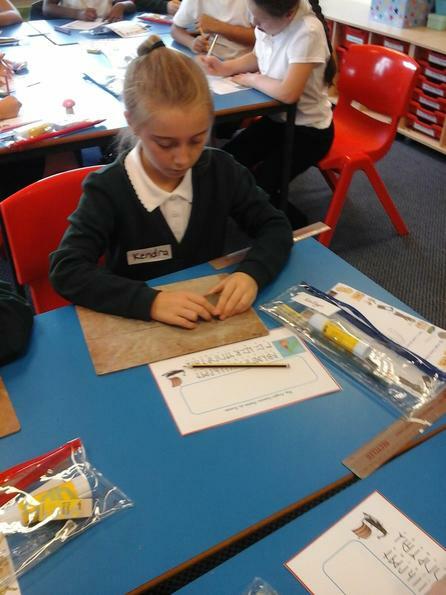 Before telling the children this, they completed a jigsaw burn 2 learn, where they had to put together a jigsaw picture of either the outside or inside of an Anglo-Saxon house. 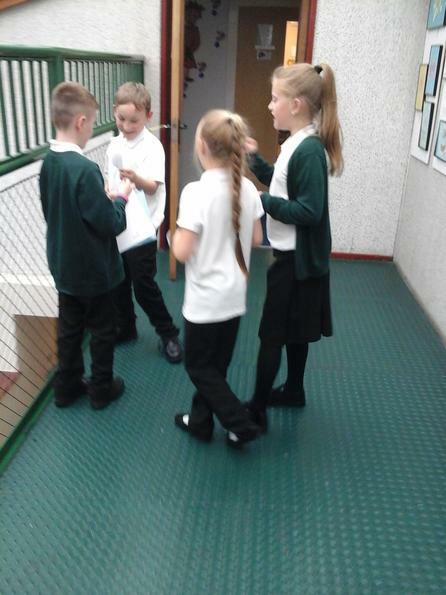 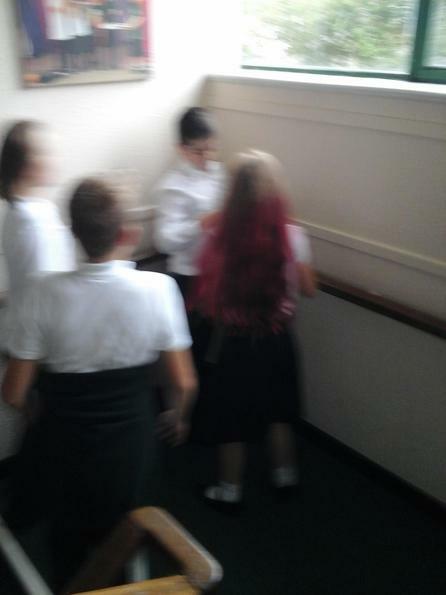 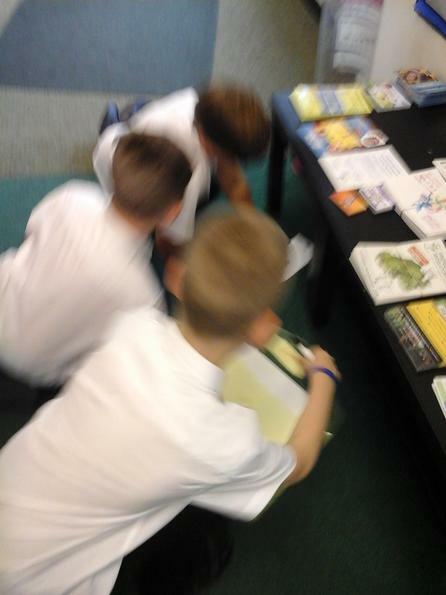 They then discovered lots of different facts about where Osmund and Hilda. 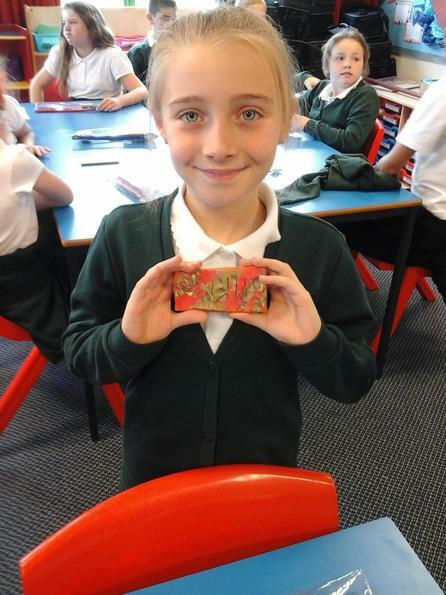 The children then made a 3D model of an Anglo-Saxon house ensuring they included key features such as wooden panelled walls, a thatched roof, a fire in the center of the hut and meat hanging from the walls. 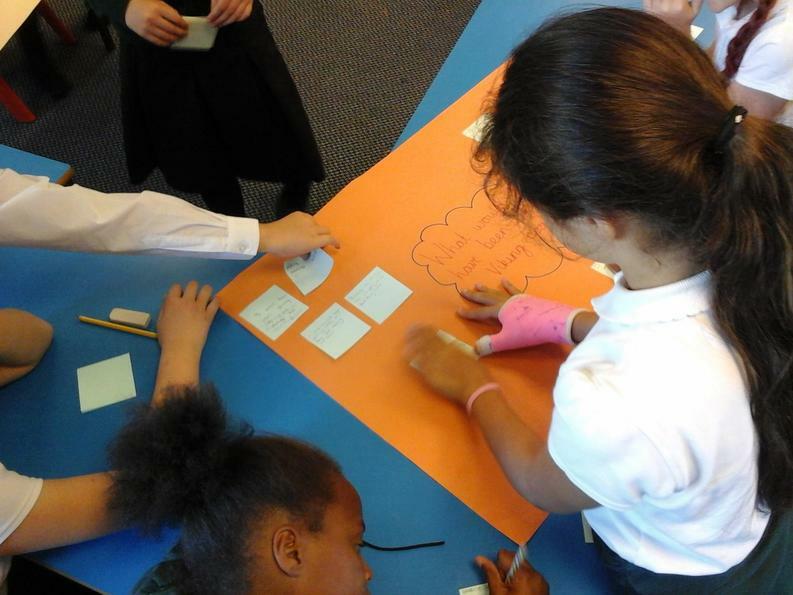 They also labelled a picture of their house to explain all the separate features. 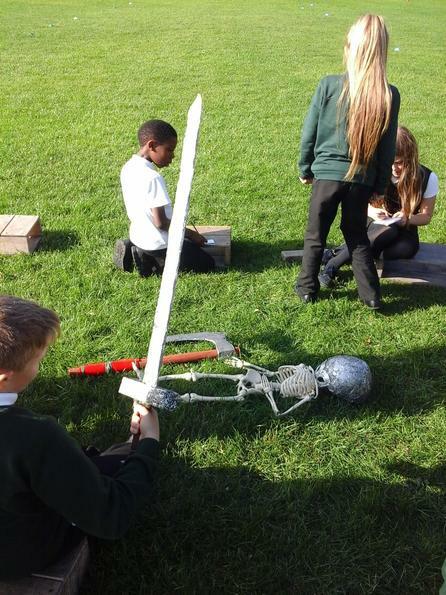 Once in the village, Osmund and Hilda were desperate to tell the children about the types of games they used to play. 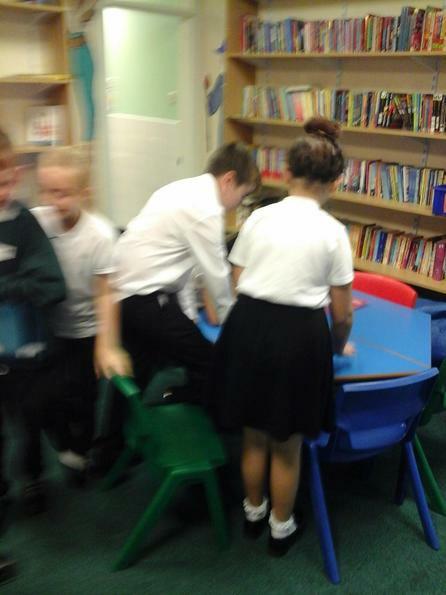 We realised how different some of these were to the electronic games they play today, however some were similar like card games and games using dice. 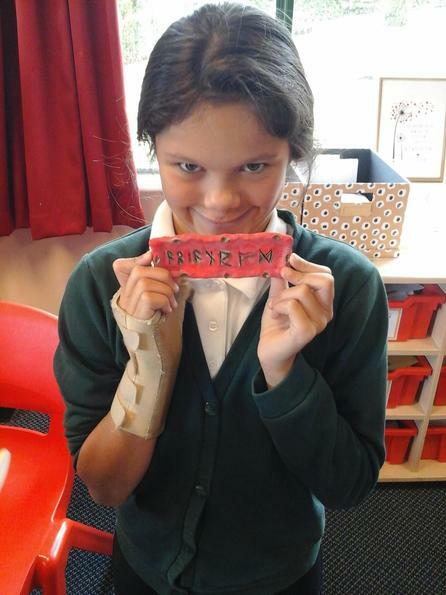 After finding out what Anglo-Saxon children played, they created their own Saxon Toy Shop featuring their two favourite toys. 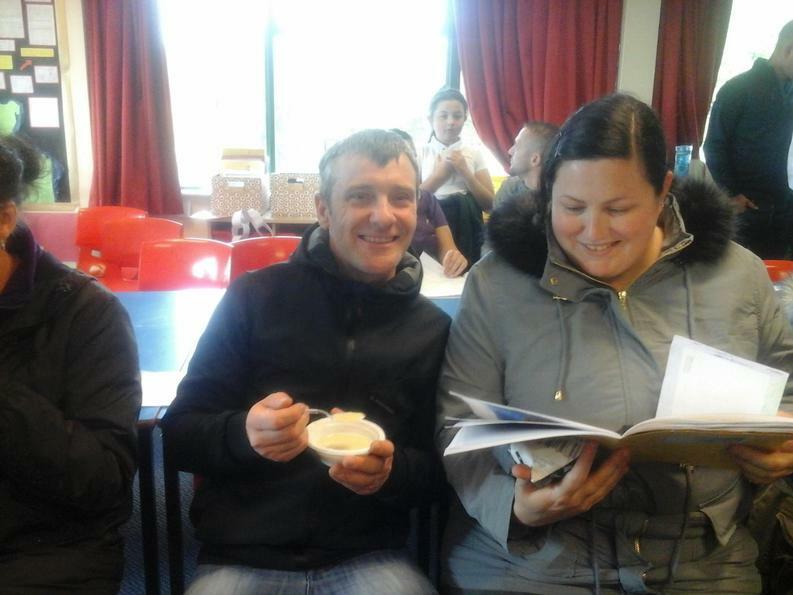 Now we have become settled in the village, Osmund and Hilda feel it is time to introduce us to the different jobs and roles for people in the village. 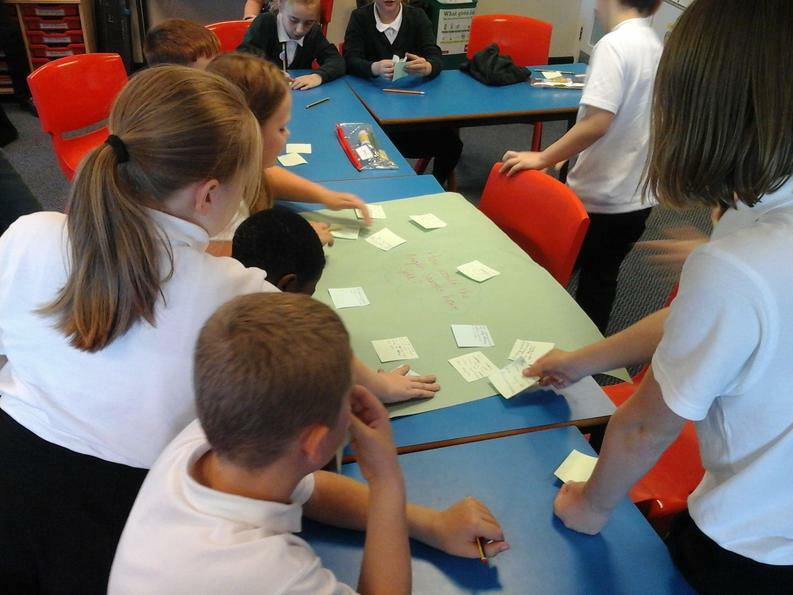 The children first completed a Burn 2 Learn, which allowed them to learn about the specific roles for men, women, boys and girls. 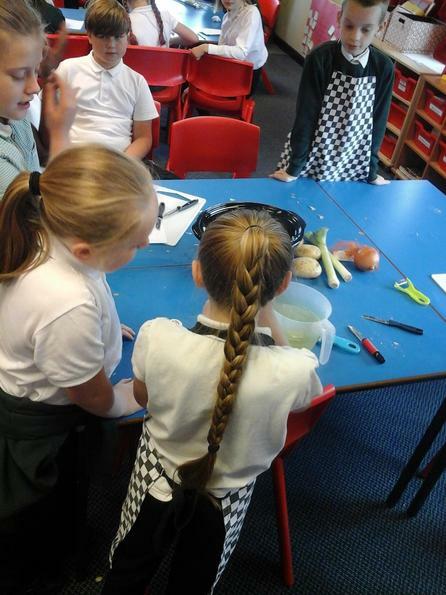 Osmund and Hilda were then keen to tell the children about the kinds of food they ate so the children could host their own Anglo-Saxon feast for their parents. 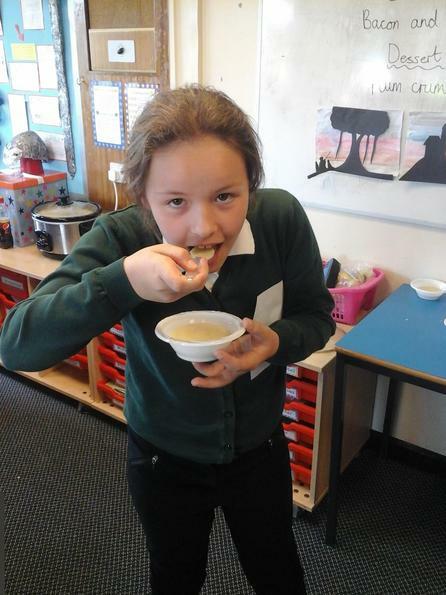 The lesson begun with a blind taste test, where 5 children had to guess what the food they were eating was. 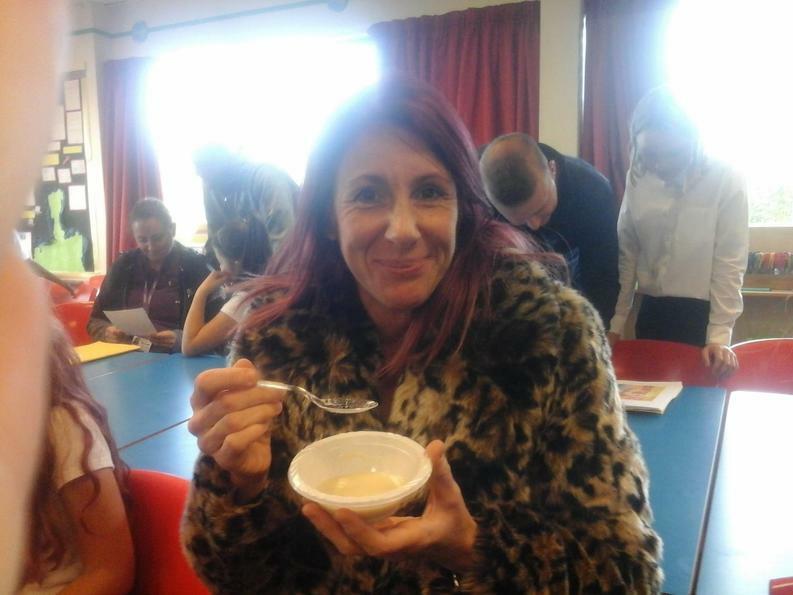 Everyone in class then got a chance to try some. 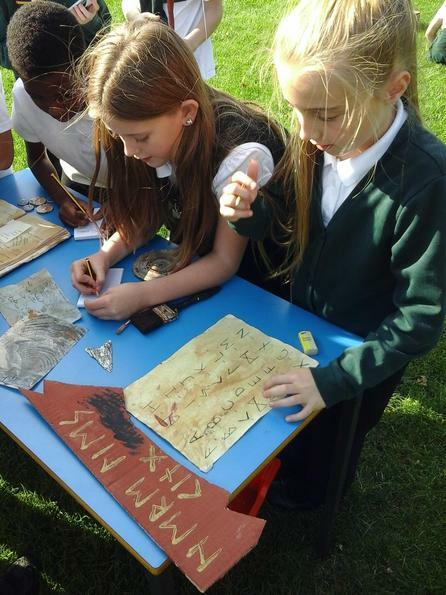 Then using all they had learnt, the children wrote a menu for their Anglo-Saxon feast! 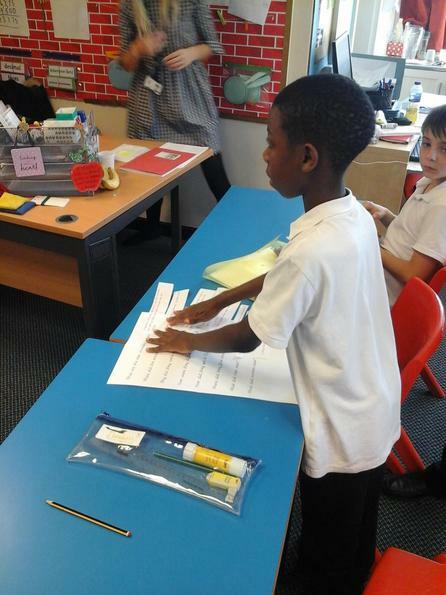 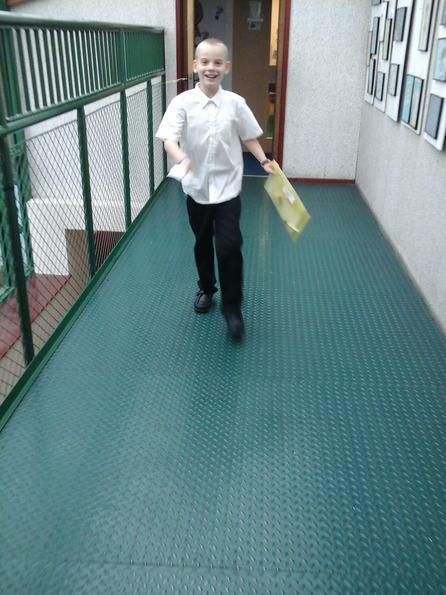 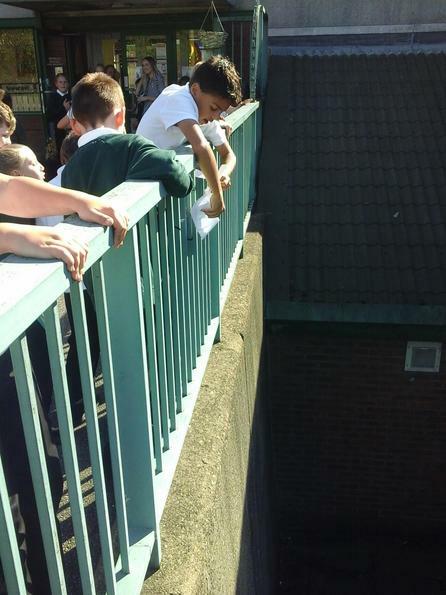 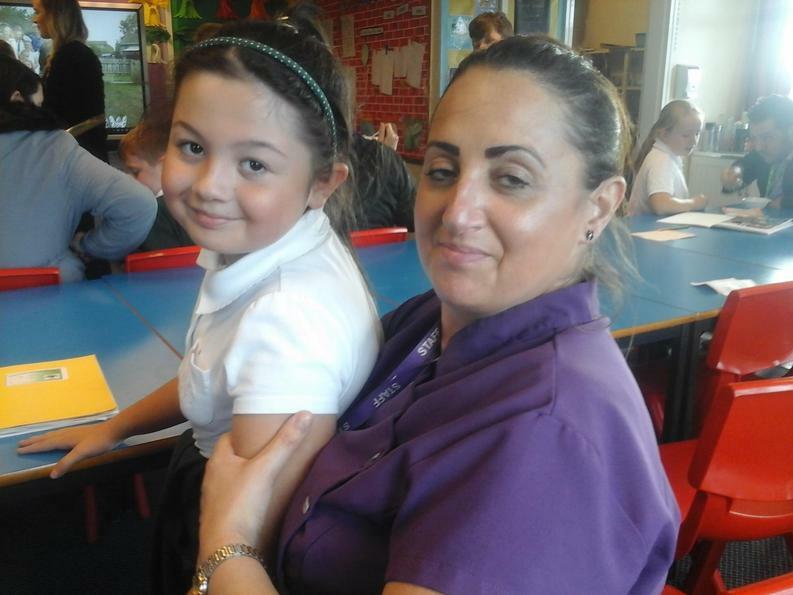 In preparation for inviting their parents in to school, the children wrote formal invitations requesting they attend. 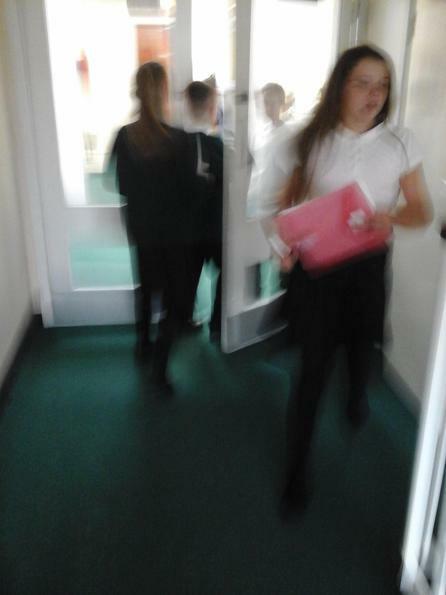 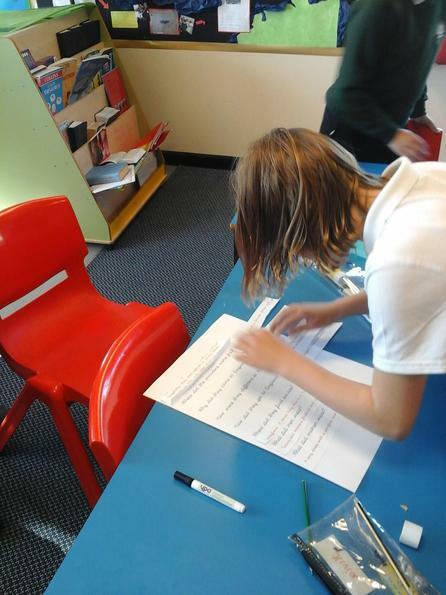 They completed some work looking at how to change the formality of their writing before writing the final invitation. 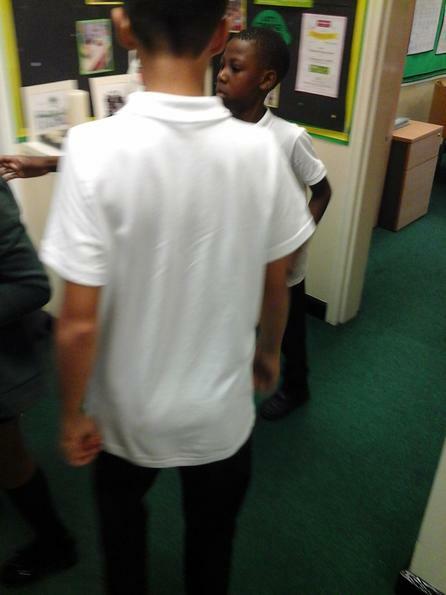 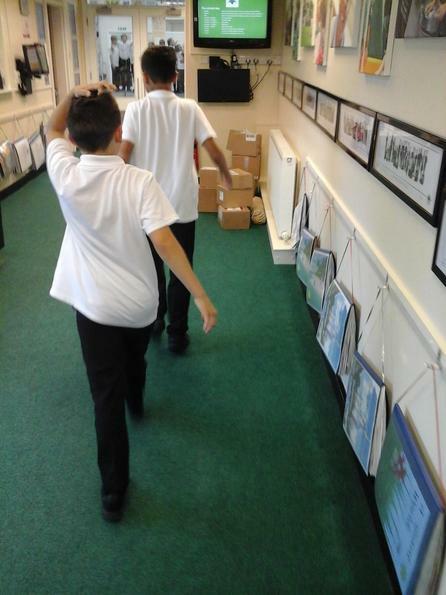 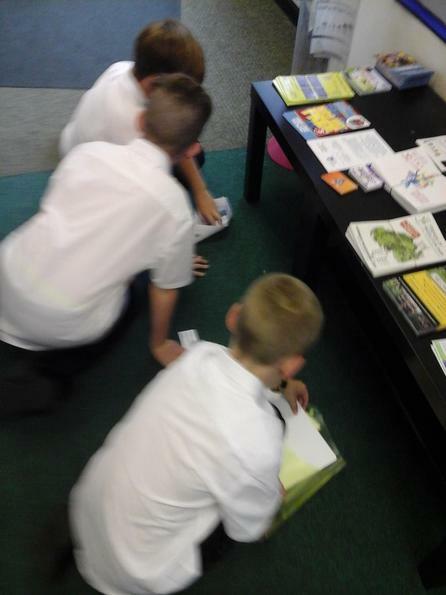 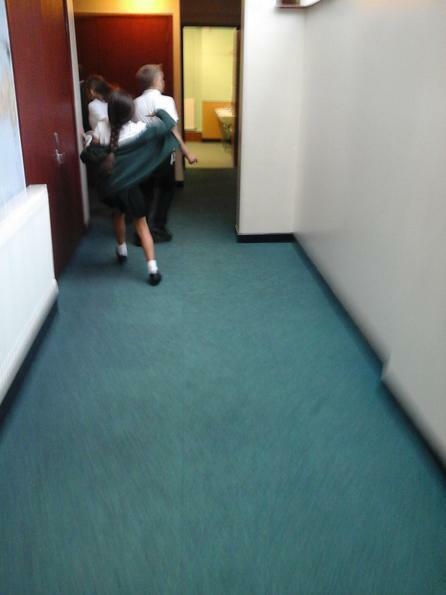 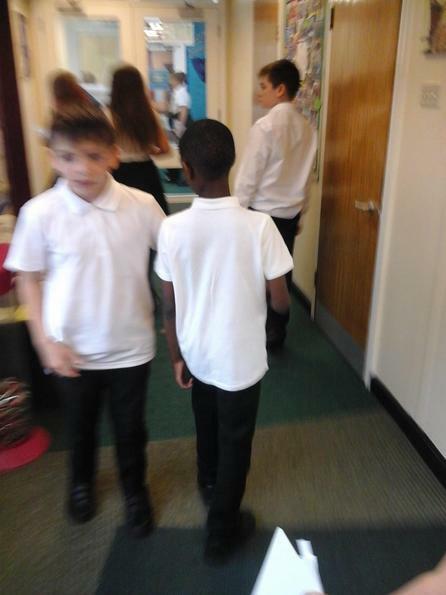 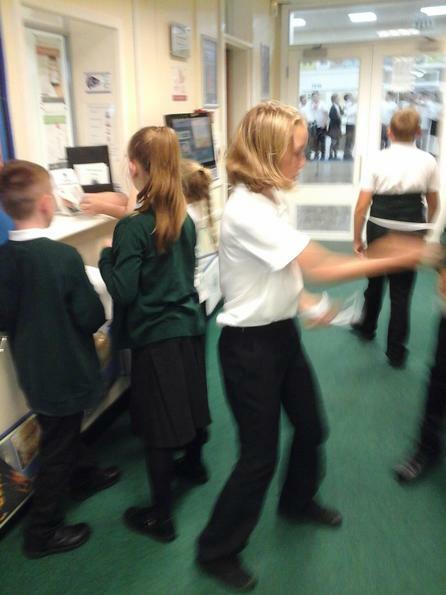 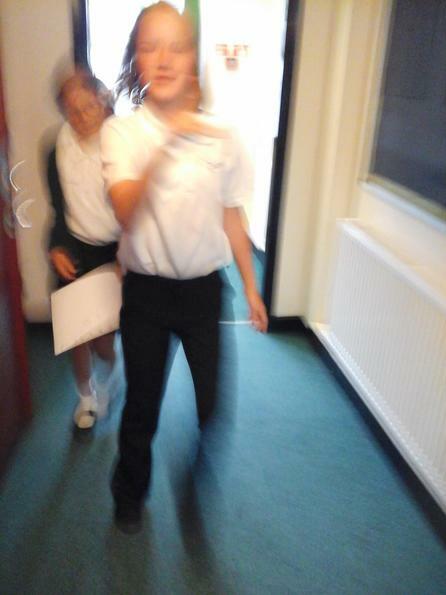 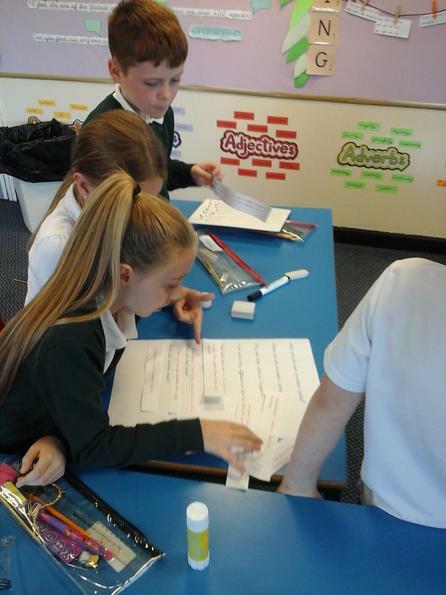 In reading, we used the old Anglo-Saxon folk tale of Beowulf to complete some reading activities. 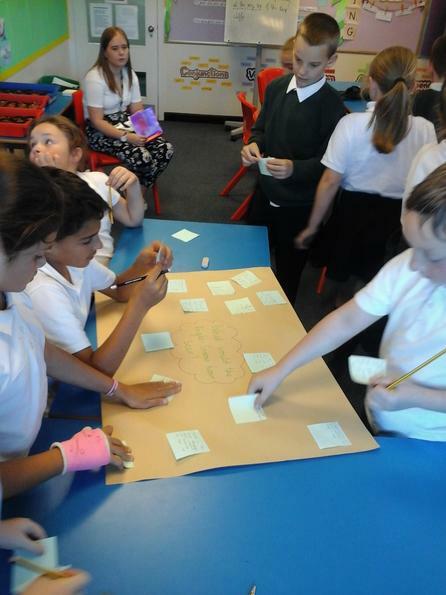 After reading and annotating the story to help us understand it, the children completed a storyboard summarising the story and answered different styles of questions based on the story. 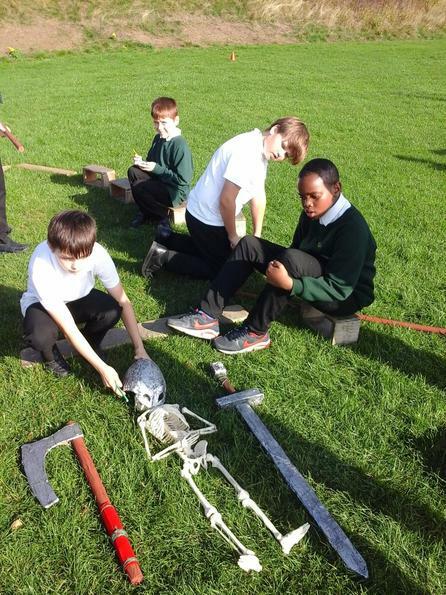 We have received some breaking news: the Vikings are invading! 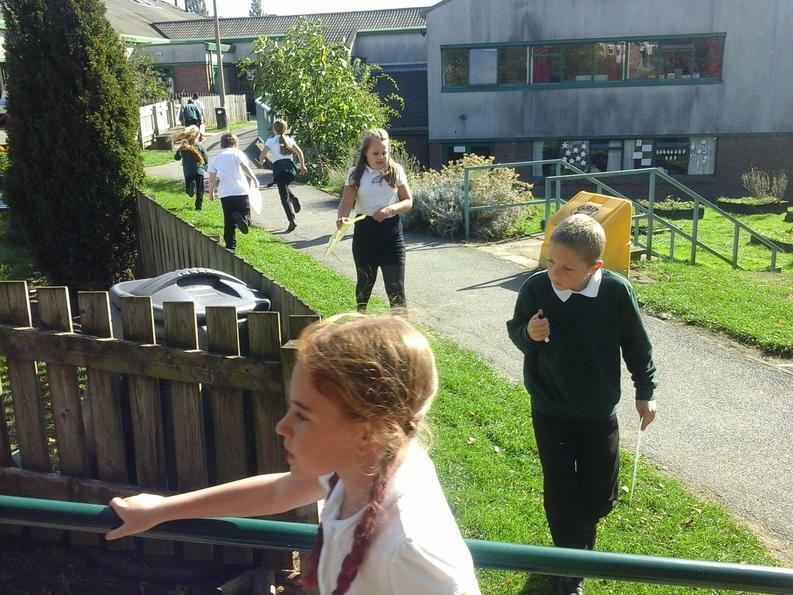 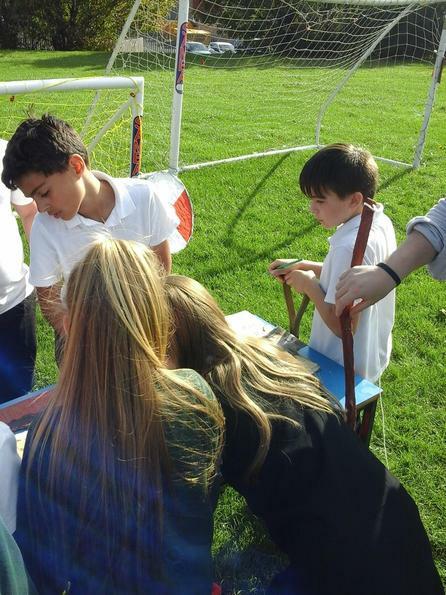 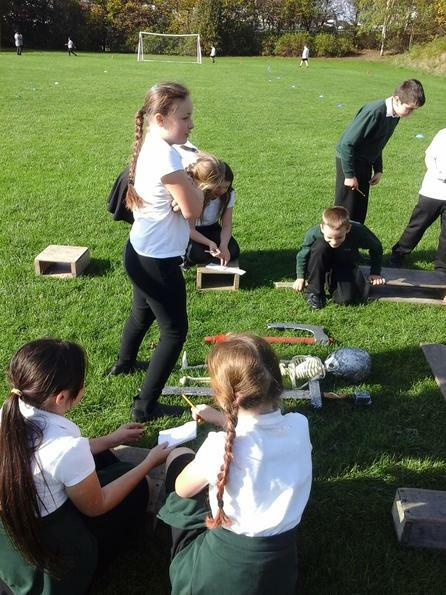 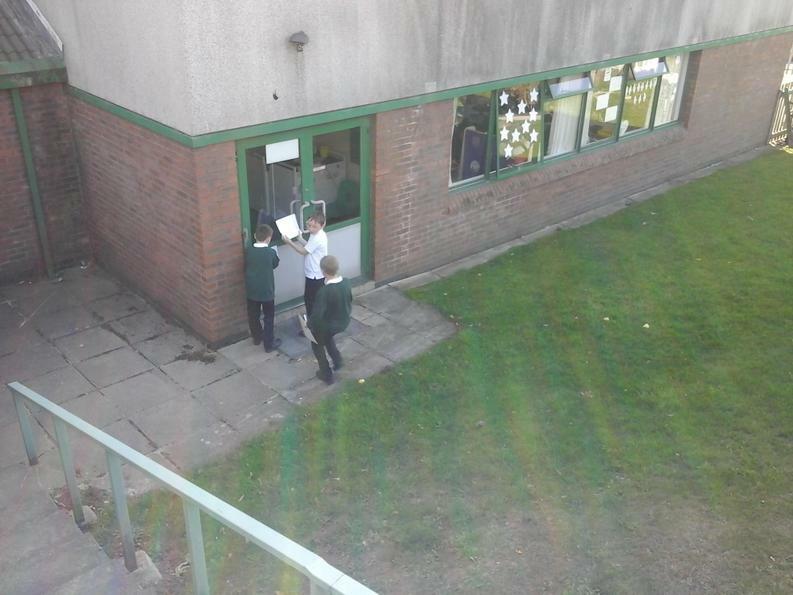 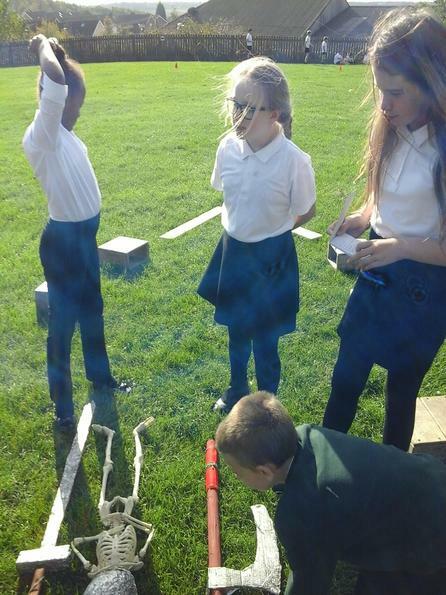 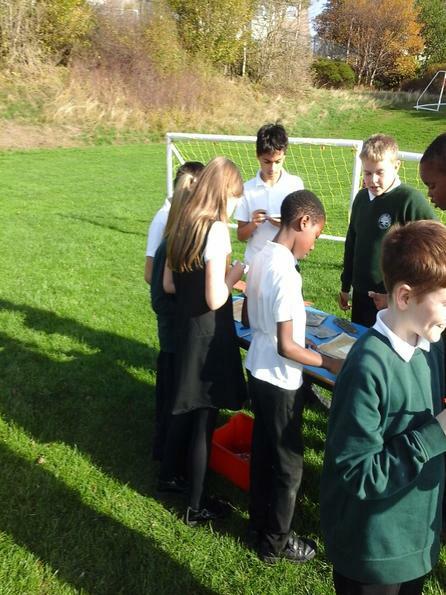 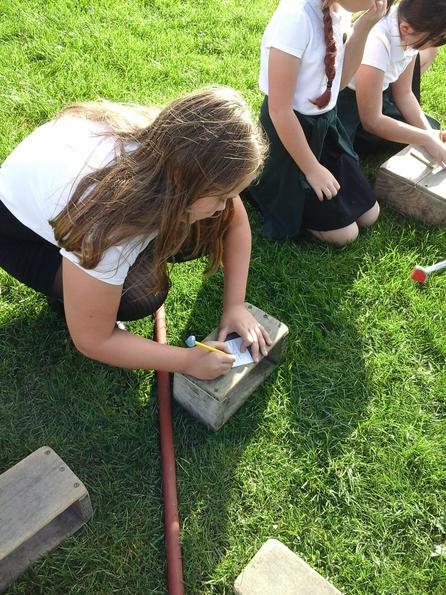 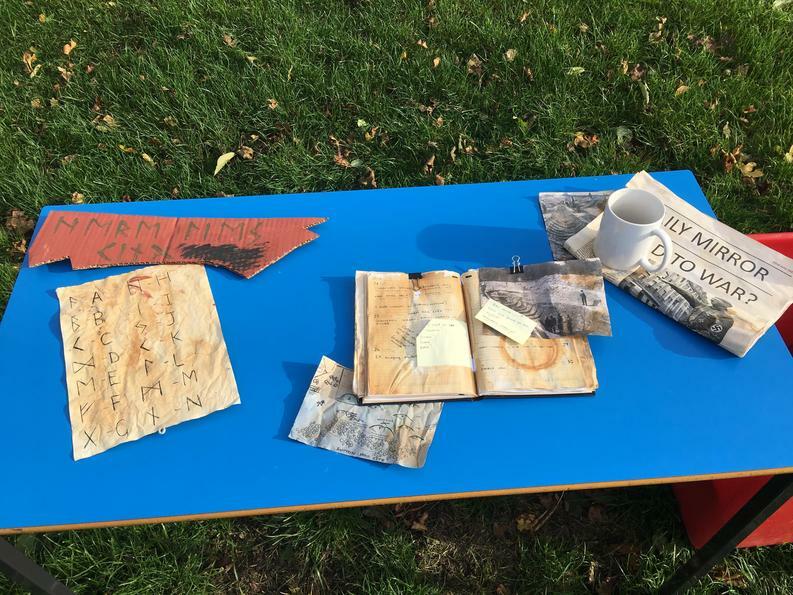 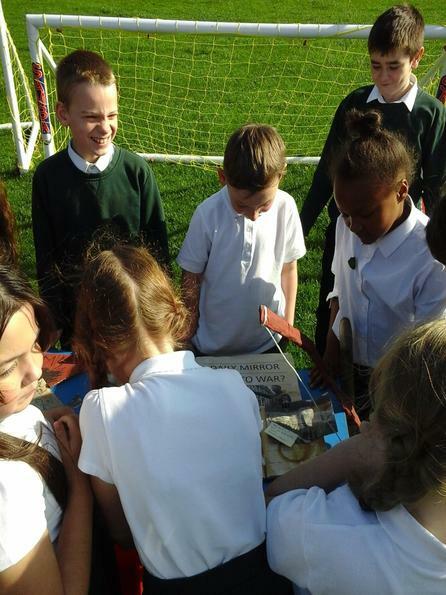 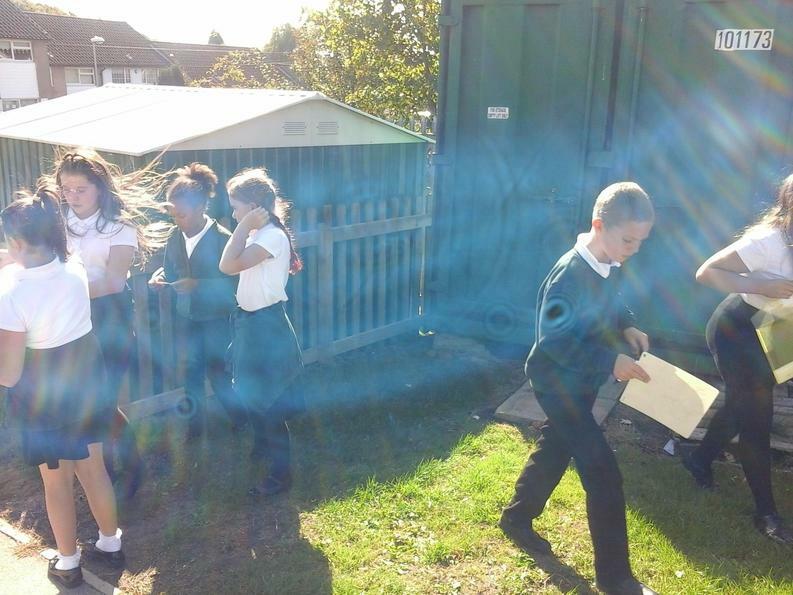 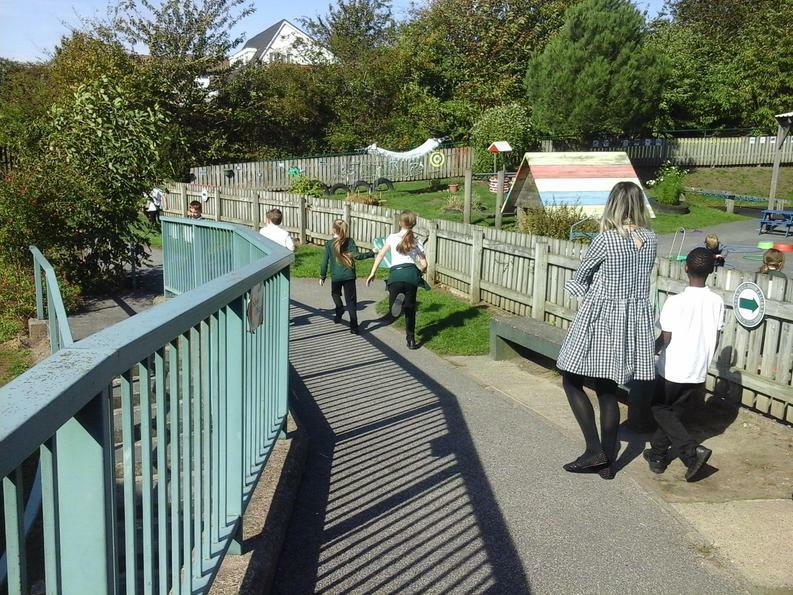 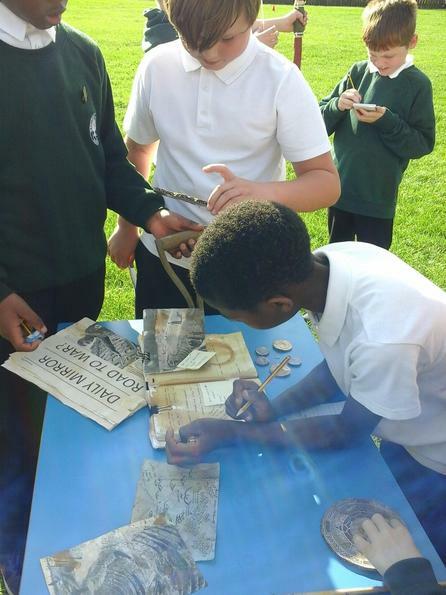 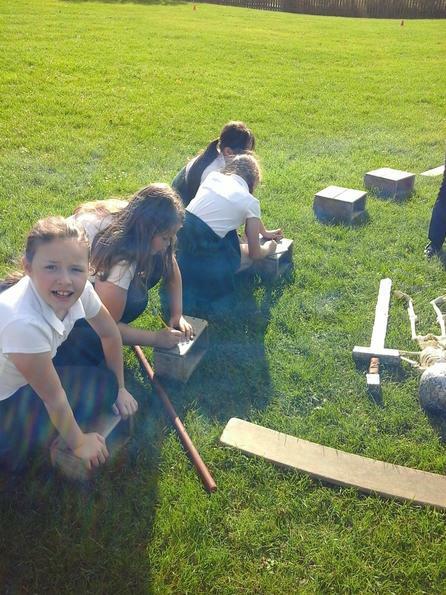 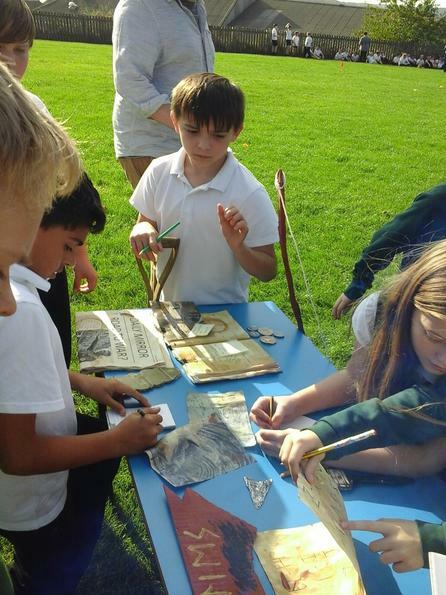 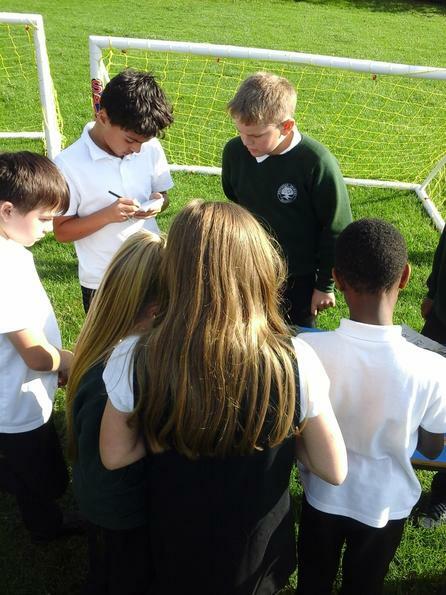 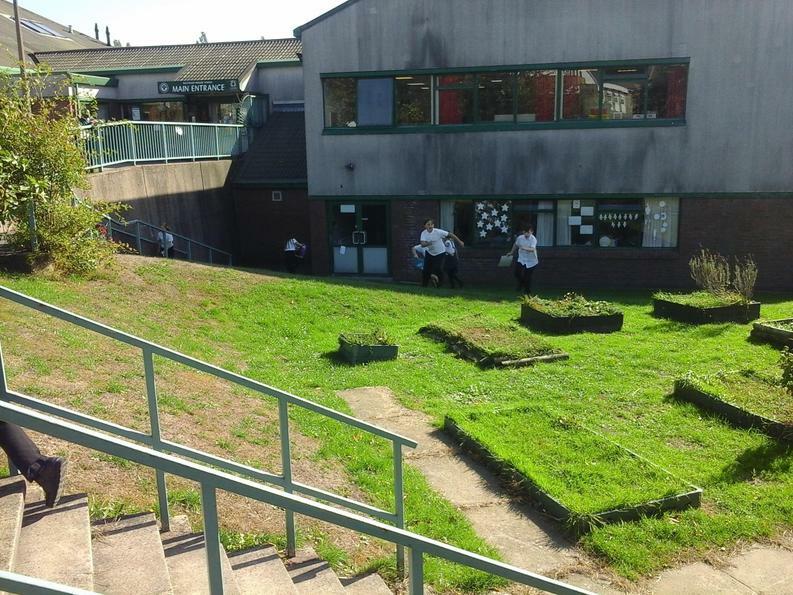 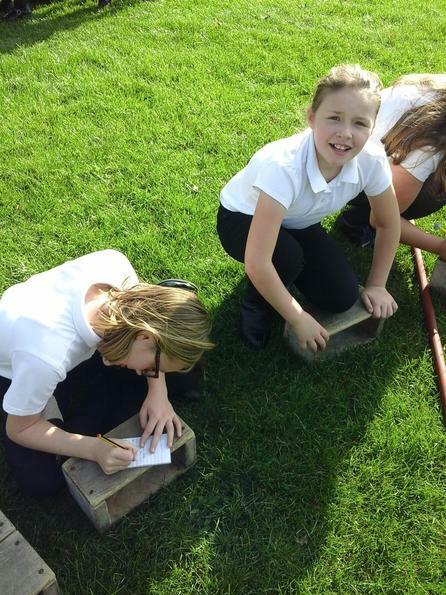 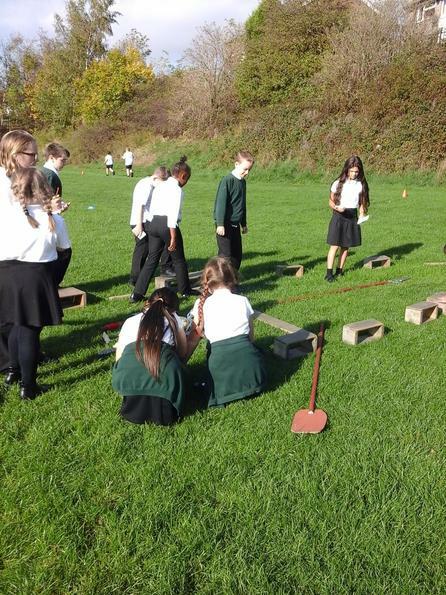 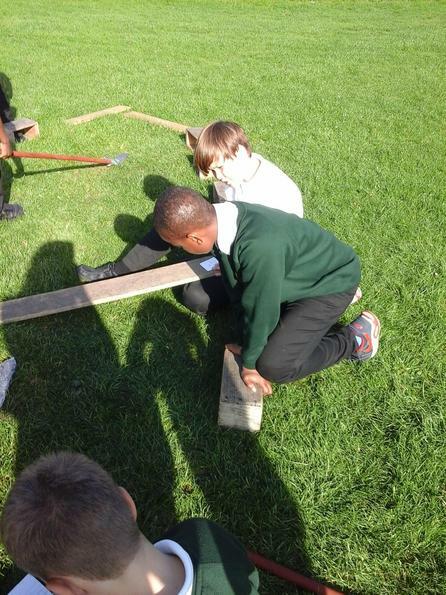 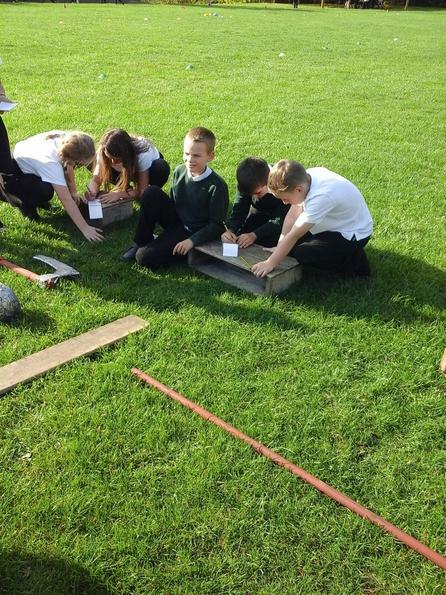 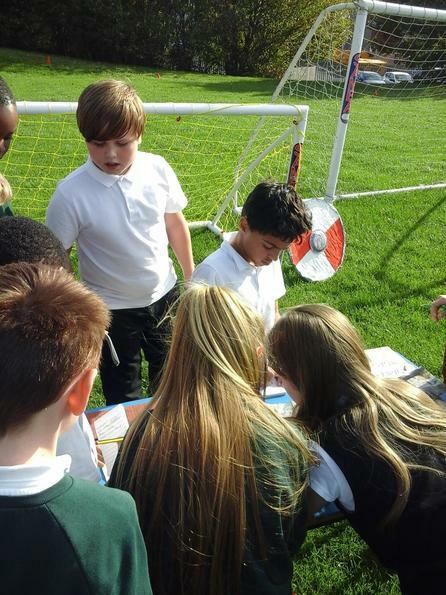 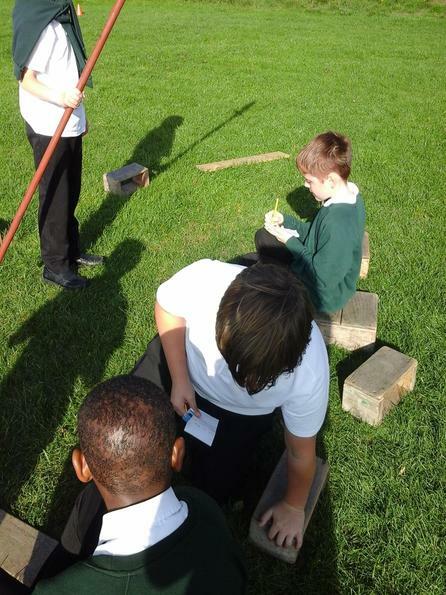 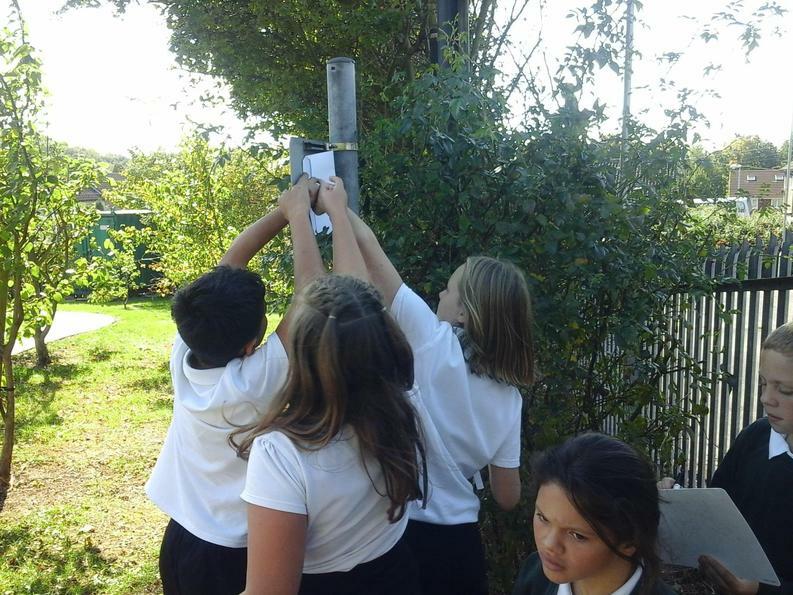 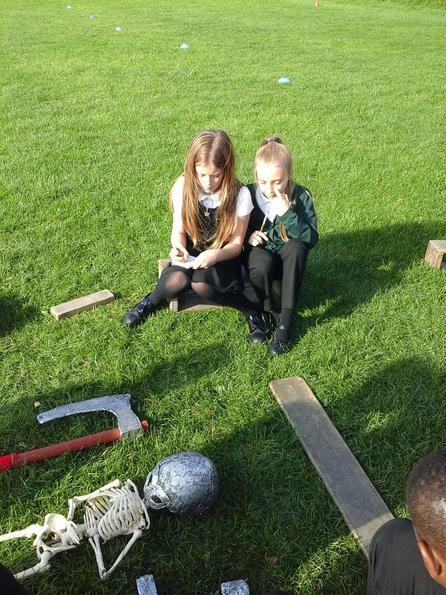 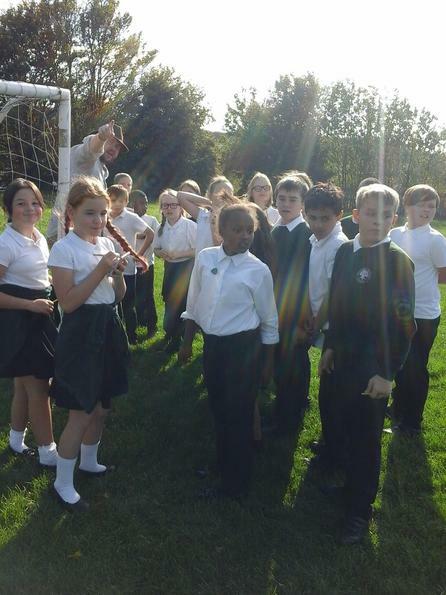 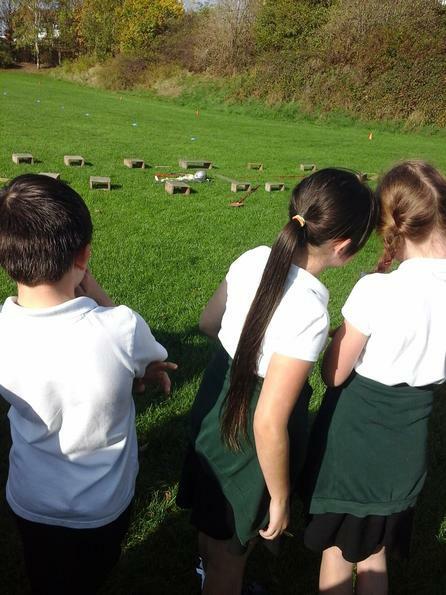 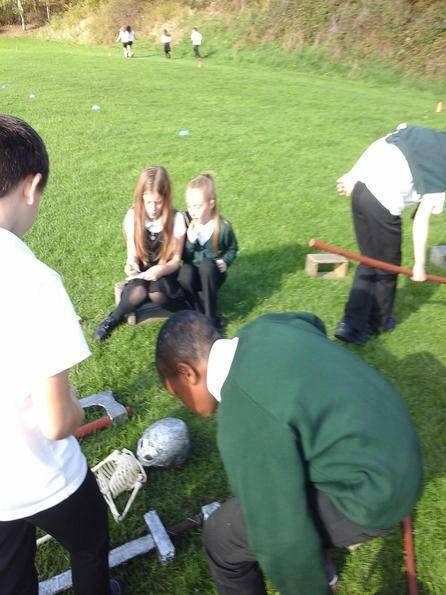 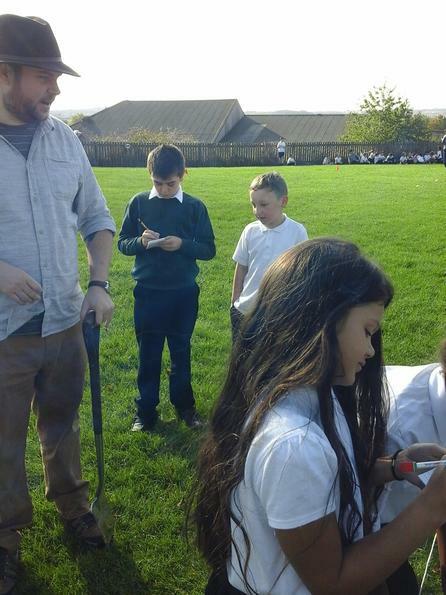 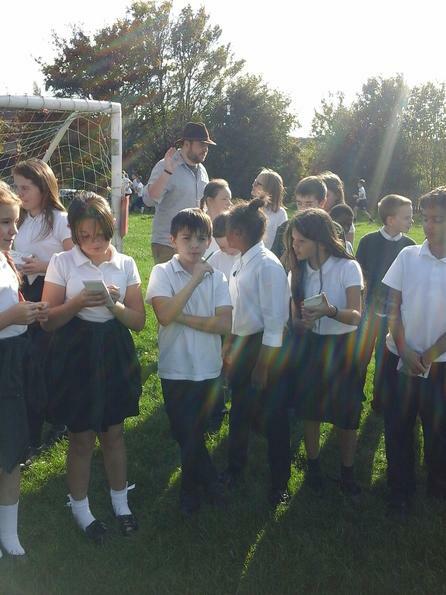 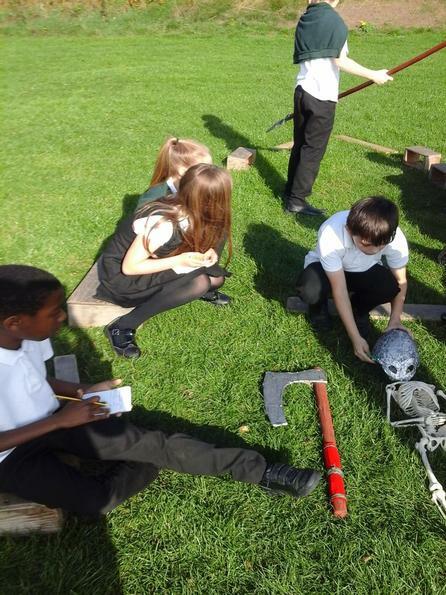 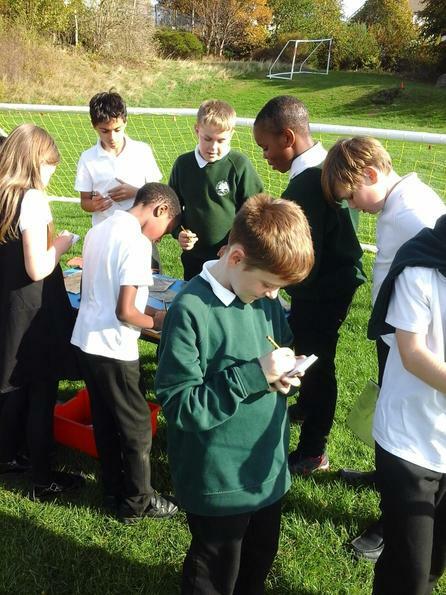 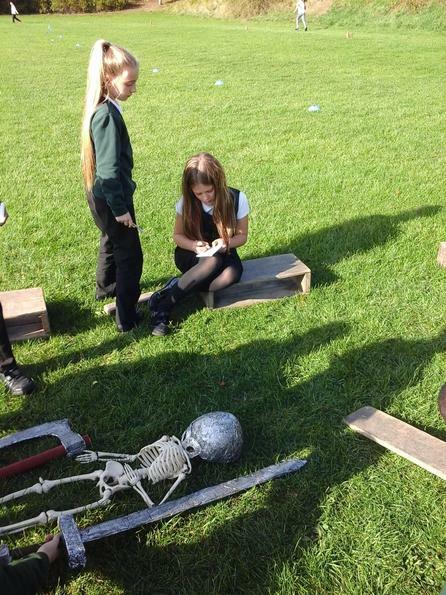 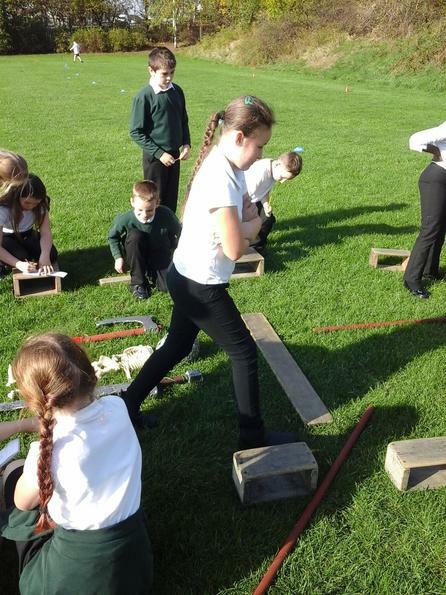 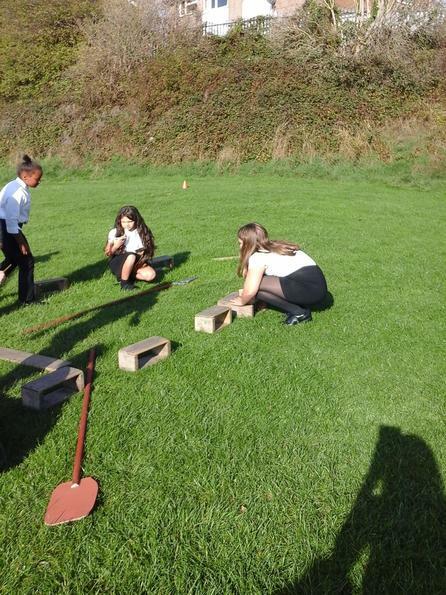 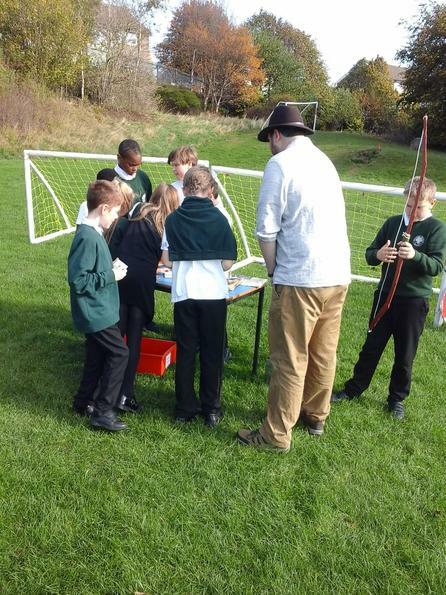 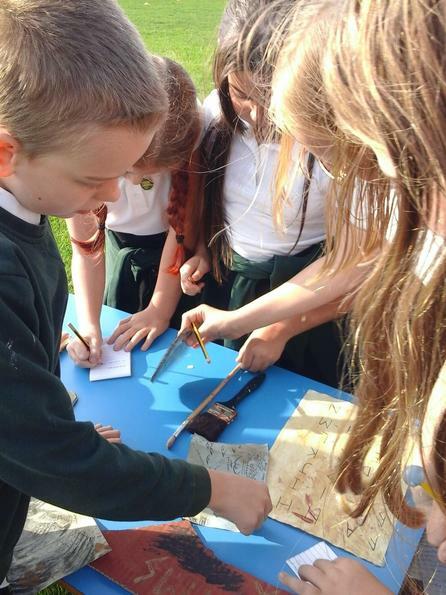 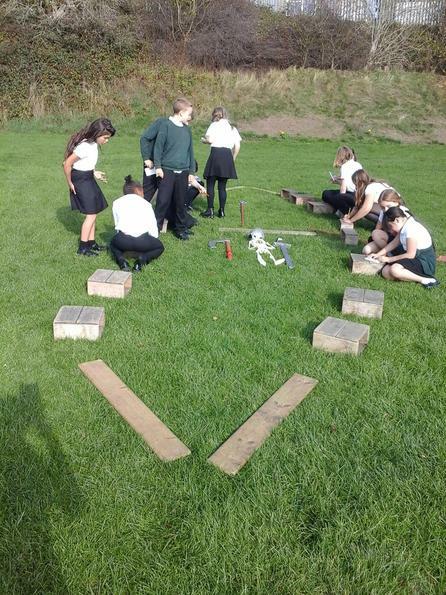 The children found out key facts about the Vikings through completing a Burn 2 Learn outside. 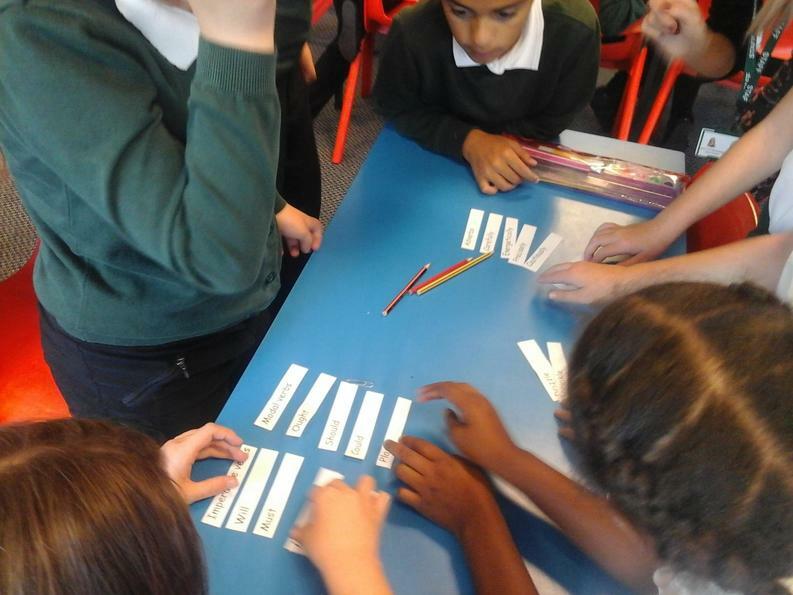 They then matched these answers to the questions inside. 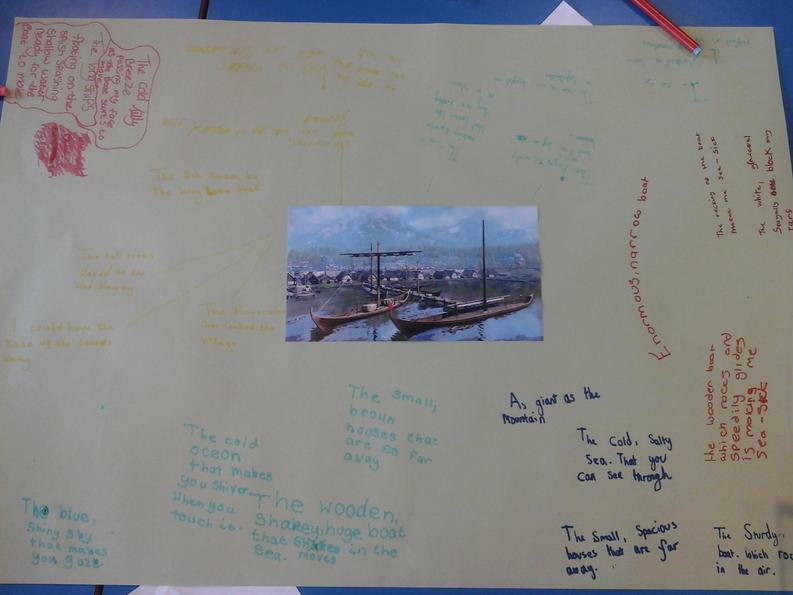 We then looked at different pictures depicting the Viking invasion on their longboats. 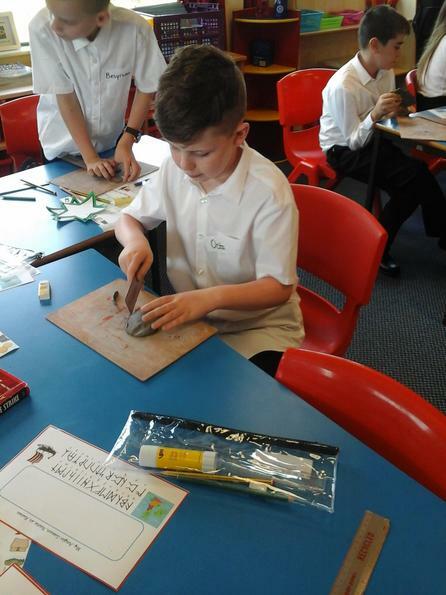 The children each chose a picture to re-create using watercolours. 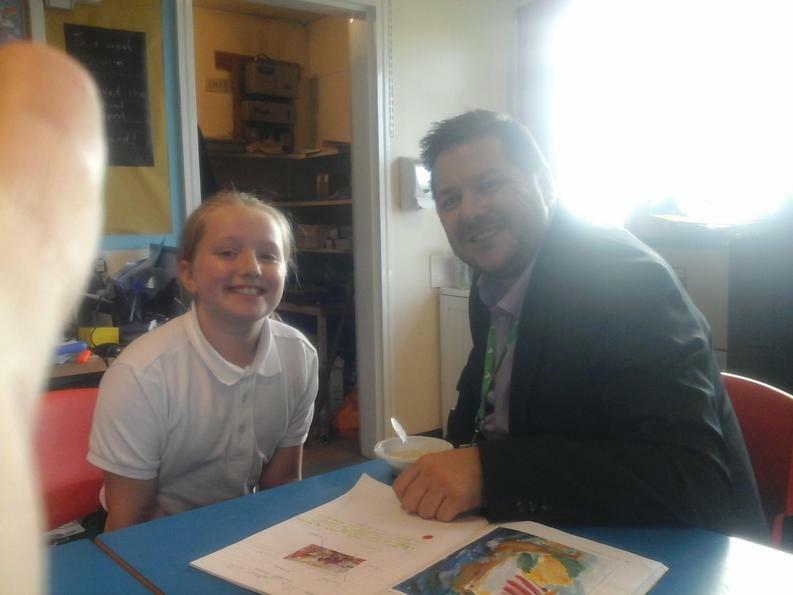 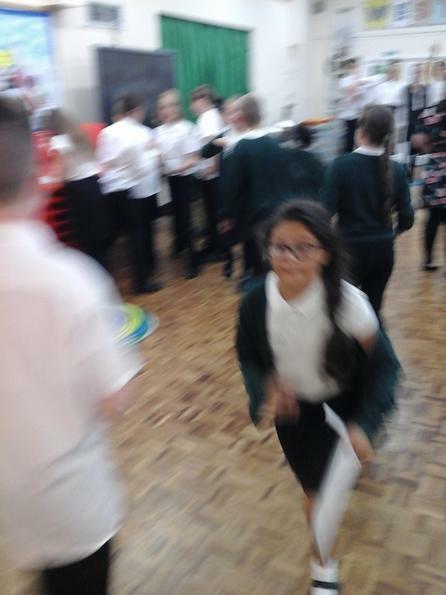 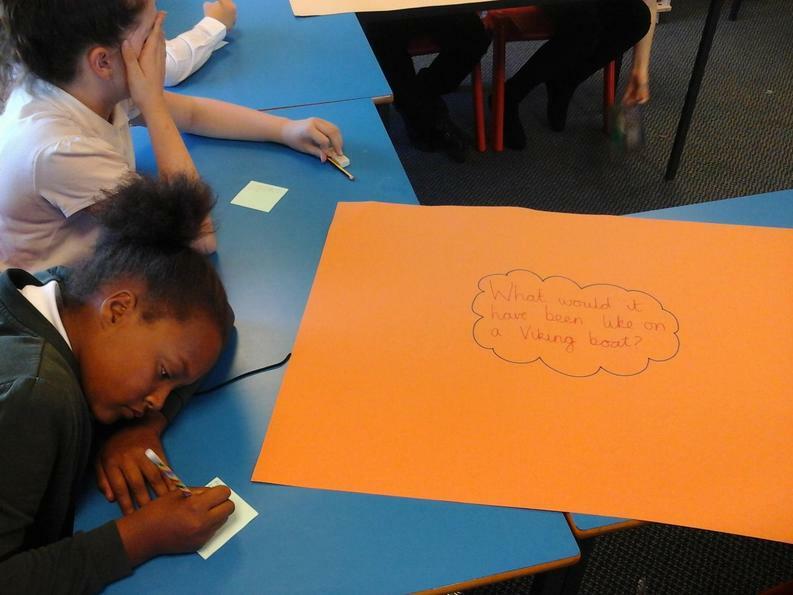 We then imagineered what the invasion may have been like for the Vikings and Anglo-Saxons. 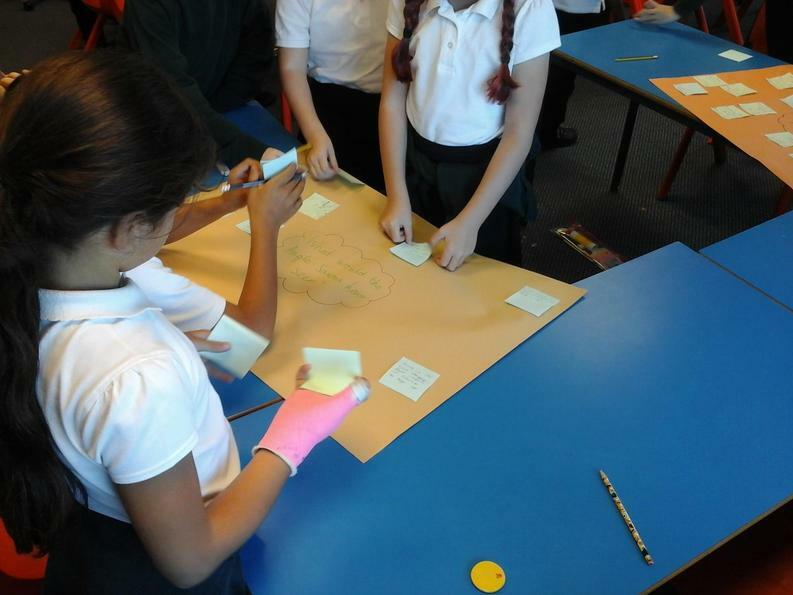 We listened to music and put post its around the room to answer some key questions. 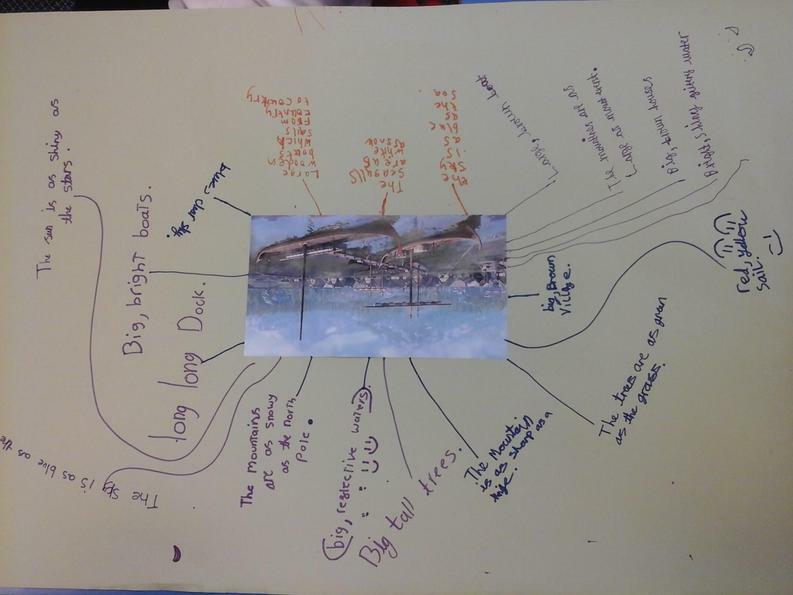 After sharing many ideas, we focused on one picture of the Vikings attacking the coastline of Britain. 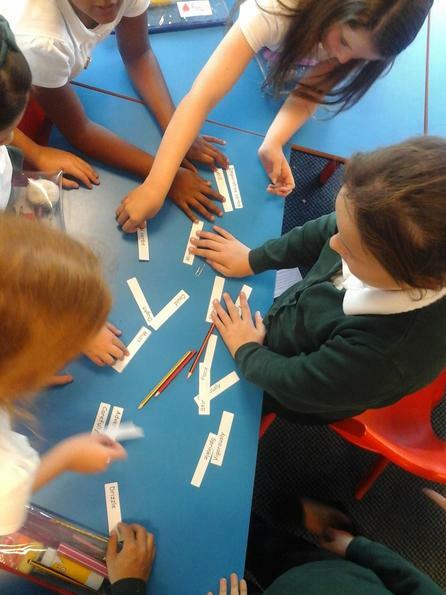 We generated some sentences in SPAG including relative clauses to describe the nouns in the picture. 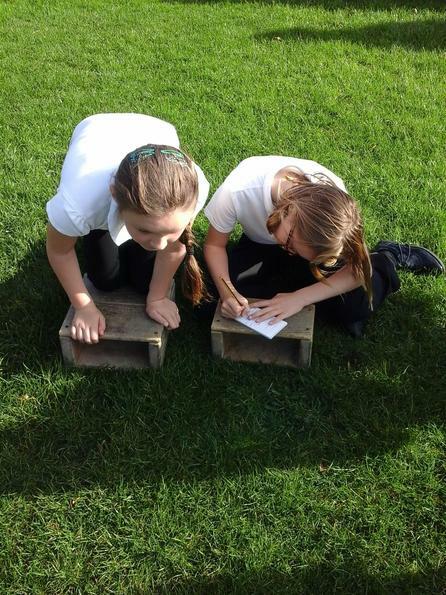 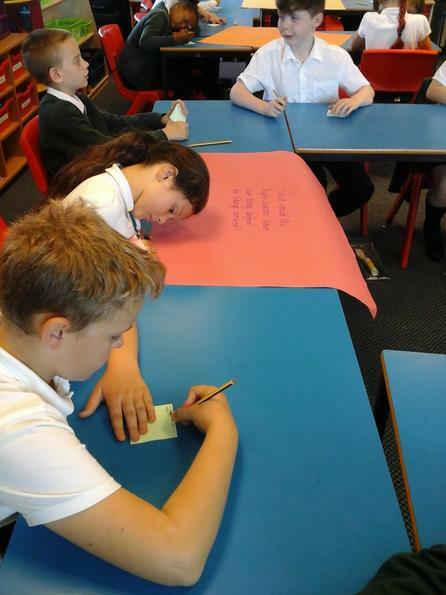 Then wrote setting descriptions to outline what was happening during the invasion. 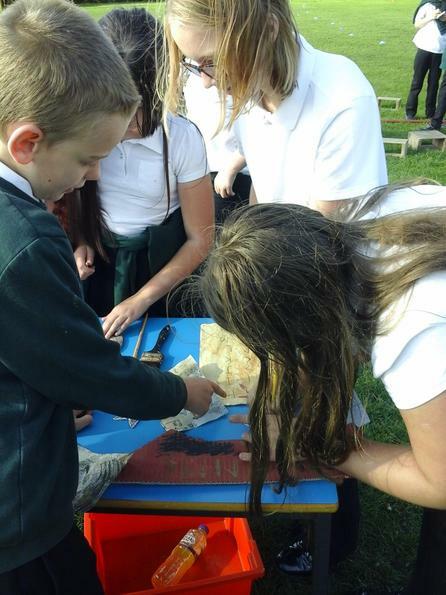 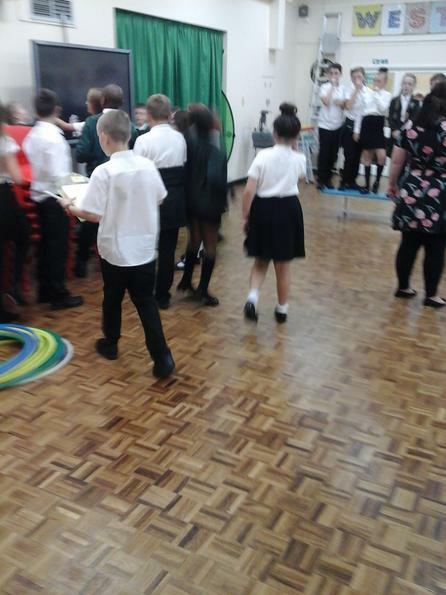 It was time for the Anglo-Saxon banquet! 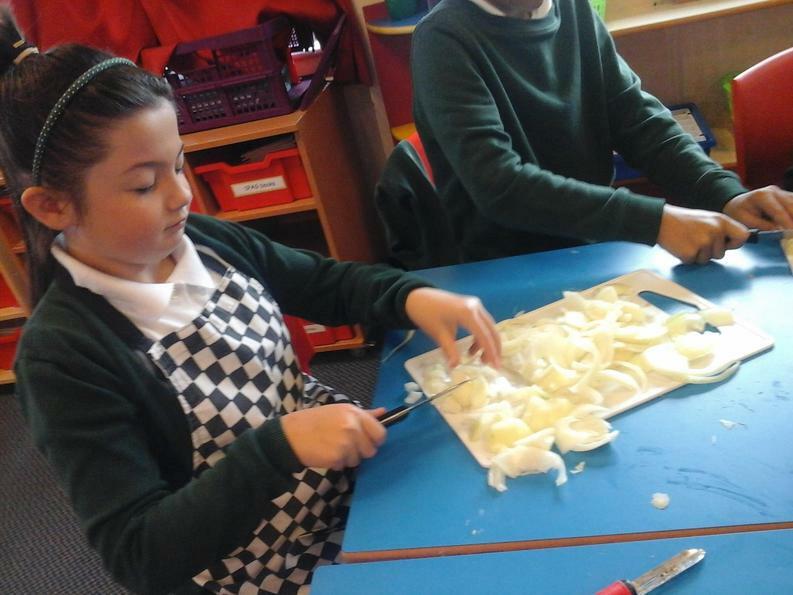 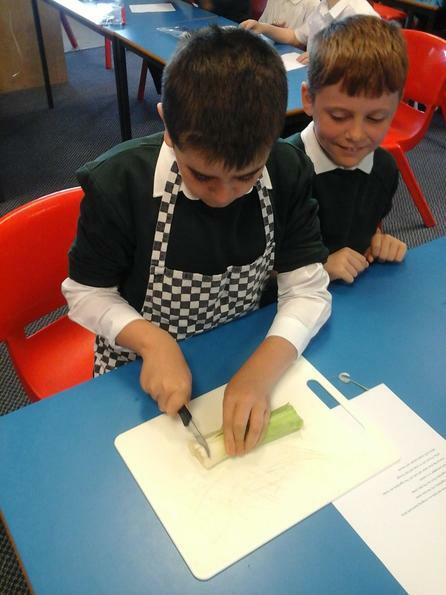 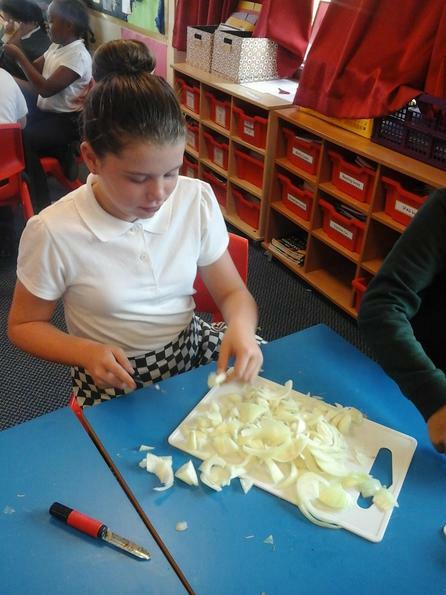 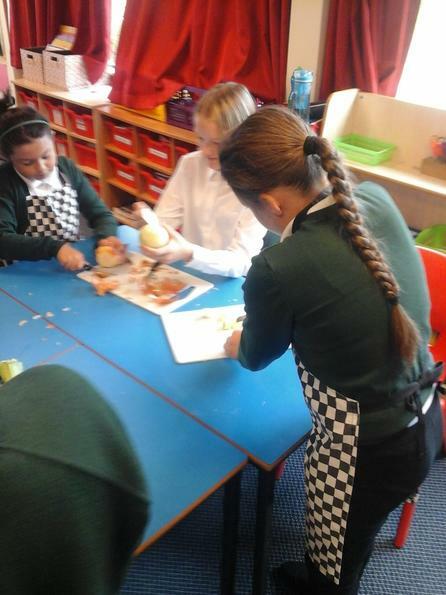 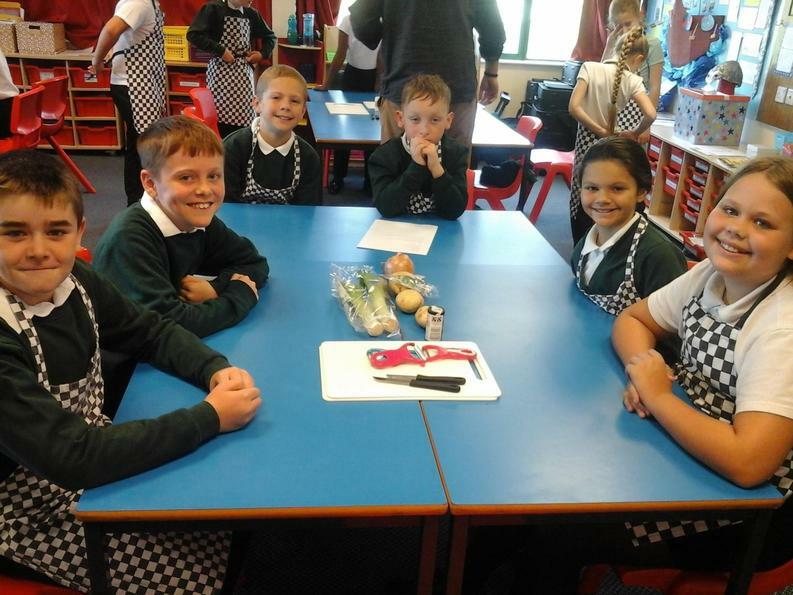 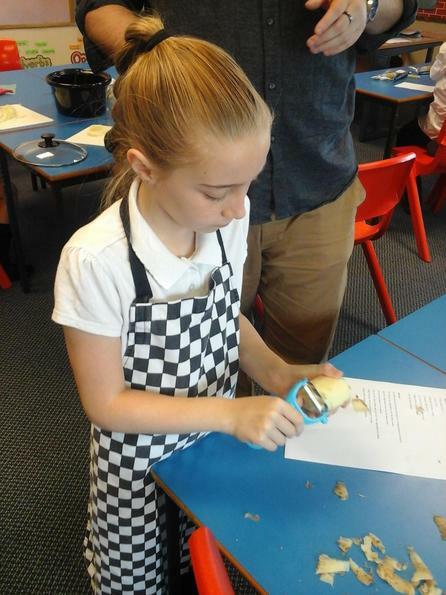 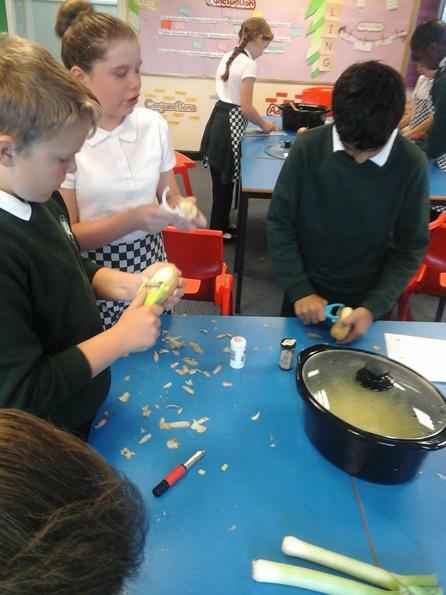 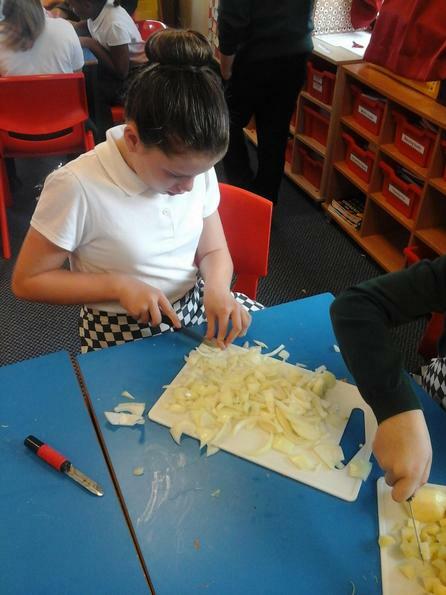 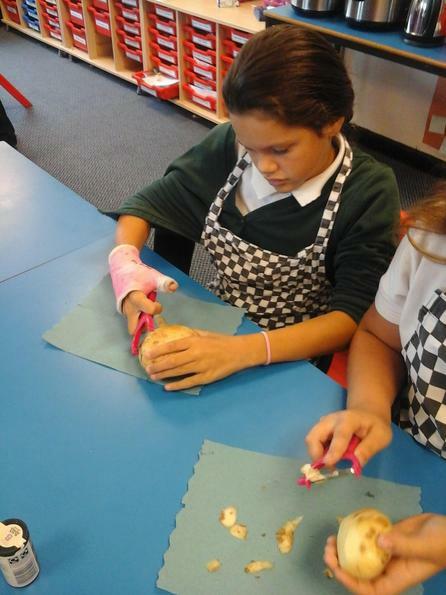 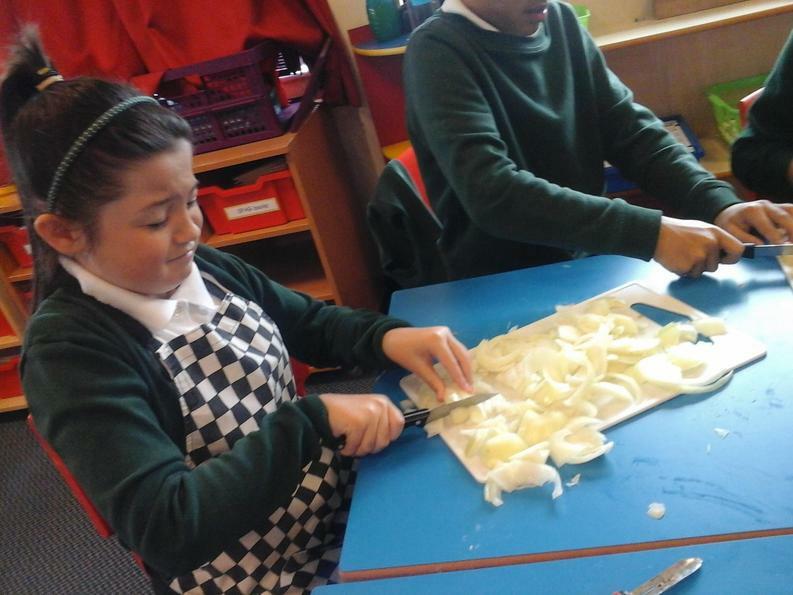 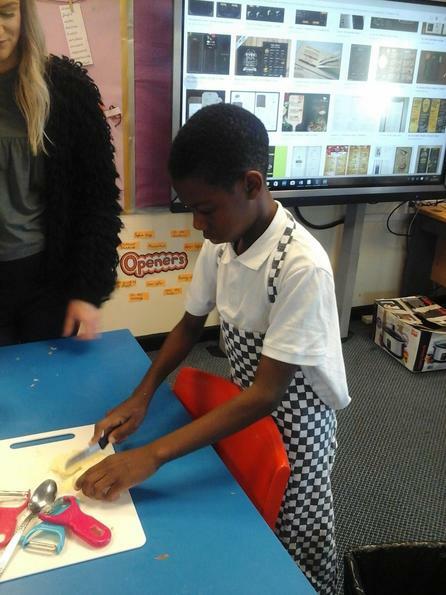 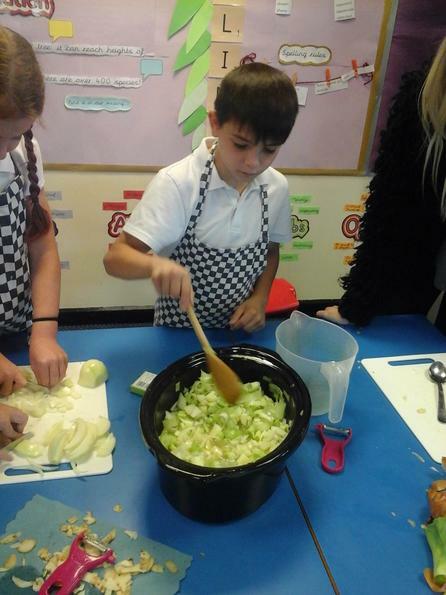 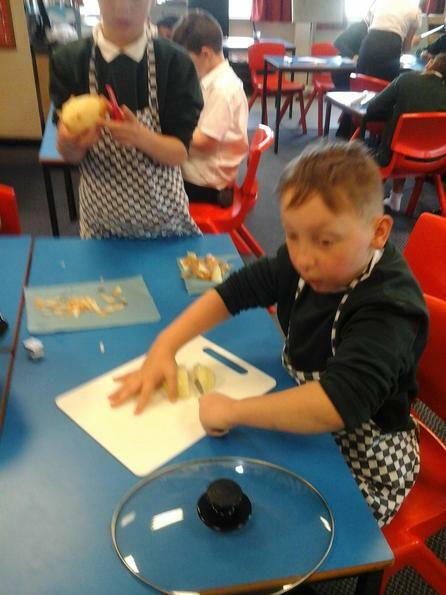 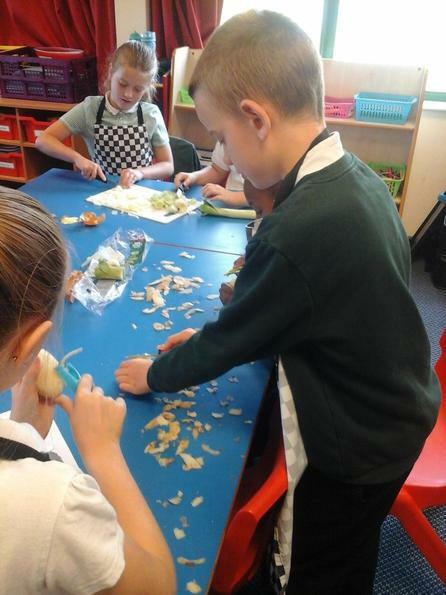 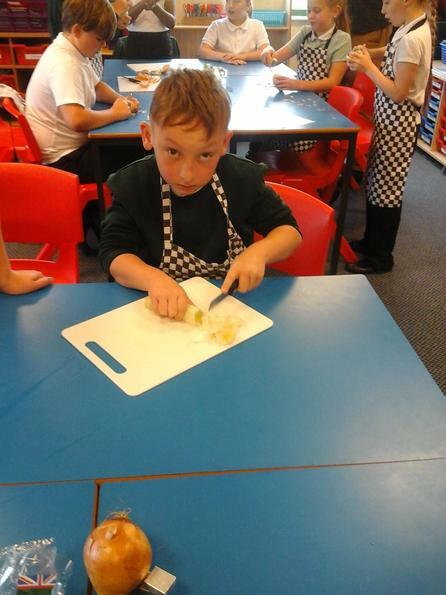 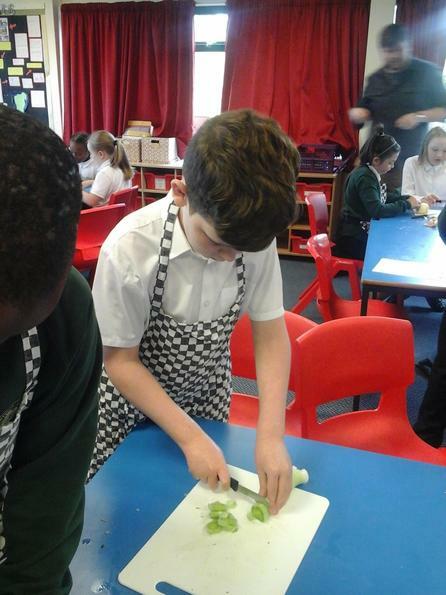 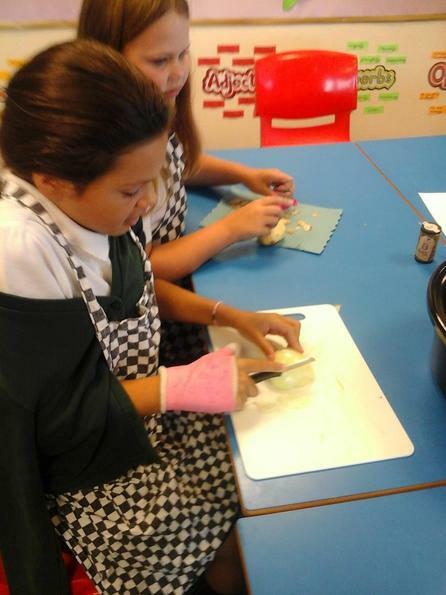 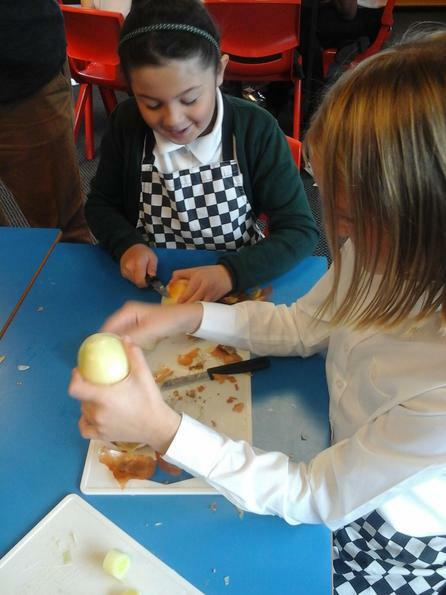 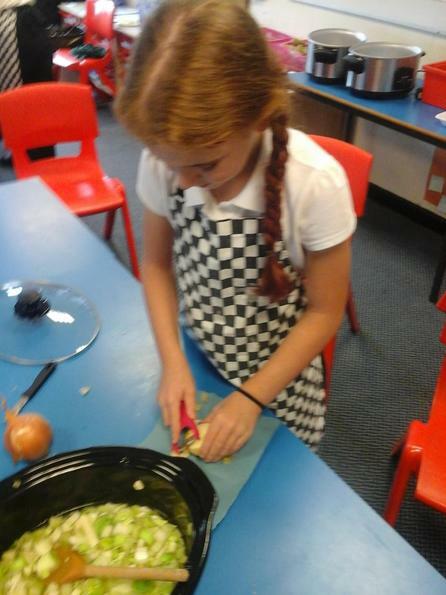 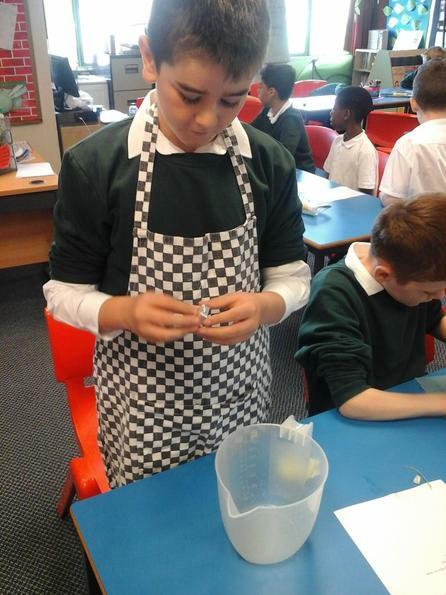 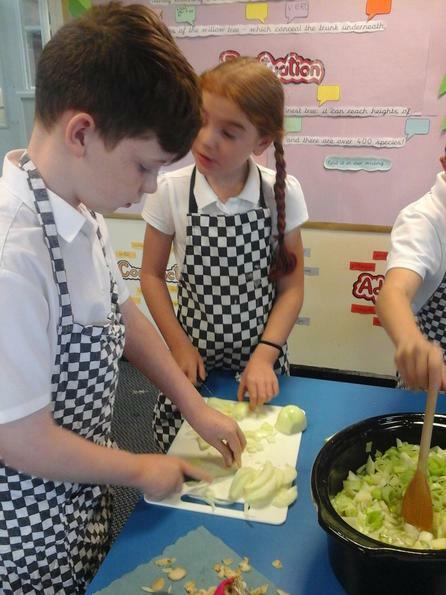 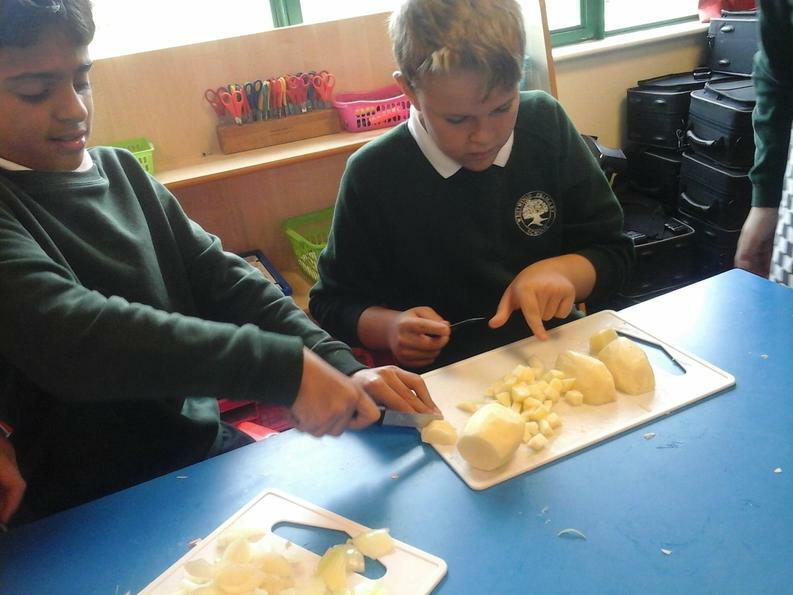 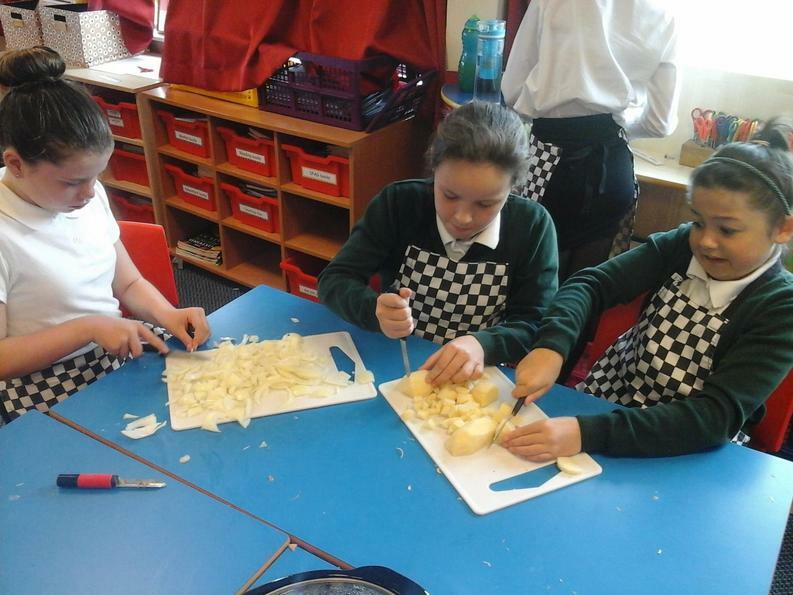 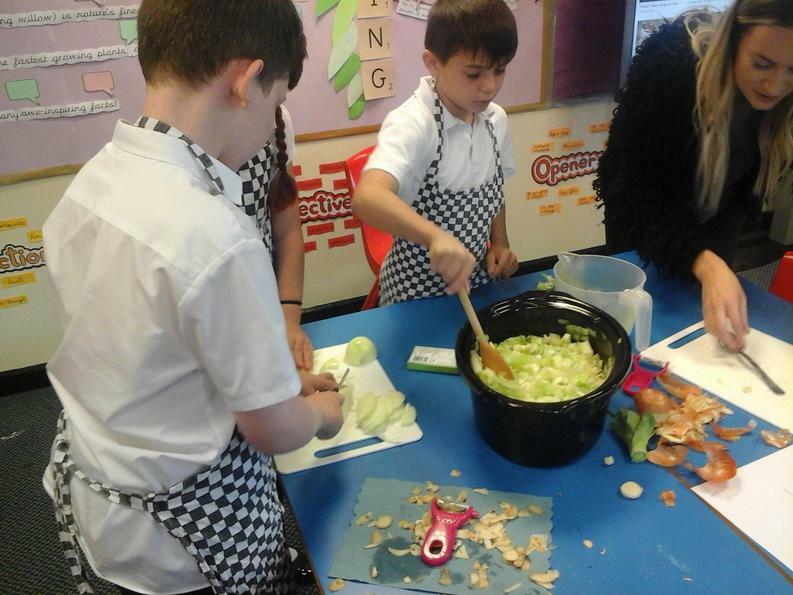 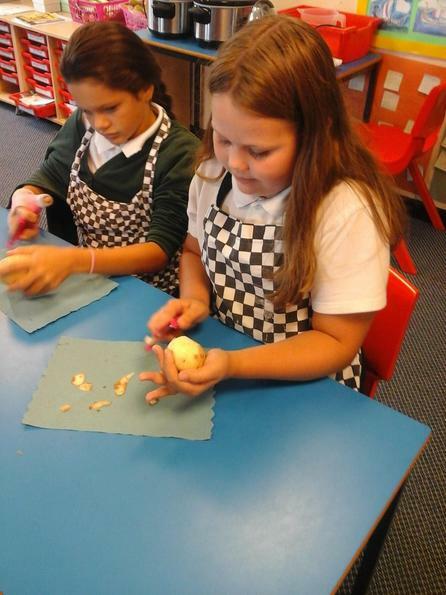 Along with classes Sycamore and Rowan, the children made a 3 course meal. 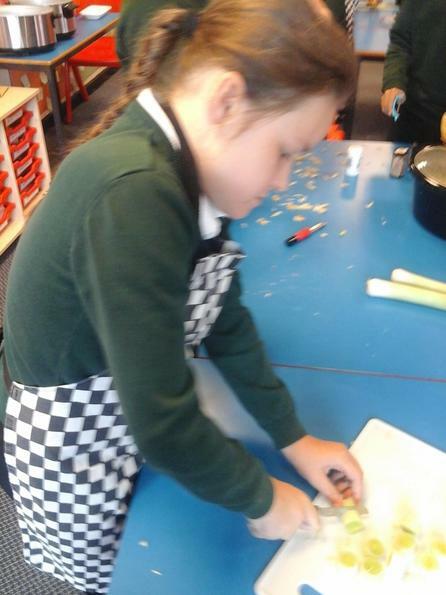 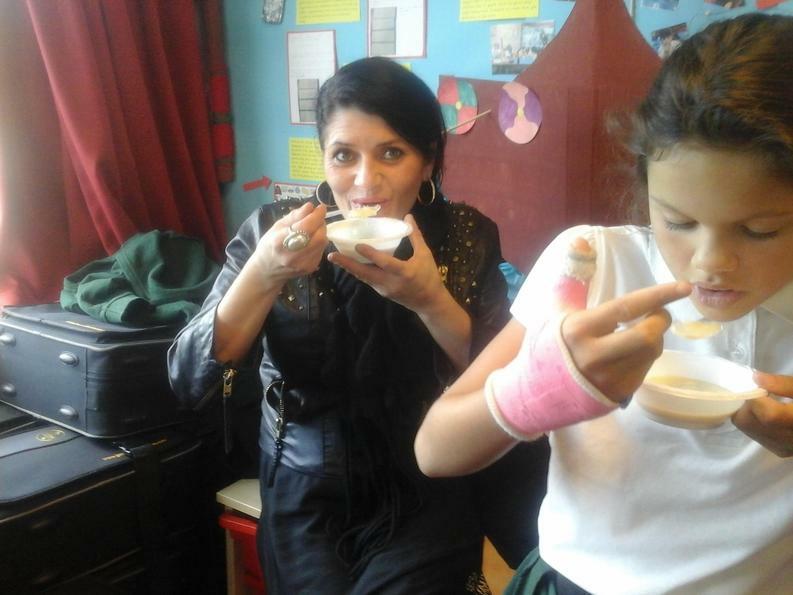 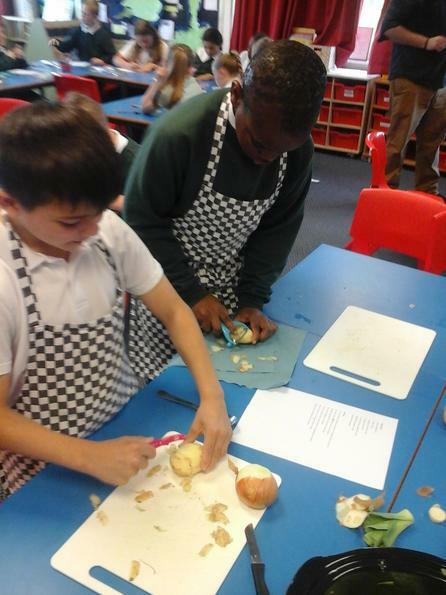 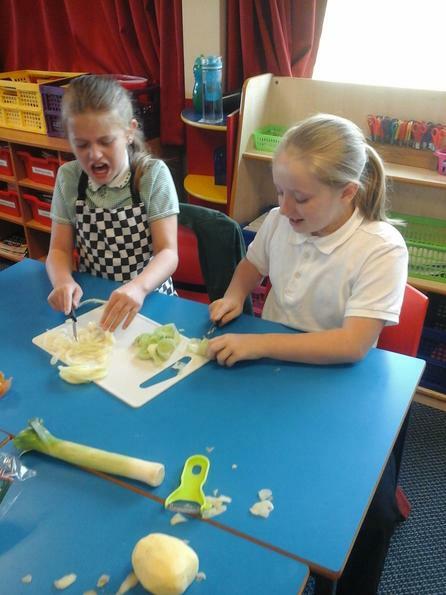 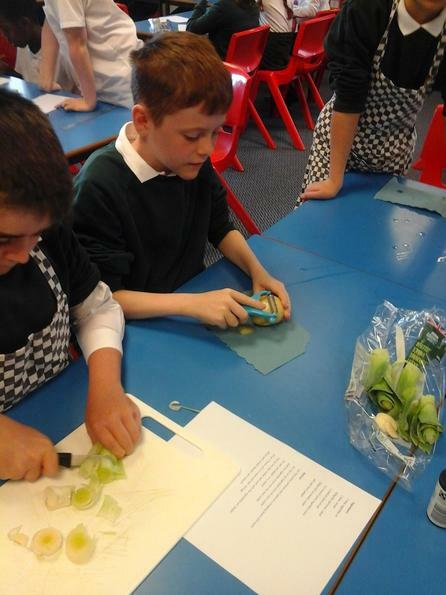 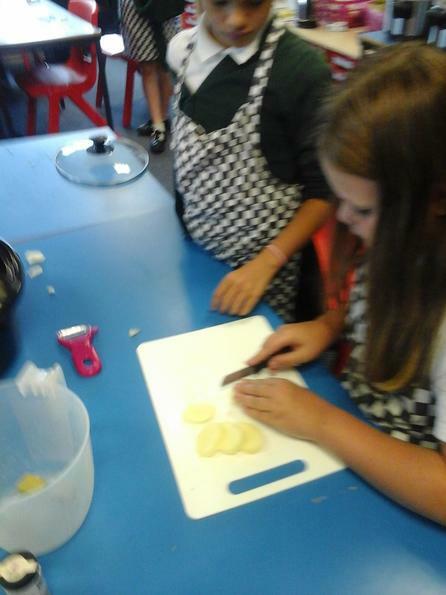 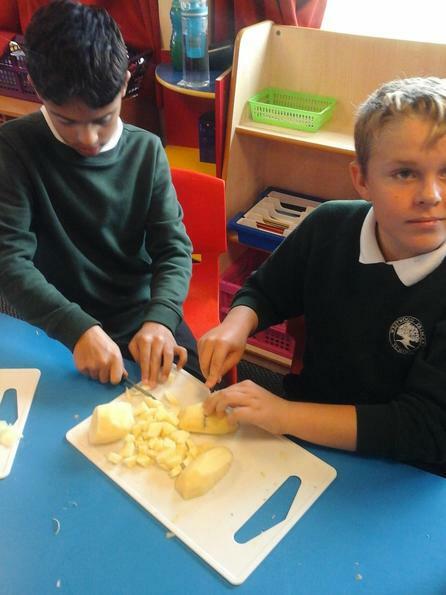 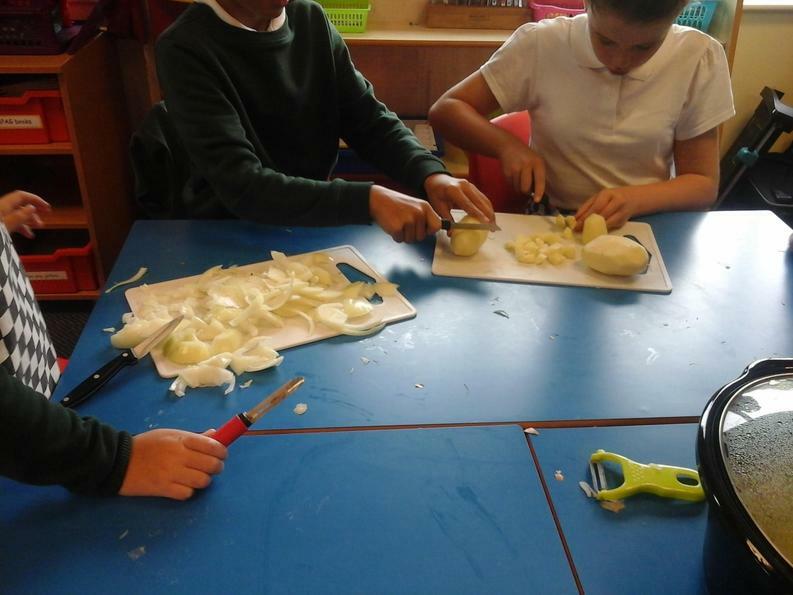 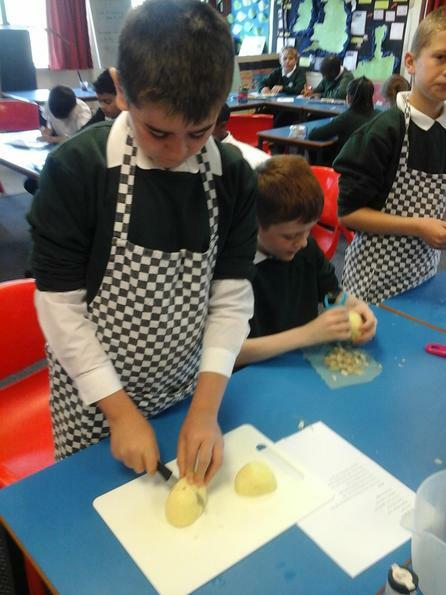 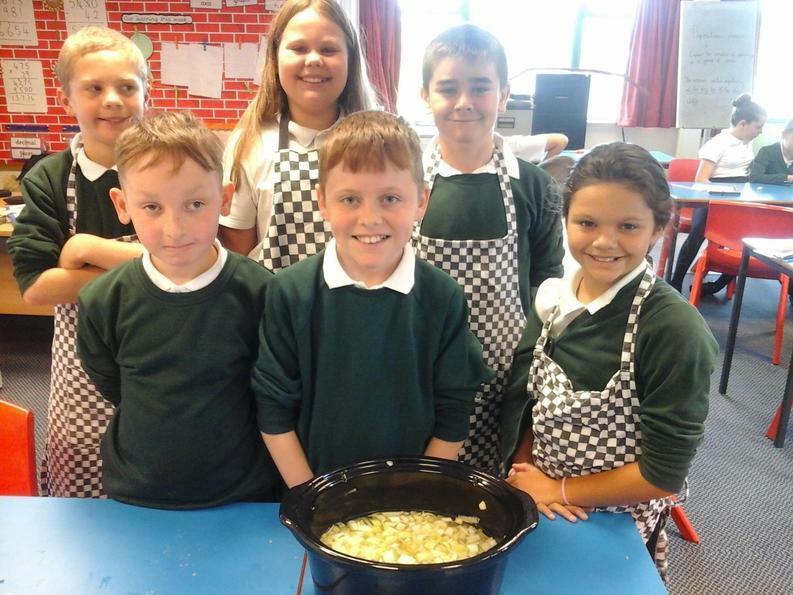 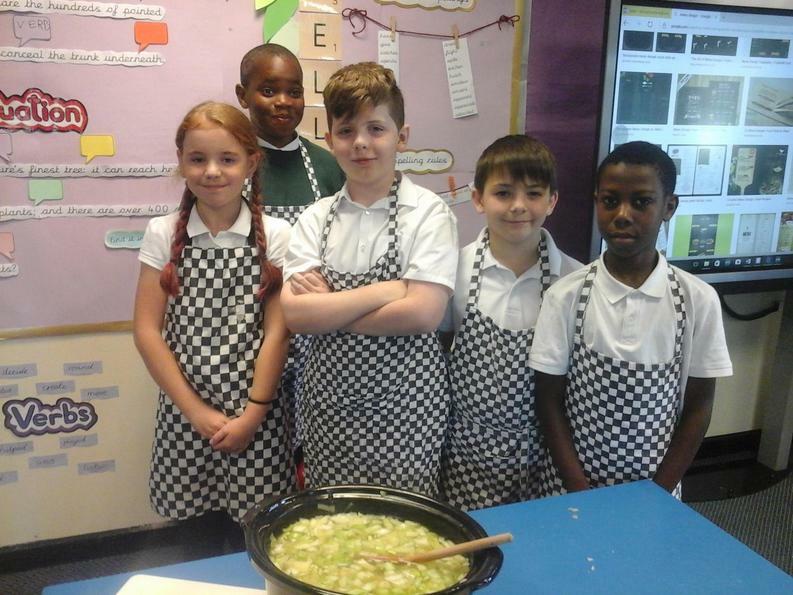 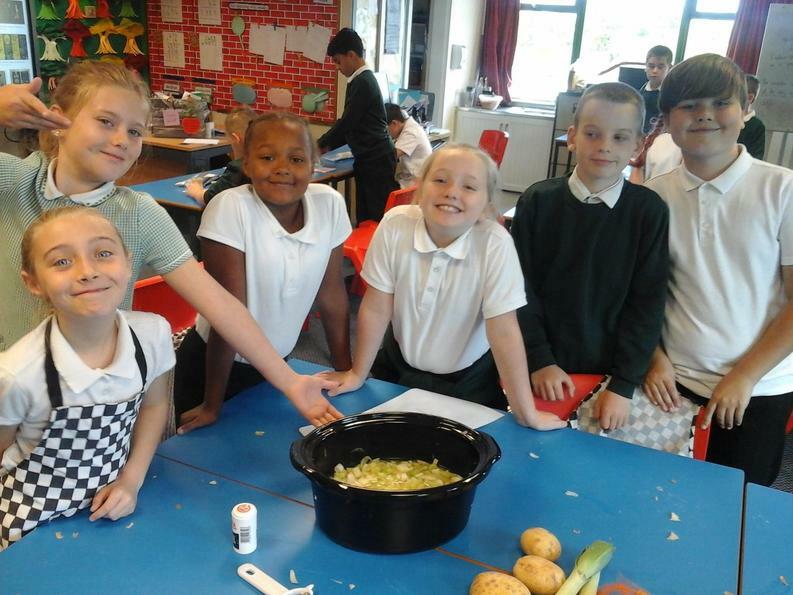 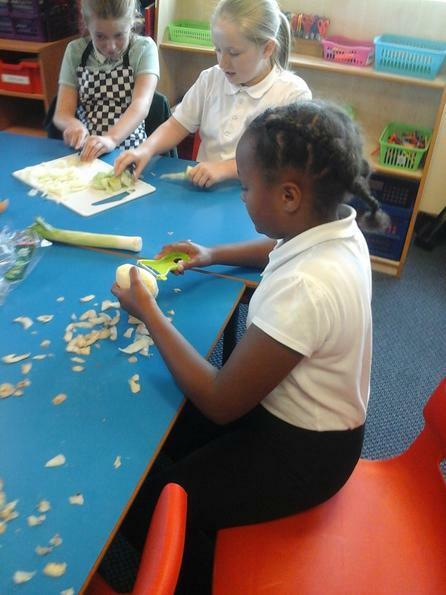 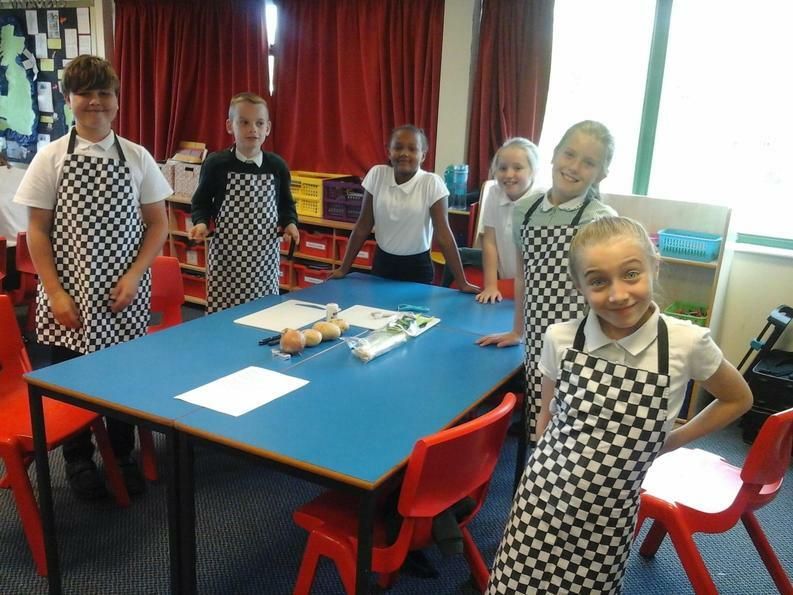 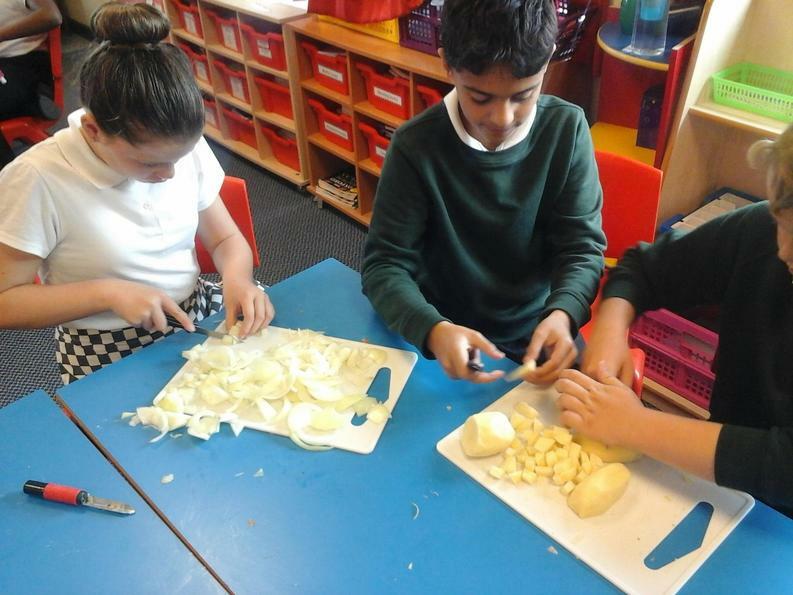 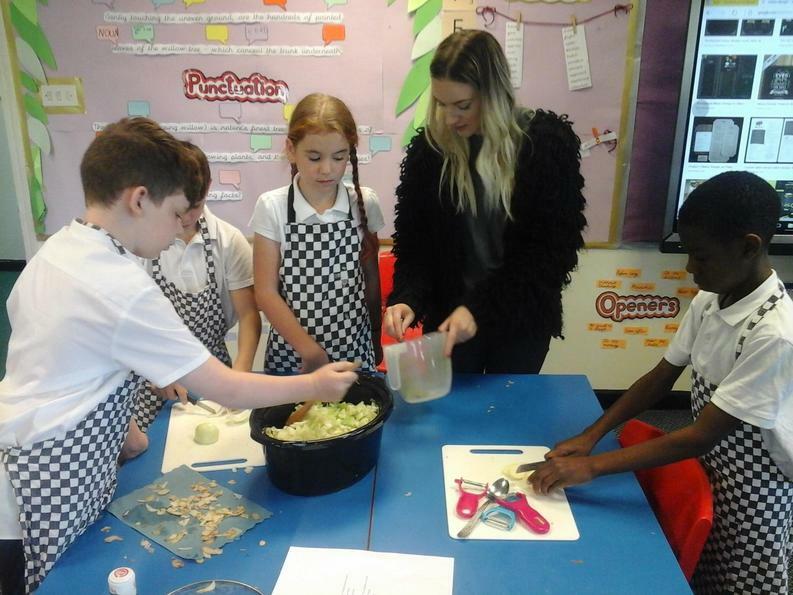 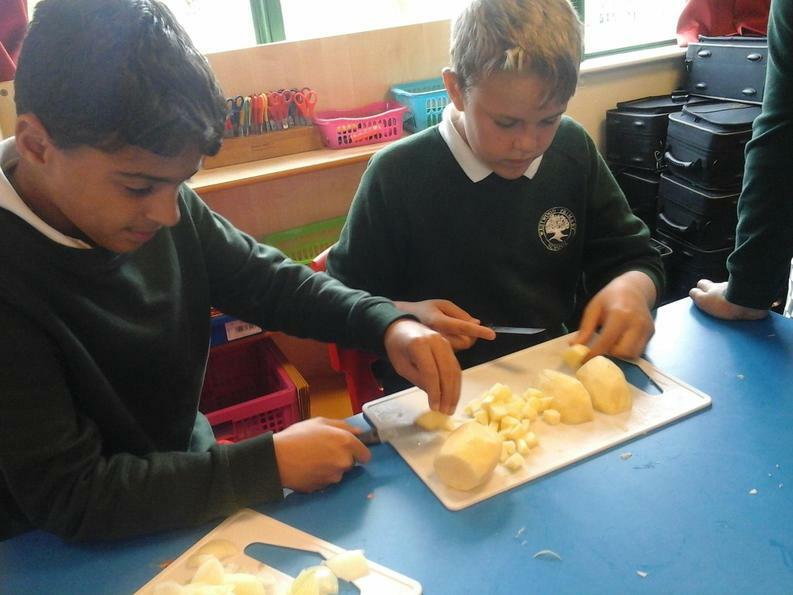 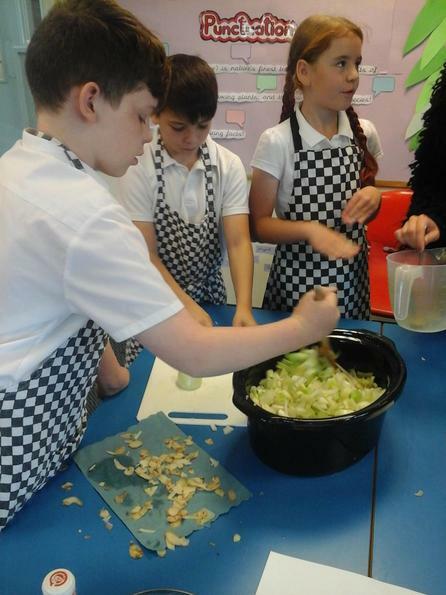 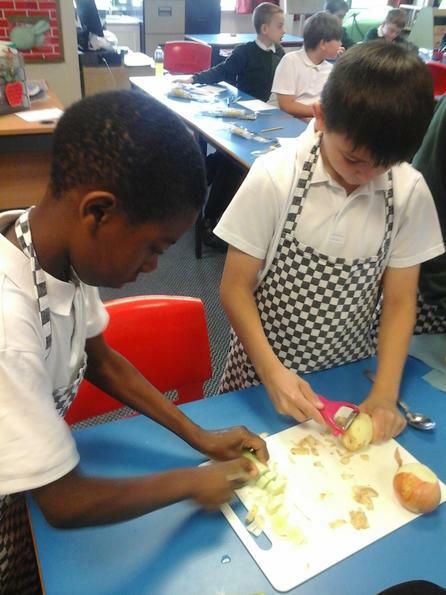 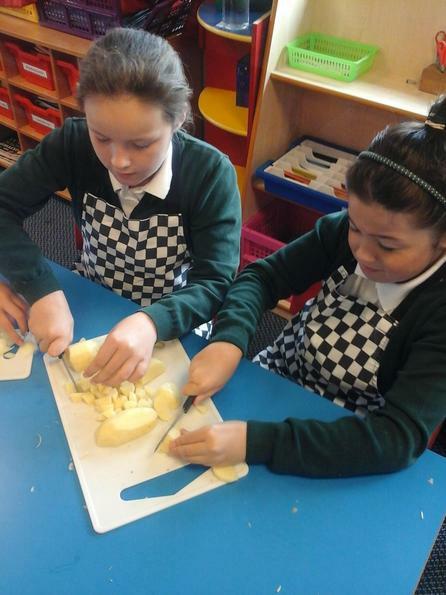 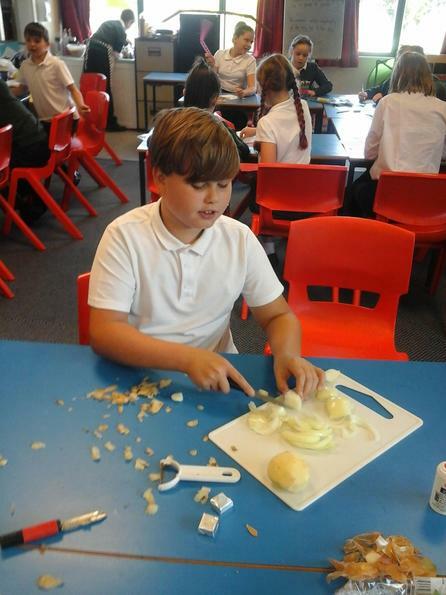 In our class we prepared the starter: leek and potato soup. 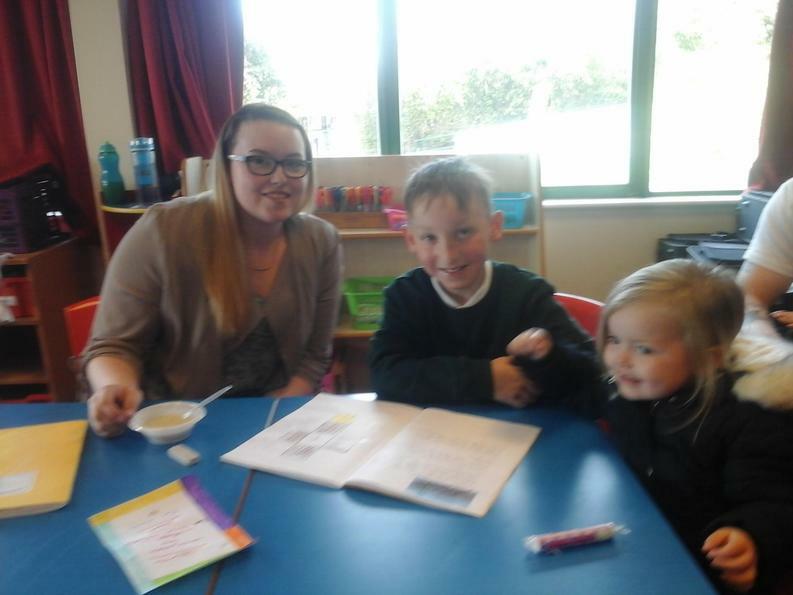 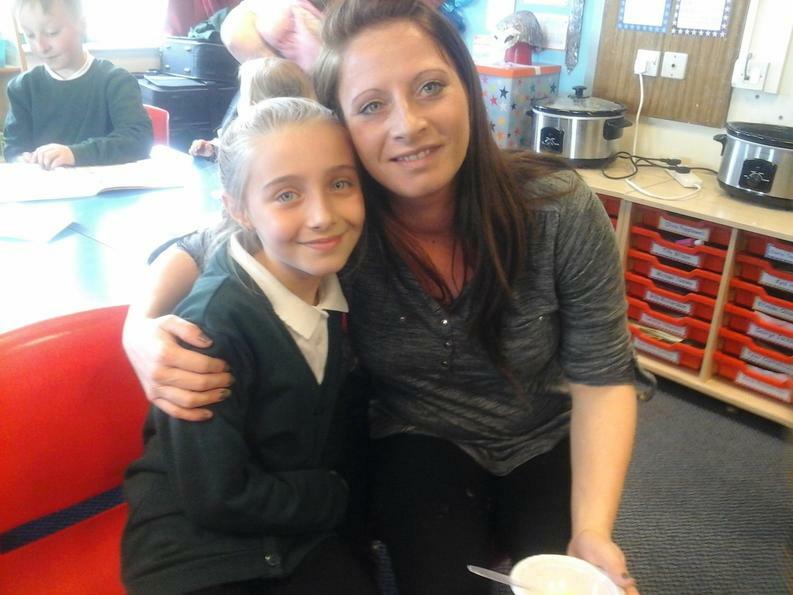 The banquet was a huge success with parents enjoying the soup and looking in the children’s book to see all the work they had been doing. 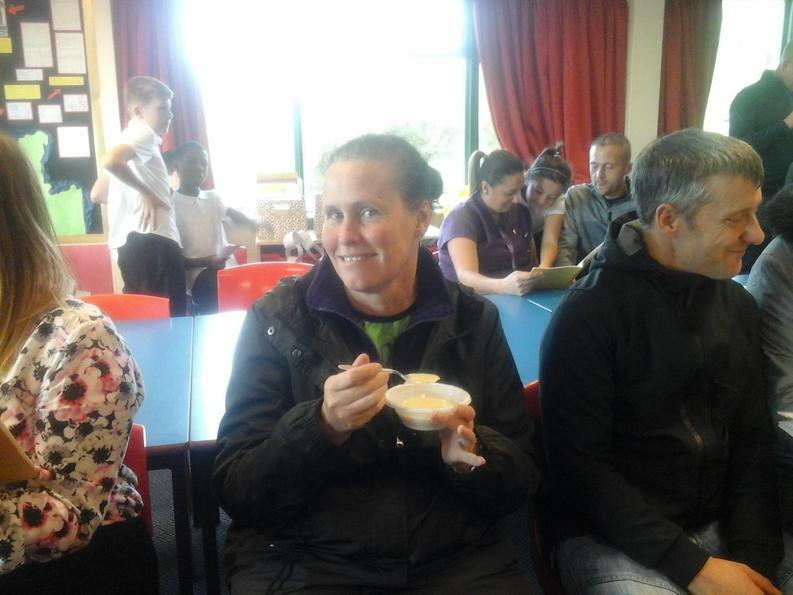 Following the banquet, lots of parents commented on how tasty the soup was so we decided to write a set of instructions for the children to take home. 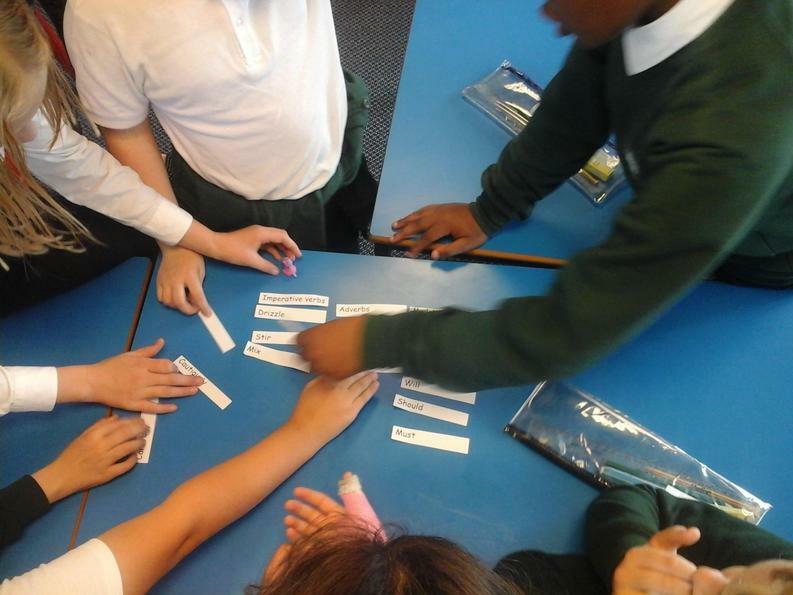 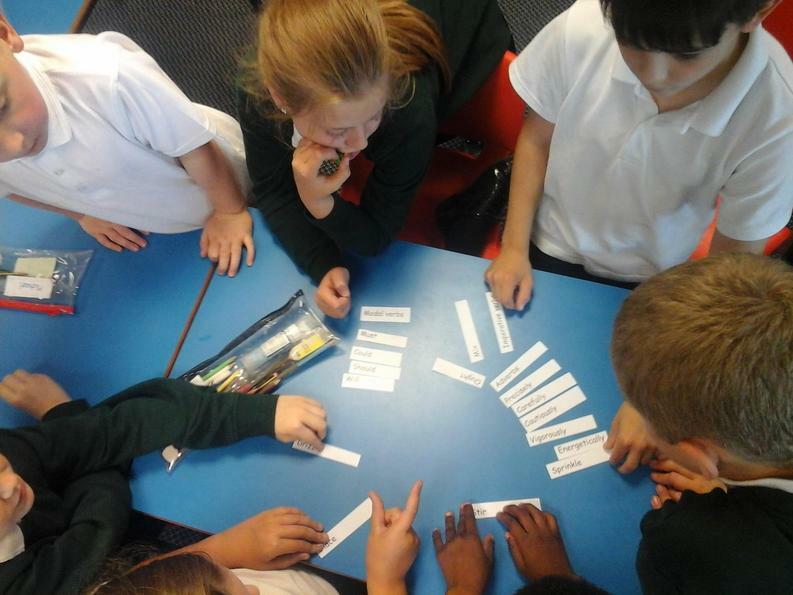 In order to write our instructions, we recapped modal and imperative verbs by sorting them into groups. 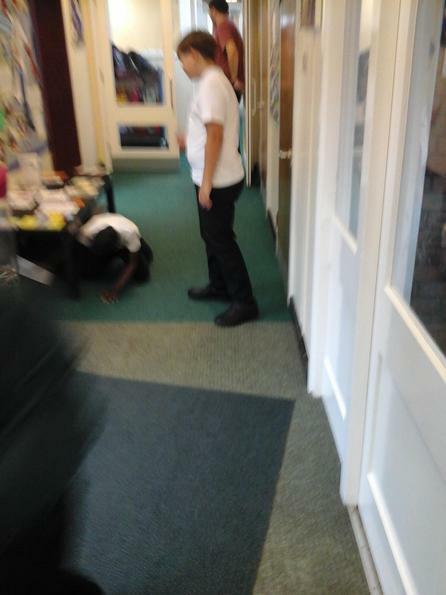 Osmund and Hilda then introduced us to their craftsman father. 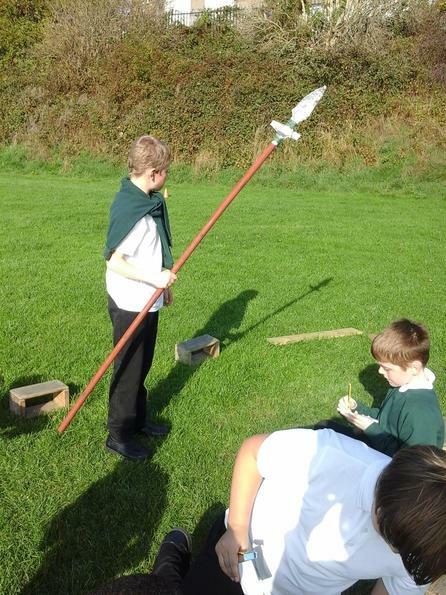 He needed our help in selling the weapons he made to the Anglo-Saxon warriors heading into battle with the Vikings. 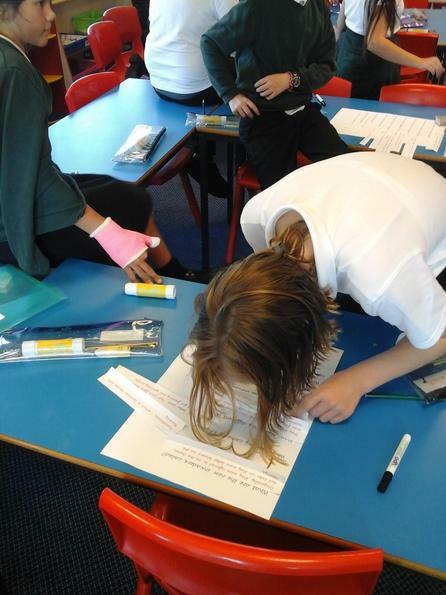 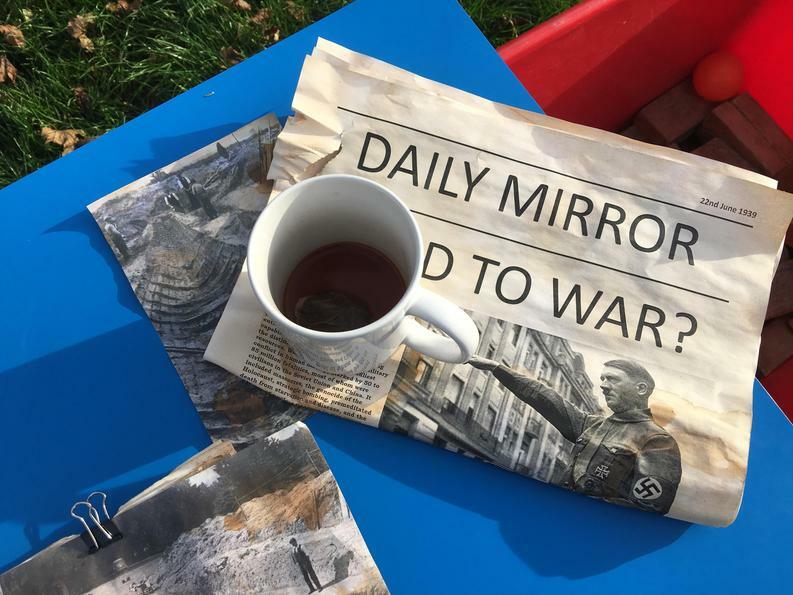 The children first learnt about the weapons by reading fact files and transferring important information into their own. 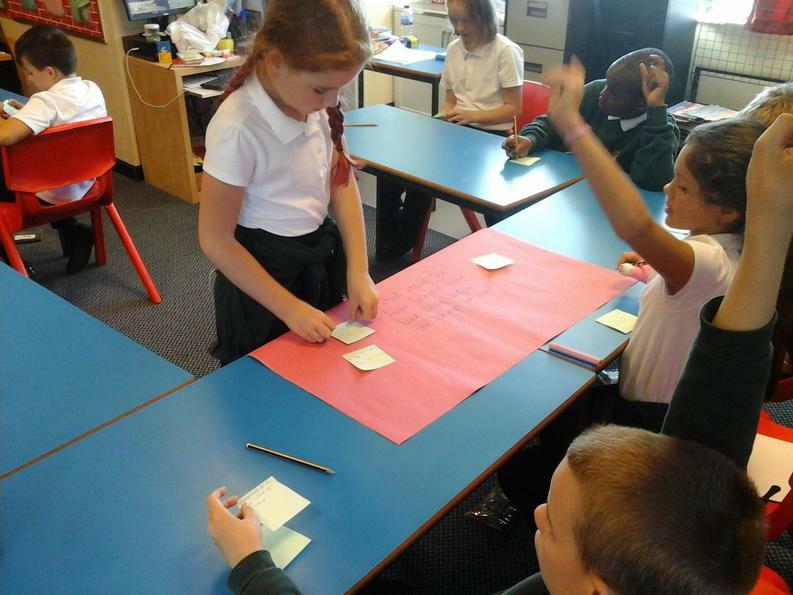 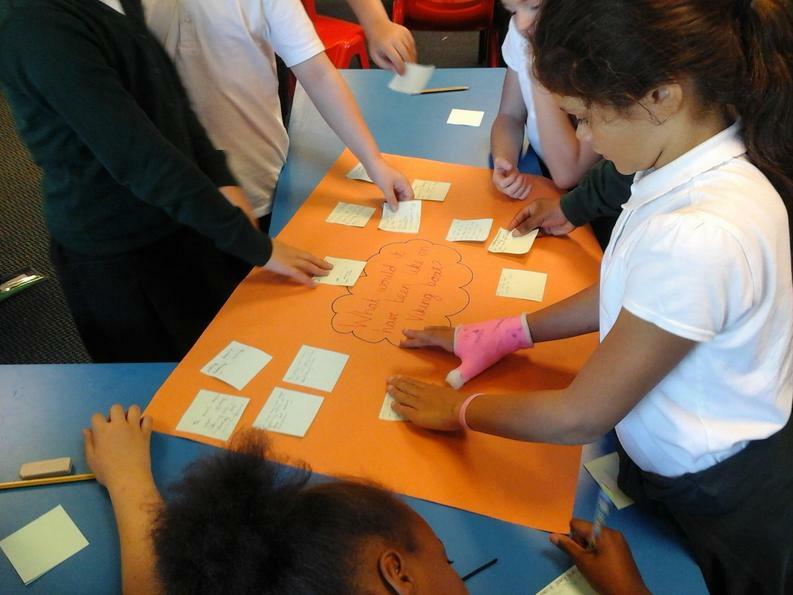 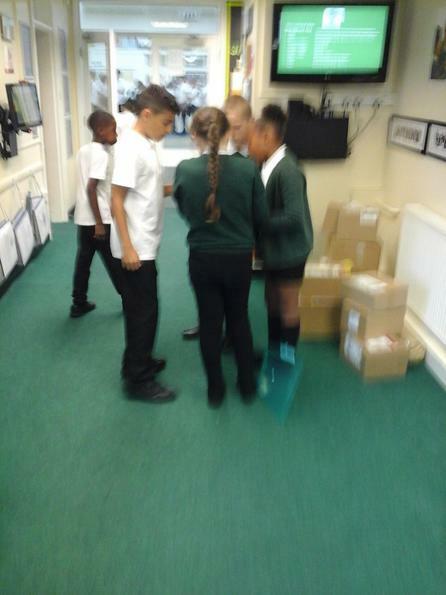 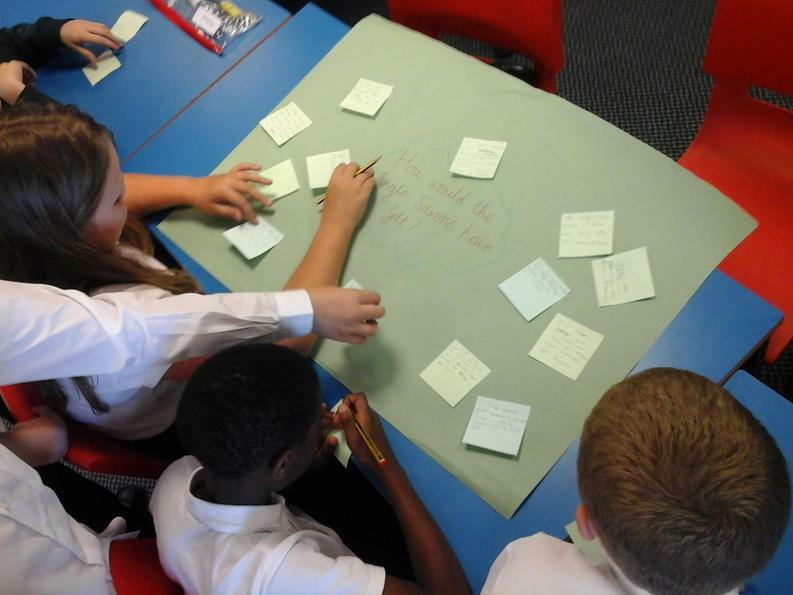 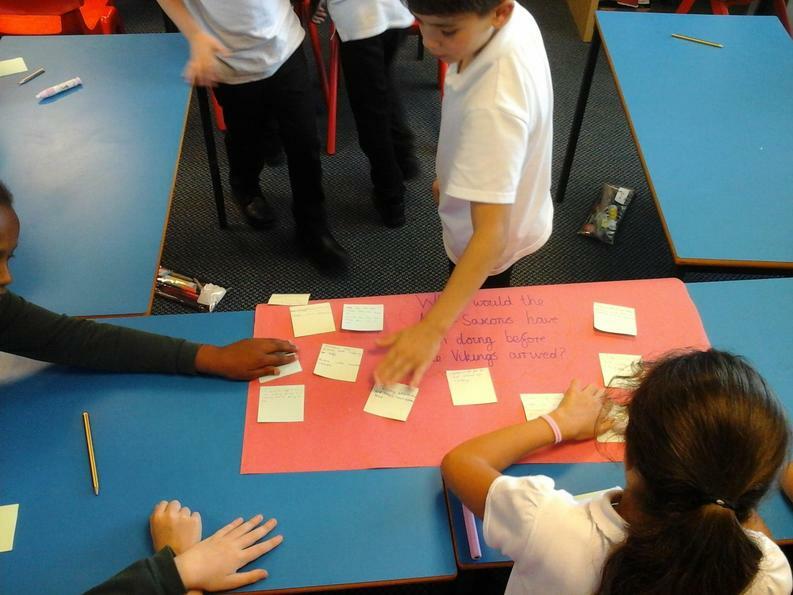 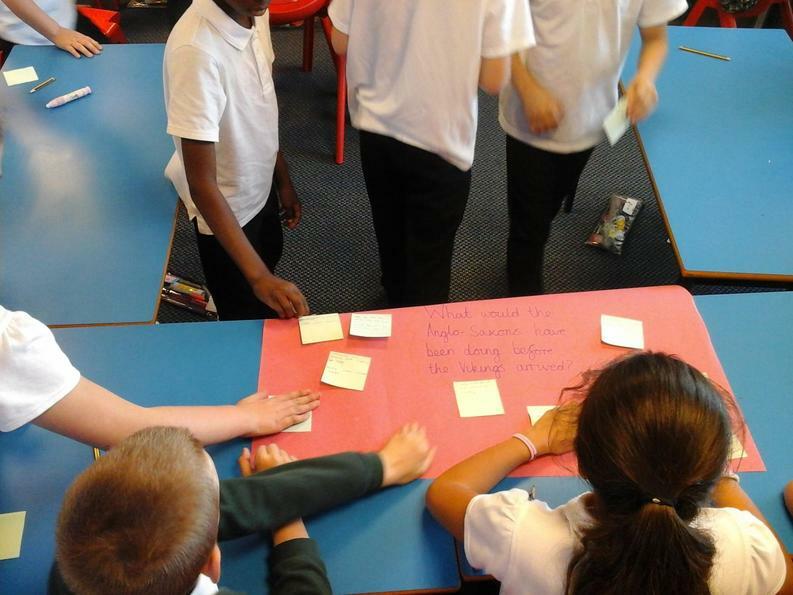 They then explored the use of persuasive features to write a ‘persuasive post it’ to describe their weapon. 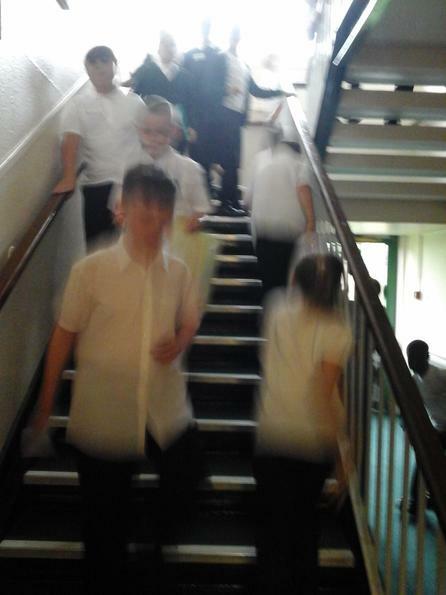 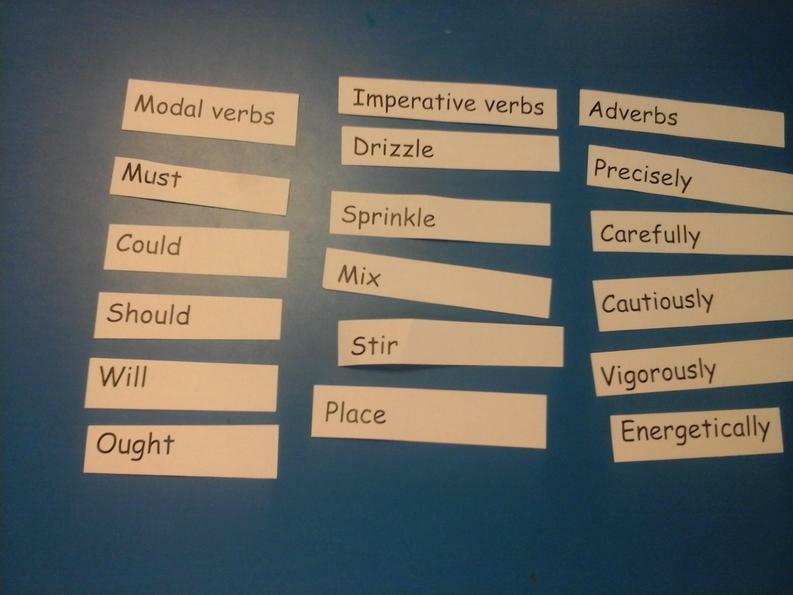 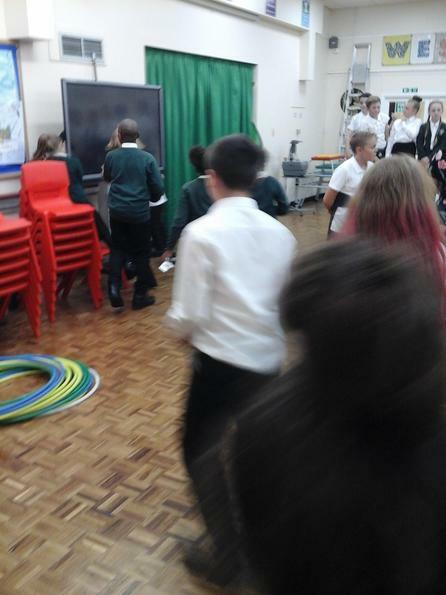 The children then completed SPAG activities for the objectives: modal verbs and inverted commas. 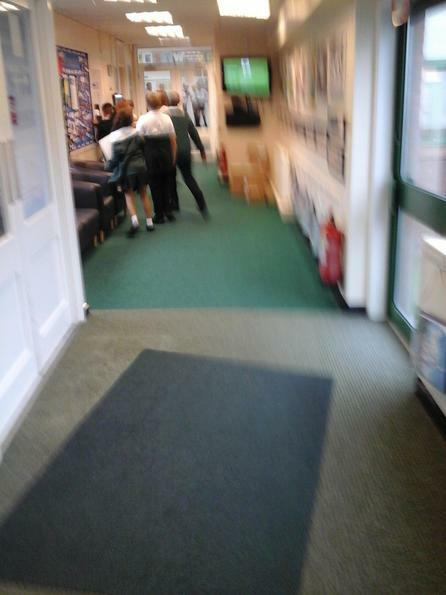 Using all they had learnt, they wrote the adverts. 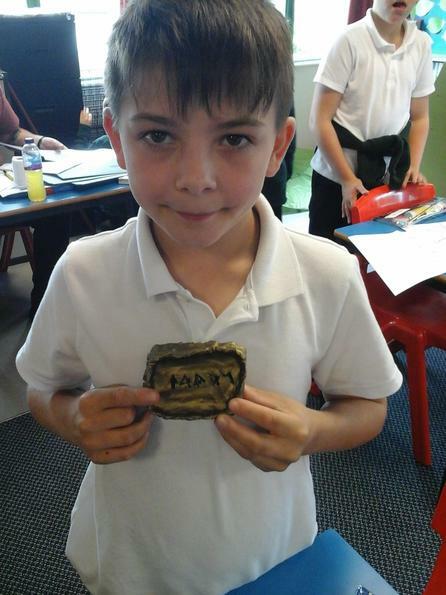 We then really felt like we had experienced life as an Anglo-Saxon through the eyes of Osmund and Hilda so we decided to step into their shoes and visit an Anglo-Saxon village for the day. 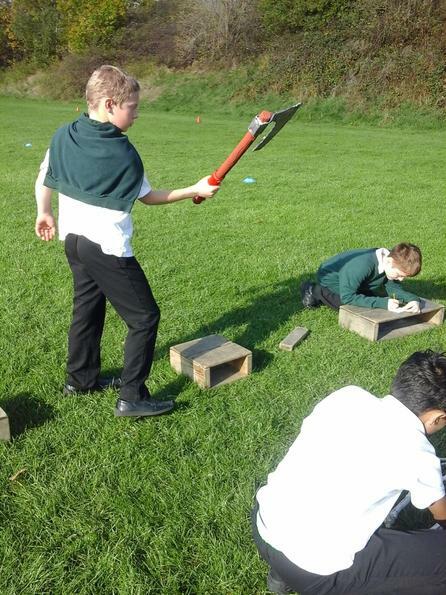 The children dressed up as Anglo-Saxon children, were put into families and completed Anglo-Saxon daily jobs: cooking, farming, weapon practice and even had to protect the village from a Mercian invasion! 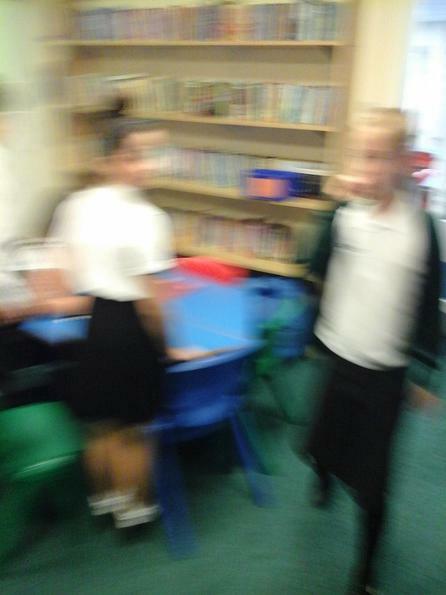 Click here to see all the photos and videos from our trip! 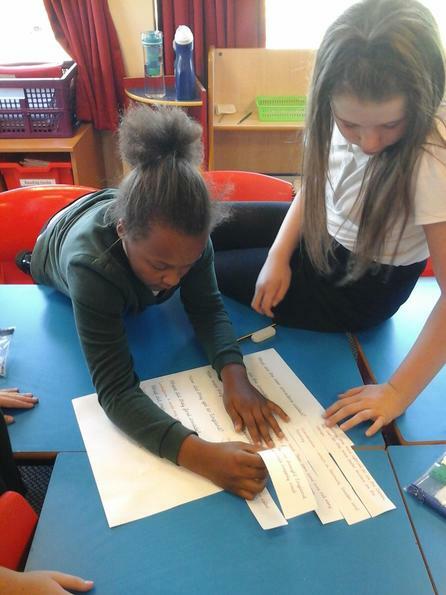 Following the trip, the children wrote detailed recounts of their experience throughout the day. 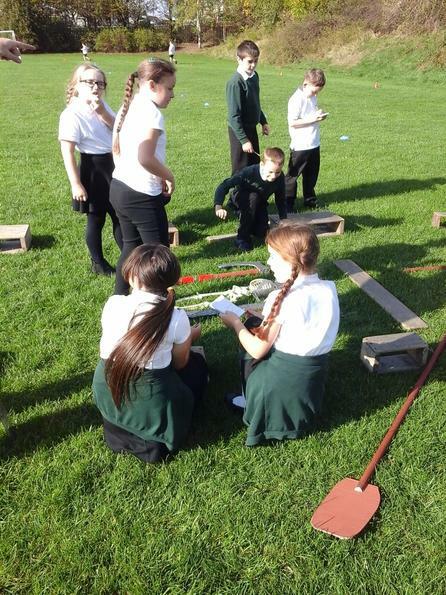 Osmund and Hilda then told us that after many years of Viking invasions, King Alfred the Great helped the Anglo-Saxons and Vikings live together. 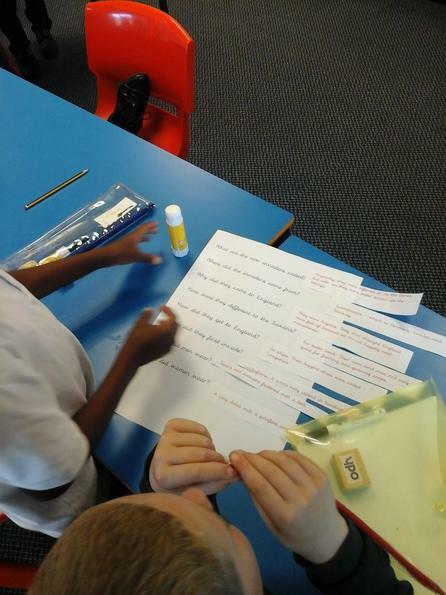 The children found out many facts about this important king through completing a Burn 2 Learn. 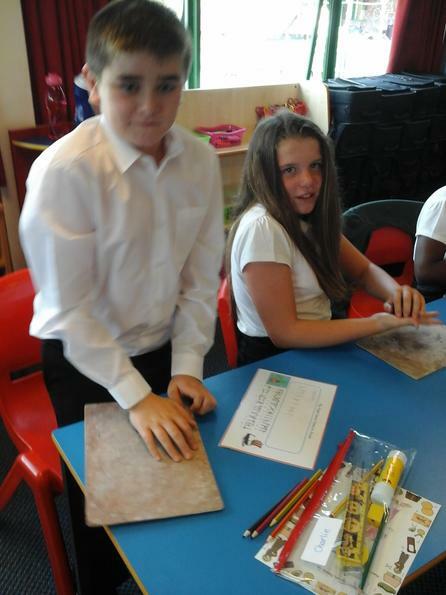 They then wrote biographies about his life and drew portraits of him. 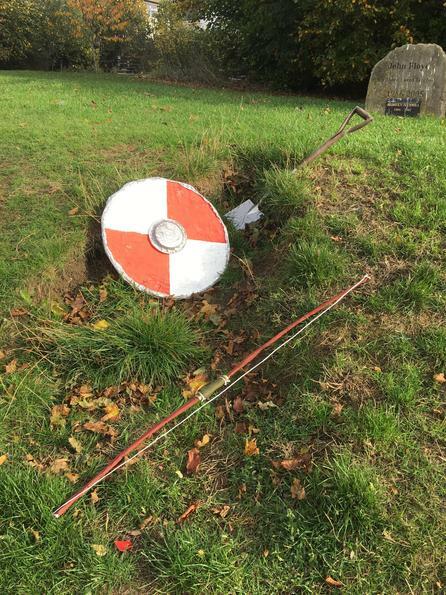 To bring the adventure to a close, we fast forwarded to 1939 where an important Anglo-Saxon discovery was made at Sutton Hoo. 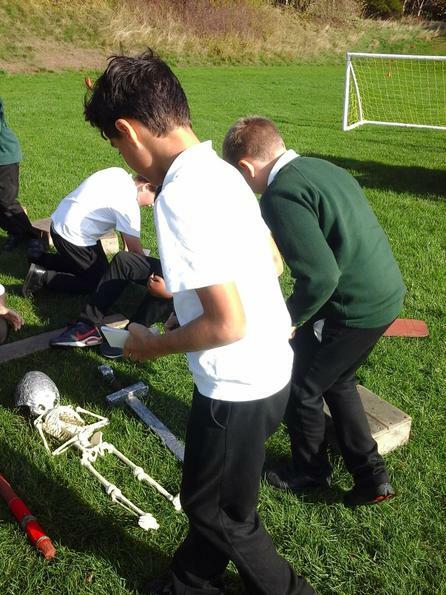 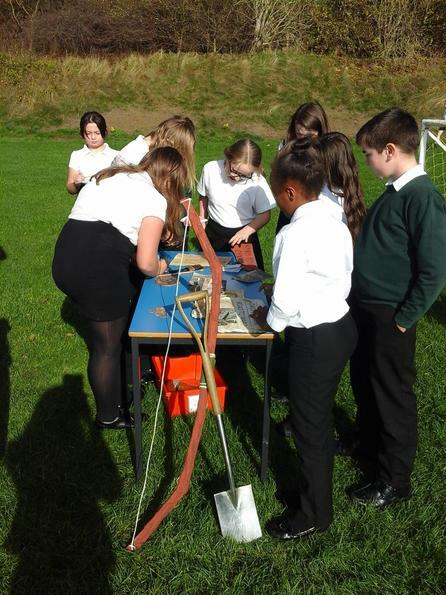 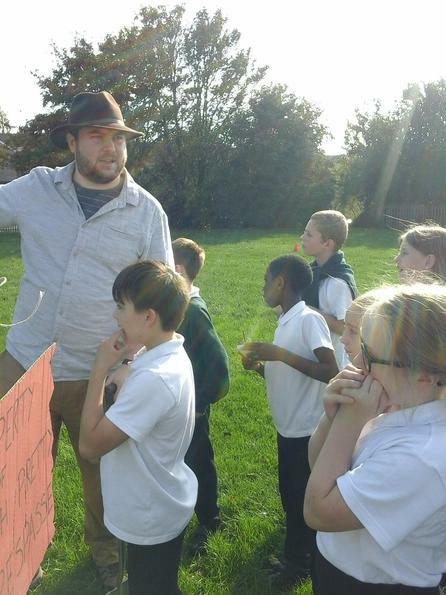 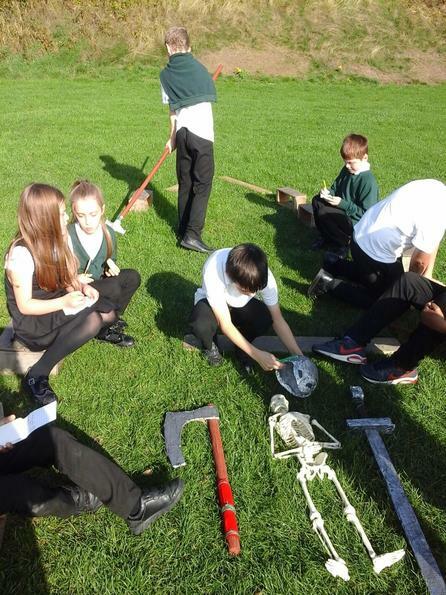 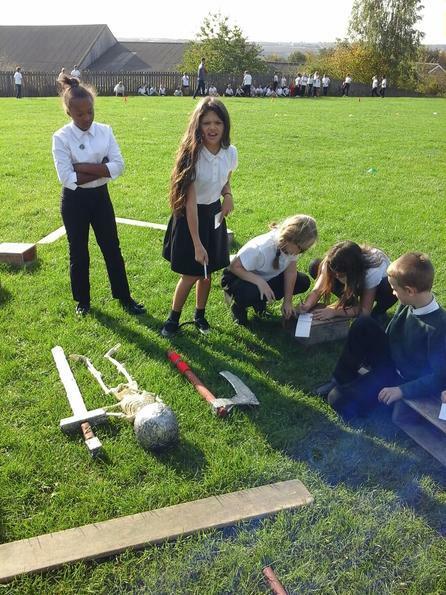 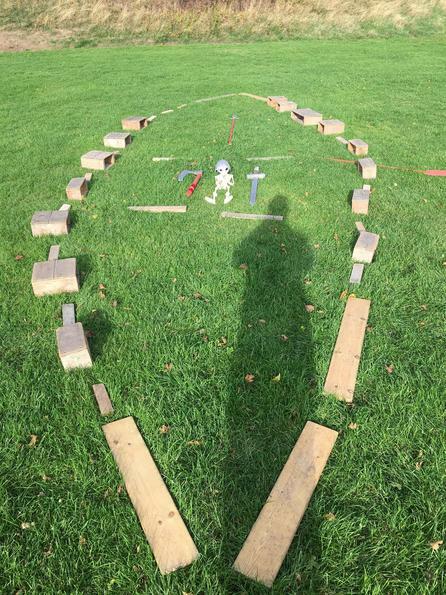 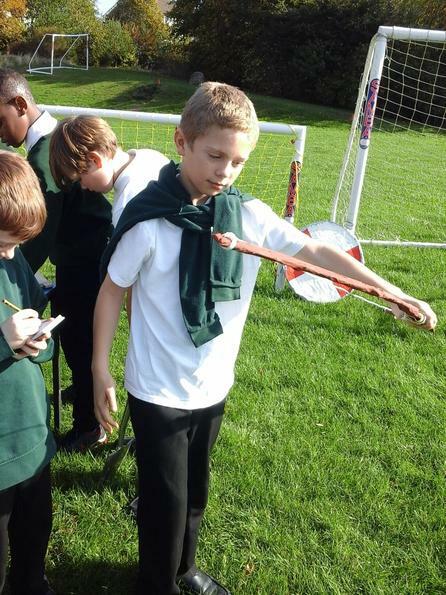 The children went to the field to investigate the mysterious discovery of the remnants of a long boat, the bones of a king, weapons, runes messages and artefacts like jewellery and a belt buckle. 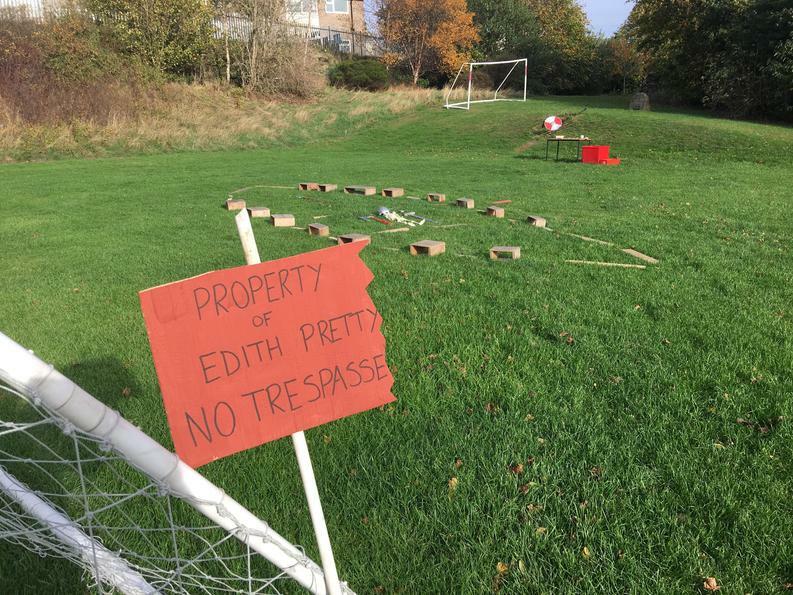 They ‘met’ Edith Pretty (the landowner) and Basil Brown (the archaeologist), who gave them some facts. 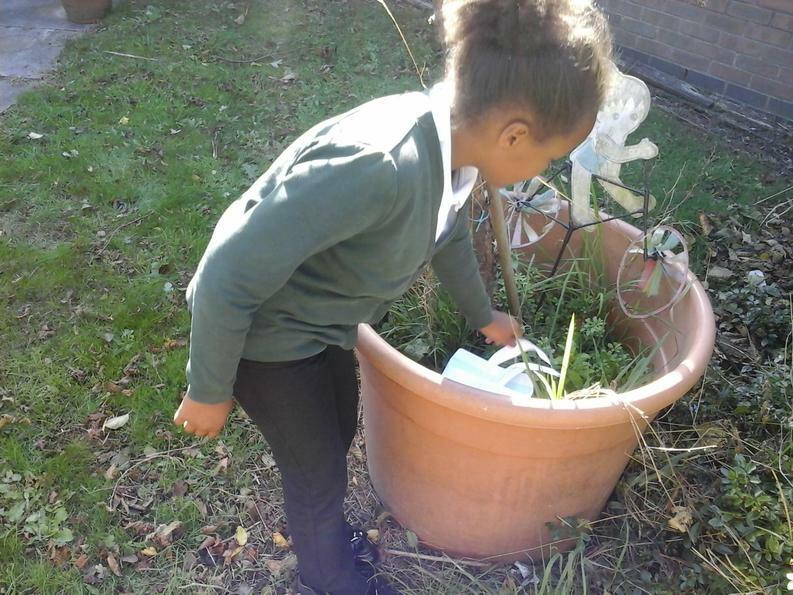 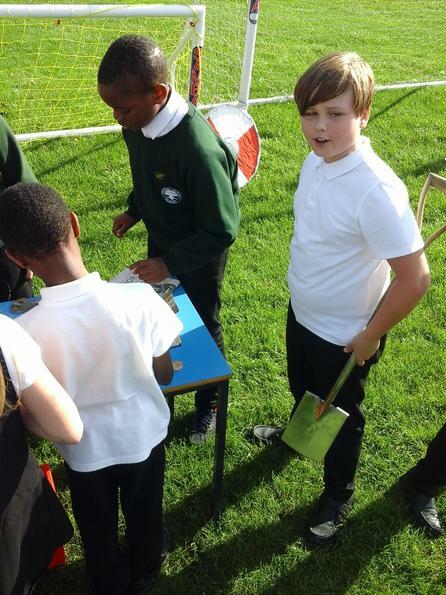 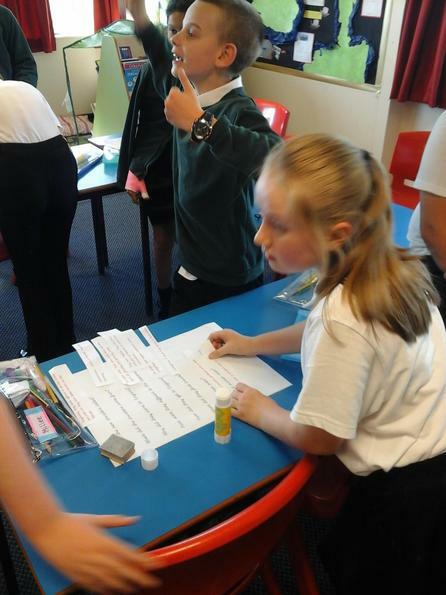 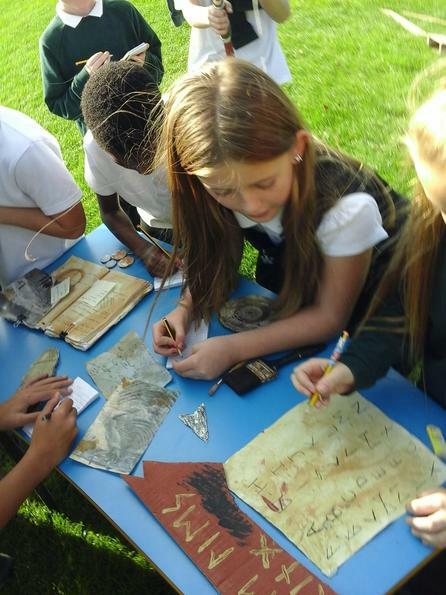 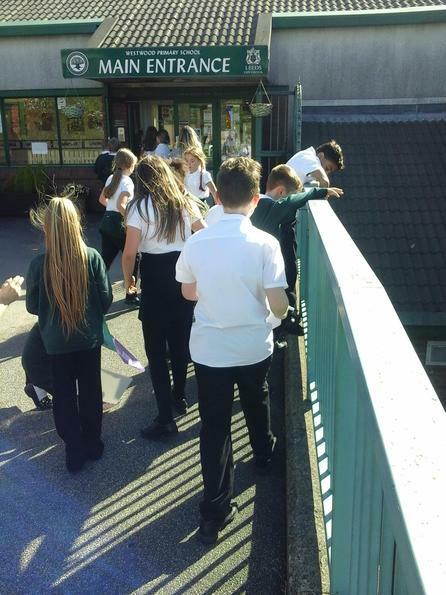 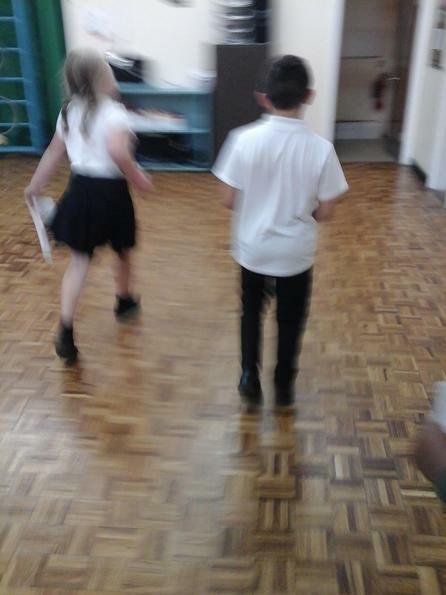 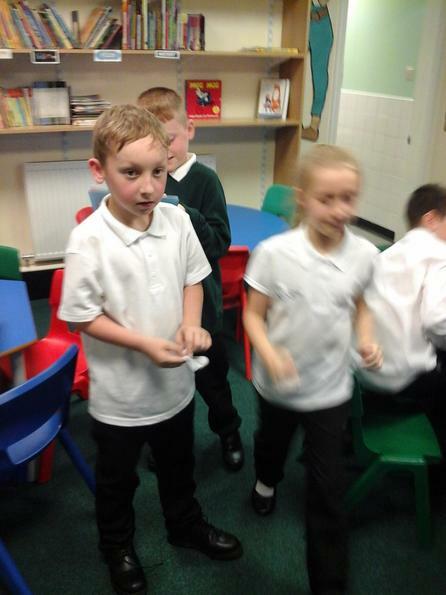 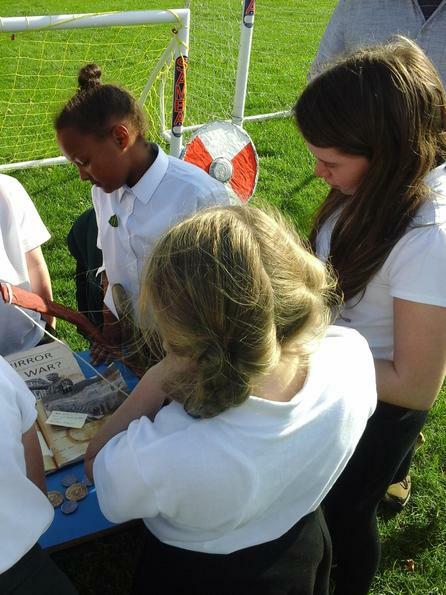 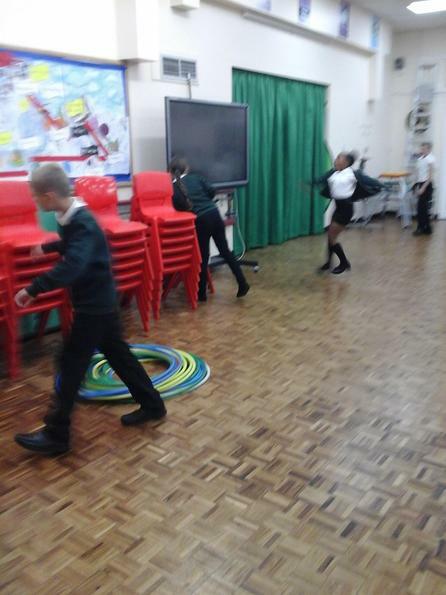 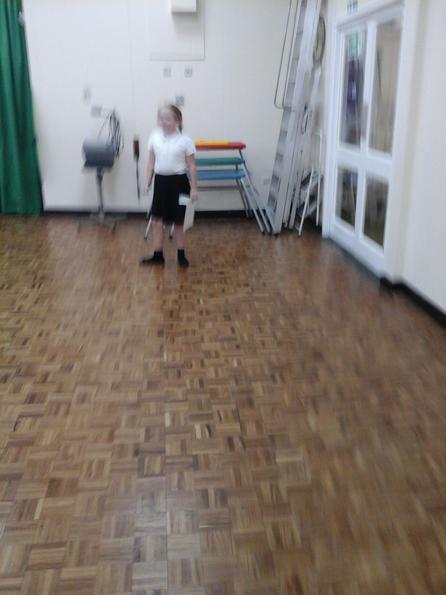 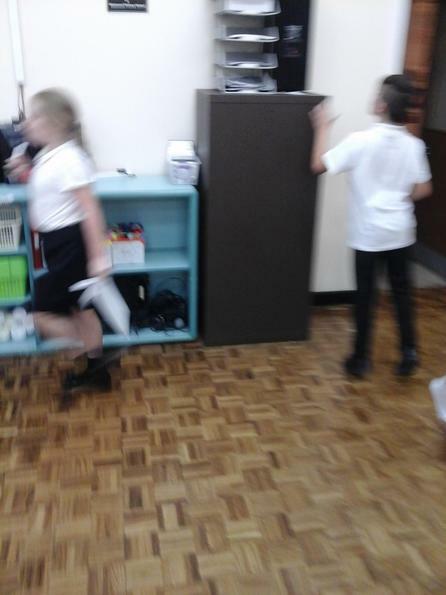 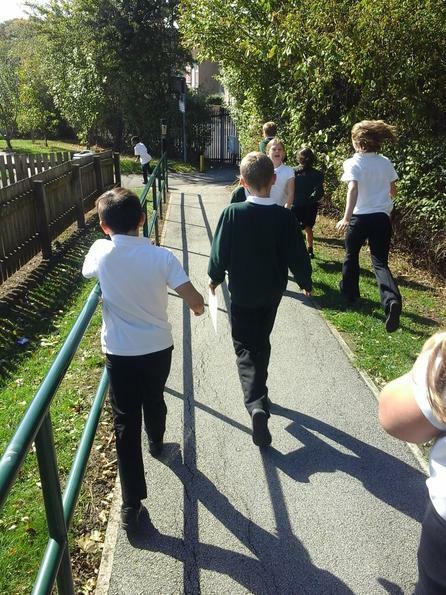 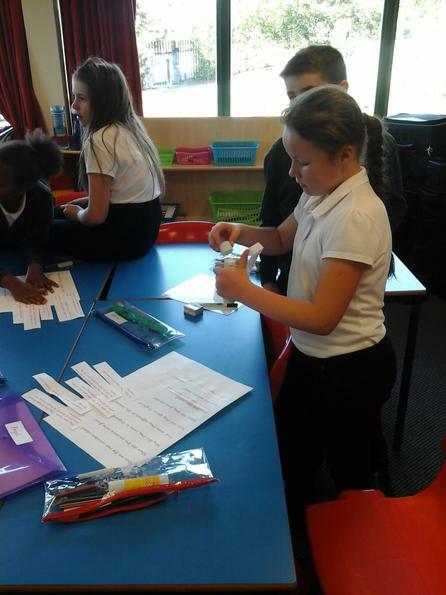 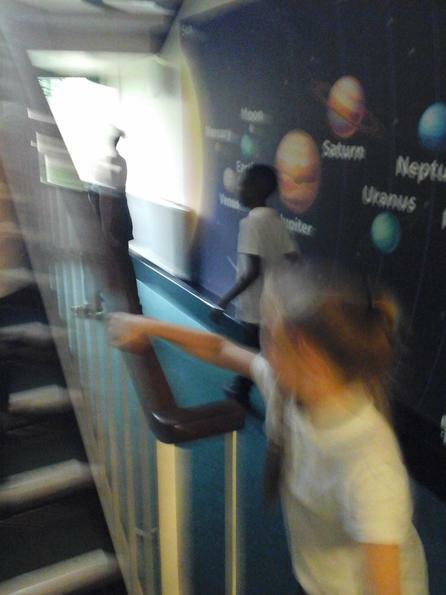 Using all they had gathered, the children had to write their findings down and investigate the artefacts further.